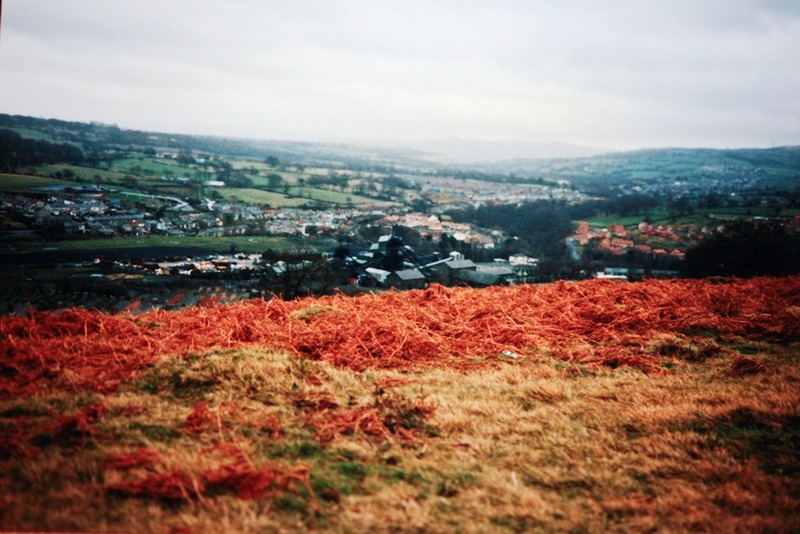 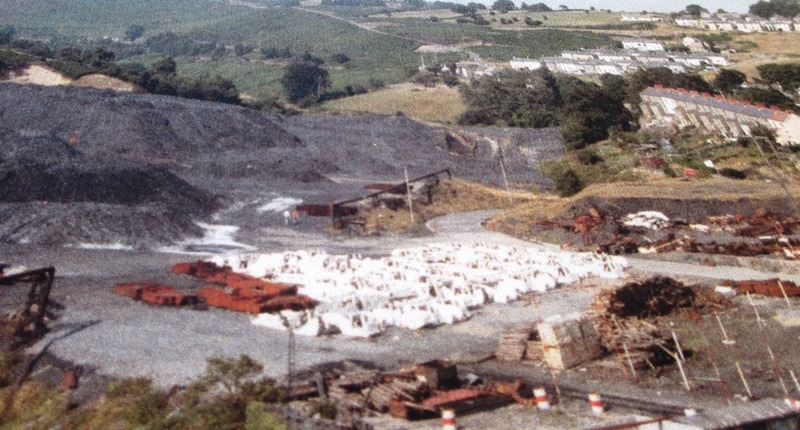 A mineral lease of over 3,000 acres of land, owned by 3 farms, Twyn-y Garreg, Pantanas and Cefn Forest was exploited by a group of businessmen , headed by Frederick. 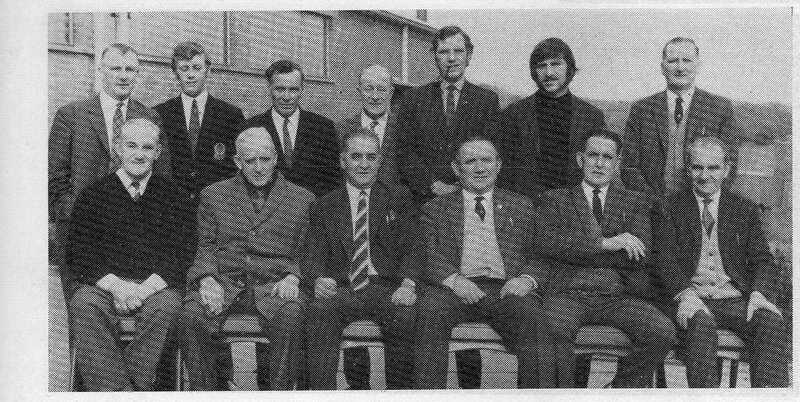 W. Harris, other gentlemen involved at the time included Webster, Hill, Hacket and Jenkins. 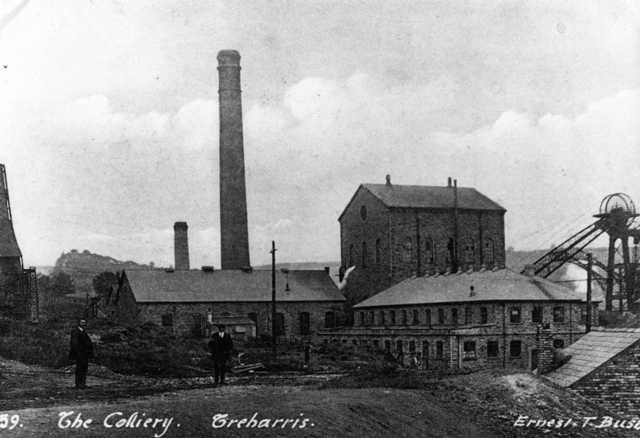 There was no such place as Treharris in those days just a beautiful green valley which was dissected by the small Taff Bargoed river. 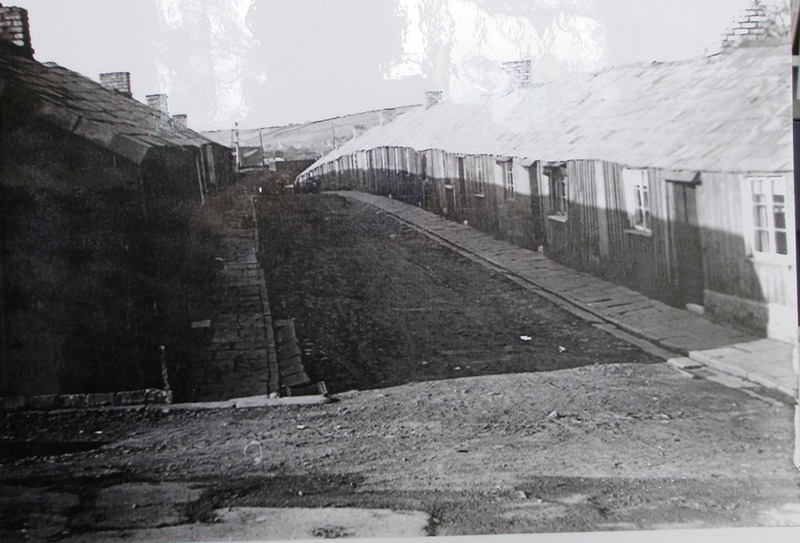 A row of small houses were built for the families and men who were to be employed to sink the pit. 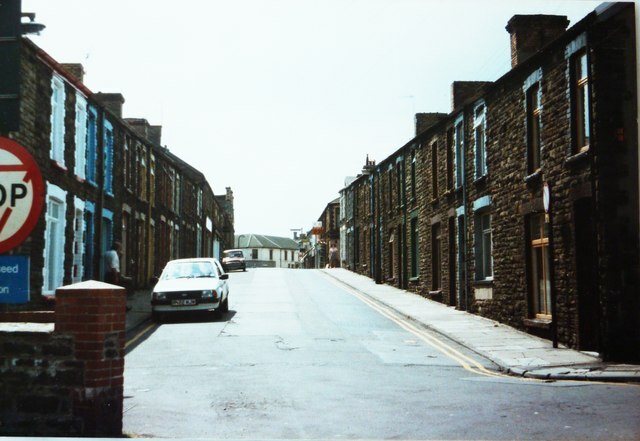 This small street was named the Twyn-y-Garreg huts, they mostly consisted of a kitchen and two bed rooms, although No1 the Huts had four bedrooms, which the Minnett family of 2 adults and ten children occupied. 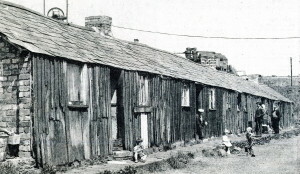 These houses were made of wood and had hessian ceilings which were whitewashed , stone or brick chimney stacks and slate roofs. 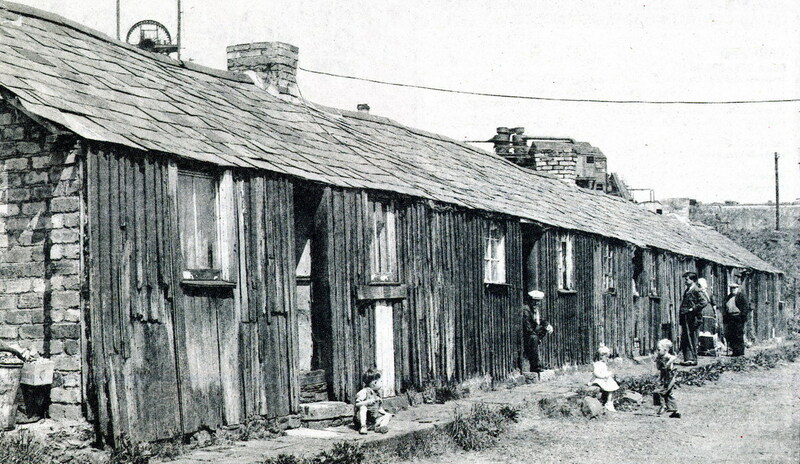 Remarkably these huts survived until the 1950’s when they were finally demolished. A new street is built on the site now, it is called Navigation close. 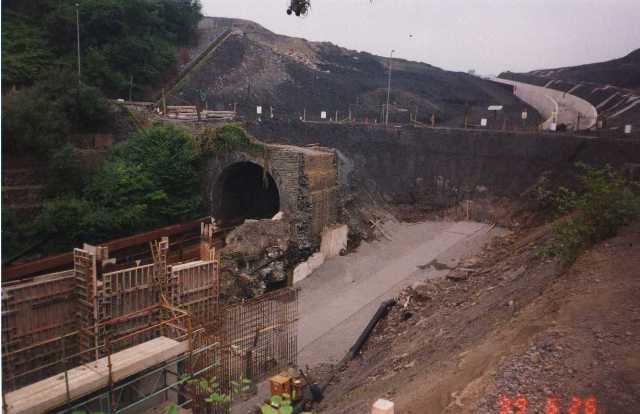 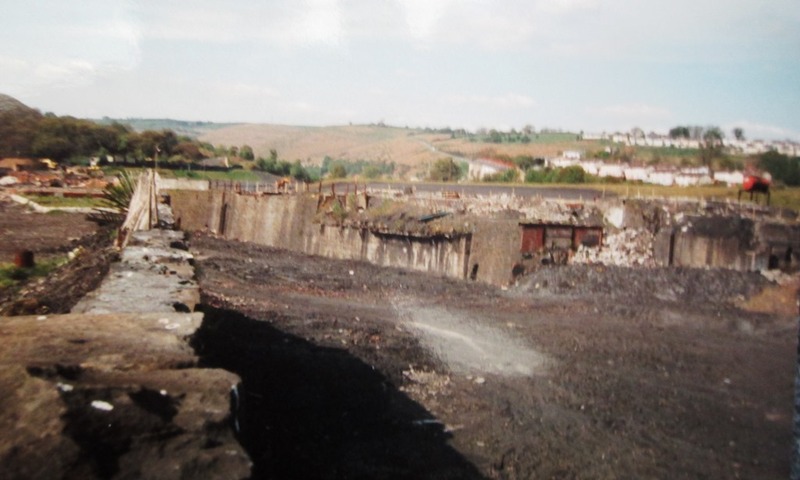 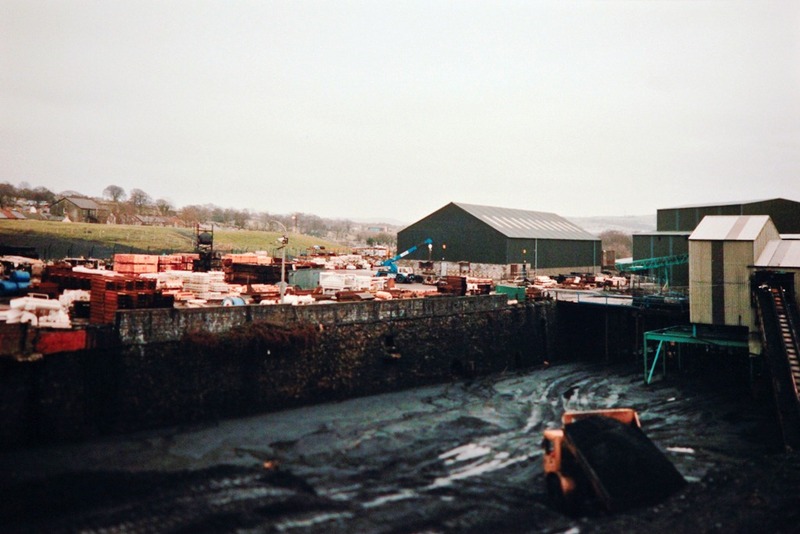 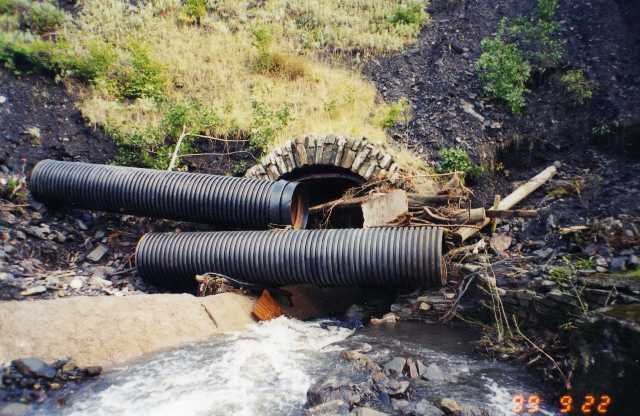 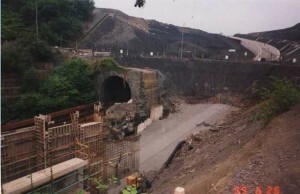 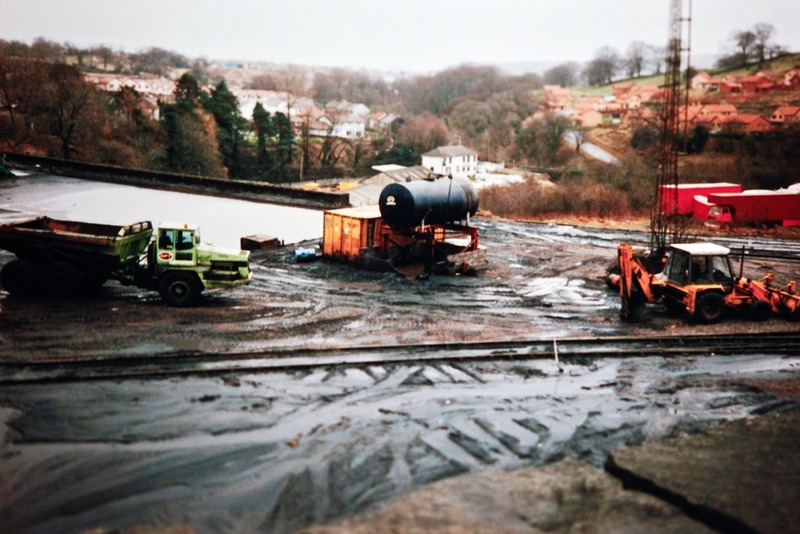 The pictures below are the tunnel that carried the Taff Bargoed river under the surface area of Deep Navigation Colliery…Robert Amos of Nelson took these photographs in 1999, just as they were preparing to raise the river back to the surface and bury the now redundant tunnel forever. 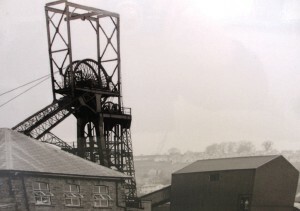 One of the major problems the men encountered was water, due to the great depth of the shafts , they were 200 yards deeper than other south Wales pits and it was reported that over a 1,000 gallons of water was entering the pit every minute. 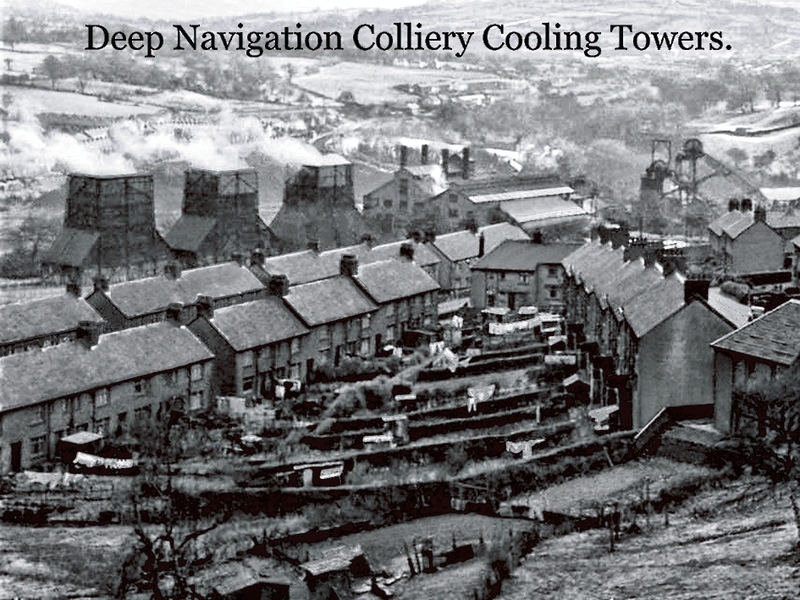 This was not just a problem in 1879 but all through the life of the colliery. 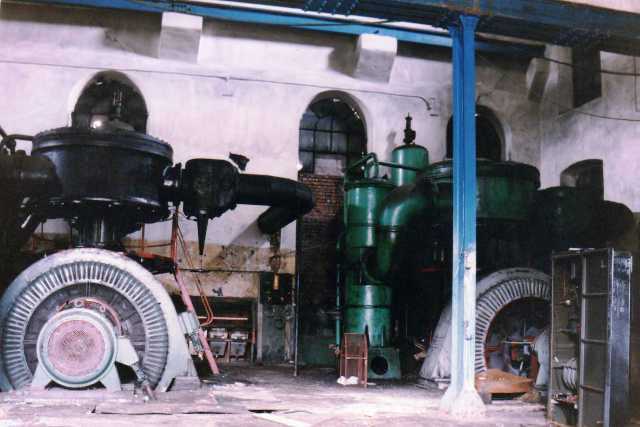 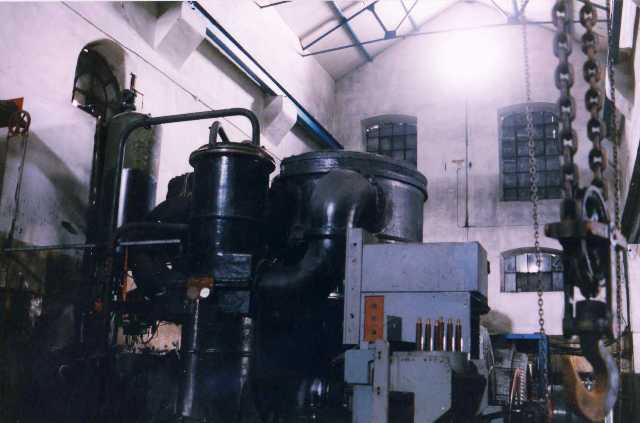 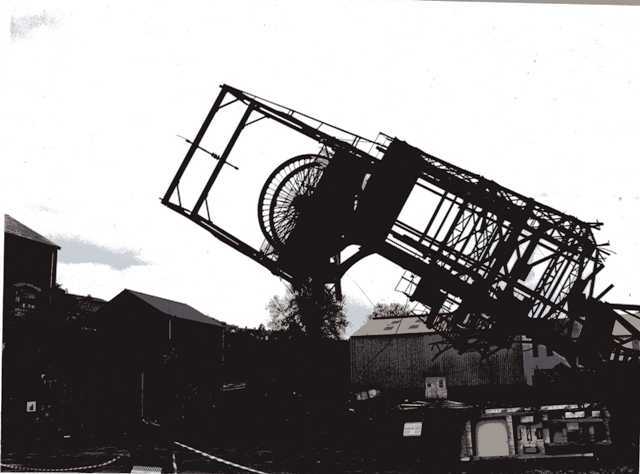 The first thing that was done was to install a Cornish pumping engine, this could remove water at a rate of over 200 gallons a stroke, the water was lifted in stages to different levels until it reached the surface and was dispersed. 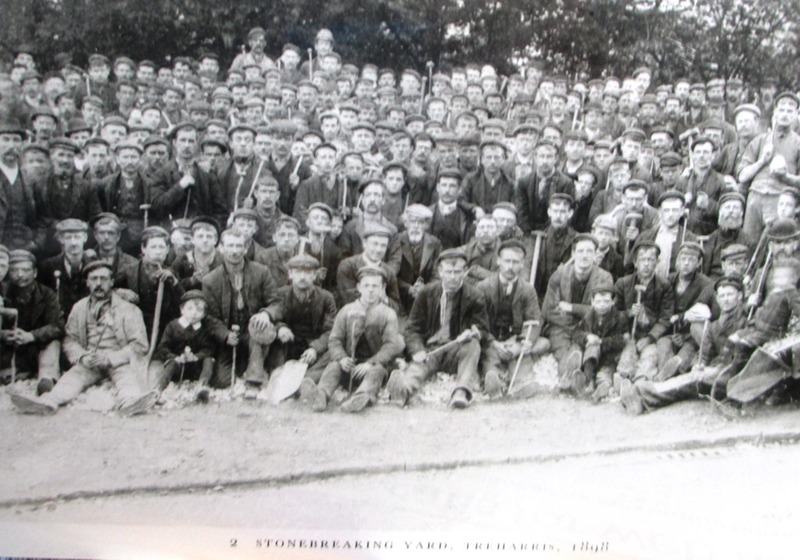 Breaking Stones at Treharris for one shilling (five pence) a day in 1898 During 1898, the Treharris Colliery needed stone to line the floors of the mine and the stones had to be broken up into small pieces, this was a laborious task. 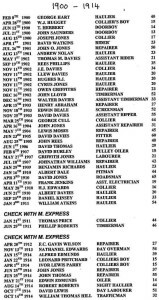 Listed below are the names of some of the men who were hired to break the stones.I found this list in an old mining book and it accredits the research to Mr Arthur Adams of 53 Fell Street Treharris. 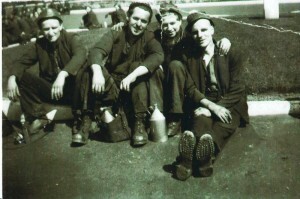 Arthur included the nicknames of some of the men. 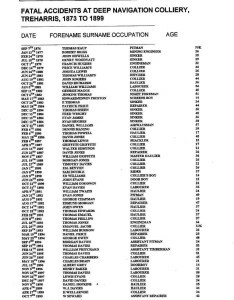 It is an interesting list and no doubt some people still living in the area, may recognise relatives amongst the list. 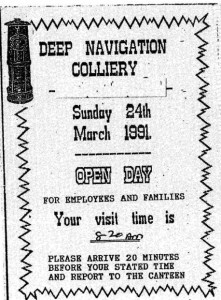 Later in the history of the colliery the famous Deep Navigation “Castle” was caved out of solid rock, part of the way down the shaft. 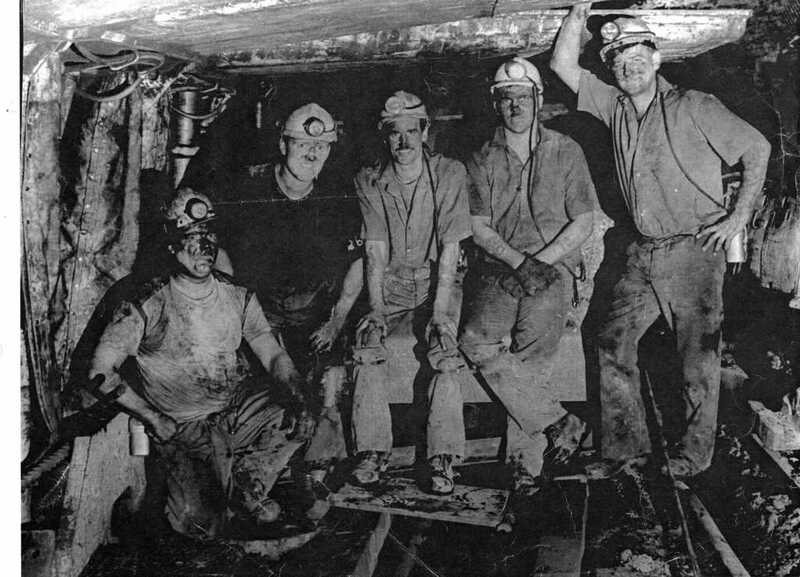 It was a massive cavern approximately 70 yards long ,15 feet high and had a width of nearly 30 yards, a fantastic piece of work headed by a chap called Castell, who the area was later named after. 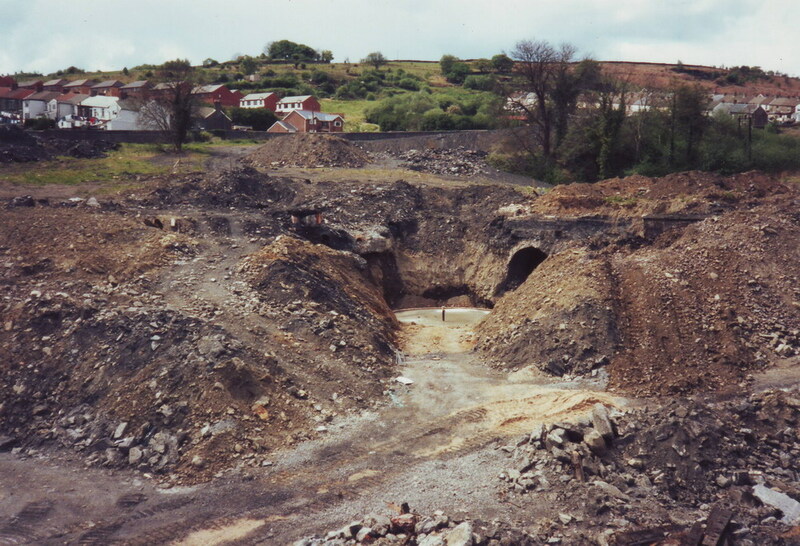 Inside this huge cave was a pump that lifted the water to the Castle area, it was stored there before being pumped to the surface and finally it used to be stored on the surface to the north of the colliery in the pit pond. 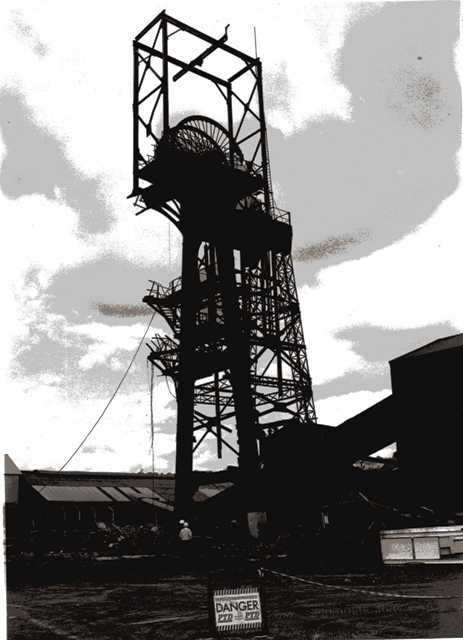 Ocean coal company became interested in the Harris mine as early as 1890, but almost a million tons of coal were raised by 1893, but there was a definite decline in coal production and debts were starting to mount up. 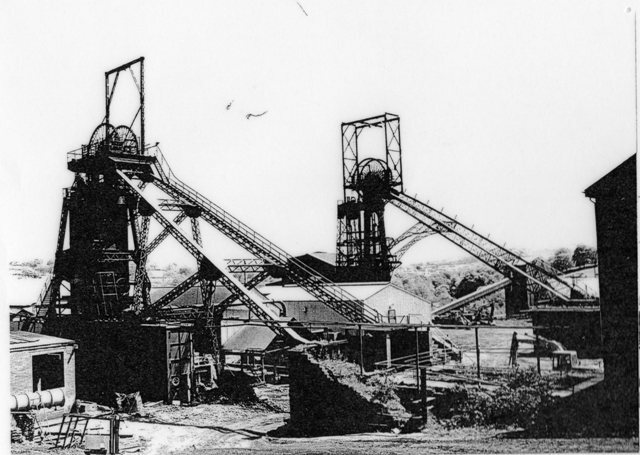 Inspectors were sent to the pit and they reported back saying that there was good coal there and the colliery was in quite a good shape although investment would be needed…on January 17, 1893 Ocean Colliery company took over the colliery on the recommendation of their inspectors. 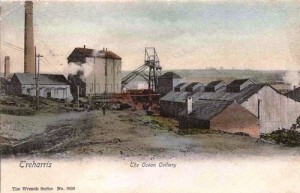 The Ocean coal company invested in the colliery and the bases of the shafts were repaired, there was also a warning to the men from the new owners that discipline had to improve. 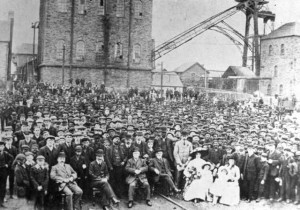 Production significantly increased in the years that followed, 2,500 men were now employed and around 1897 over 590,000 tons were raised in one year At the start of the new century the company wanted to improve production and to modernise the colliery, a lot of money needed to be invested and over half a million pounds was put into this purpose. 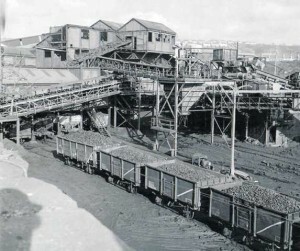 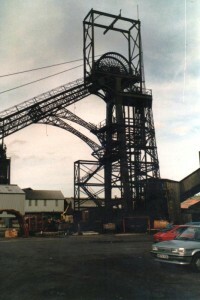 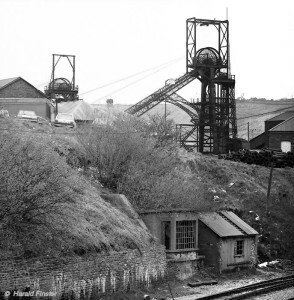 It made the colliery more economical and coal was produced quicker with less manpower, The men were paid an average of £1.50p a week, or 30 shillings in those days, a report from 1902 stated that the colliery was now producing an annual output of 327,000 gross Tons, this was being achieved by approximately 2,000 men. The report also mentioned the fact that over 100 horses were now being used at the colliery, mostly underground, but some were used on the surface. 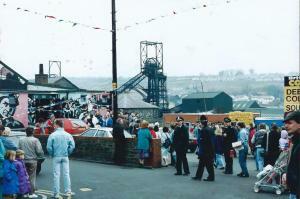 The horses were very well looked after by the miners. Ostlers were in charge of the horses and they groomed, fed, and stabled their horses with great care and pride. 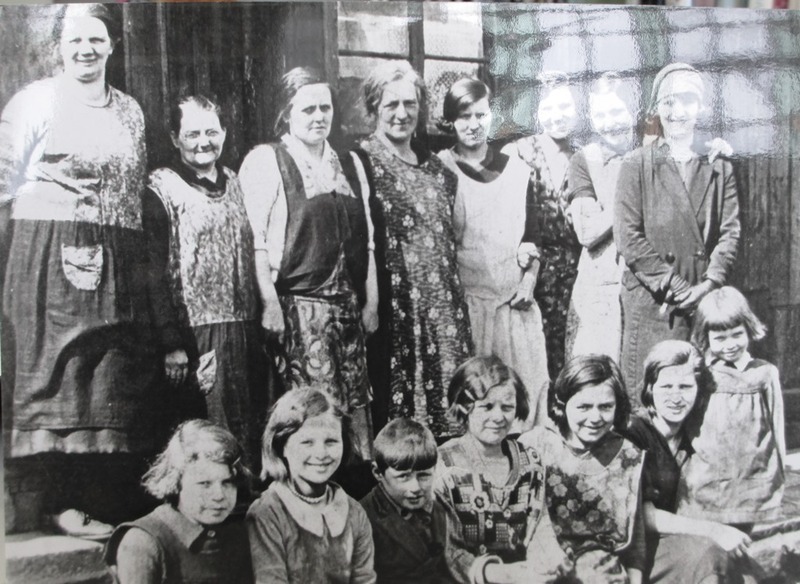 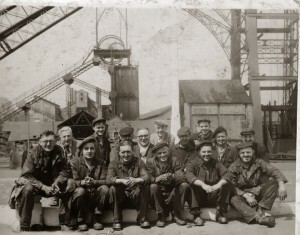 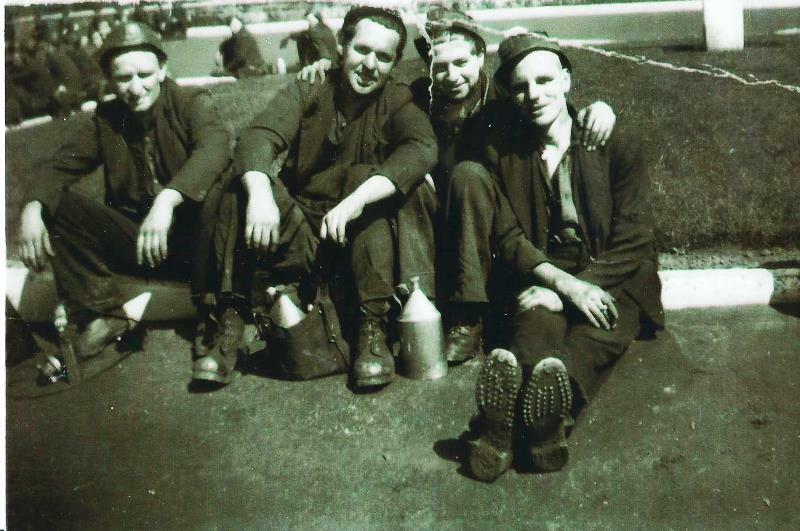 Just like the vast majority of other collieries in Wales, the working conditions for the men was hazardous, many of the women in the community worried that their husbands or sons would come home injured or even worse get killed in the colliery. Wages were not great either and strikes were starting to occur at Deep Navigation on a regular basis. 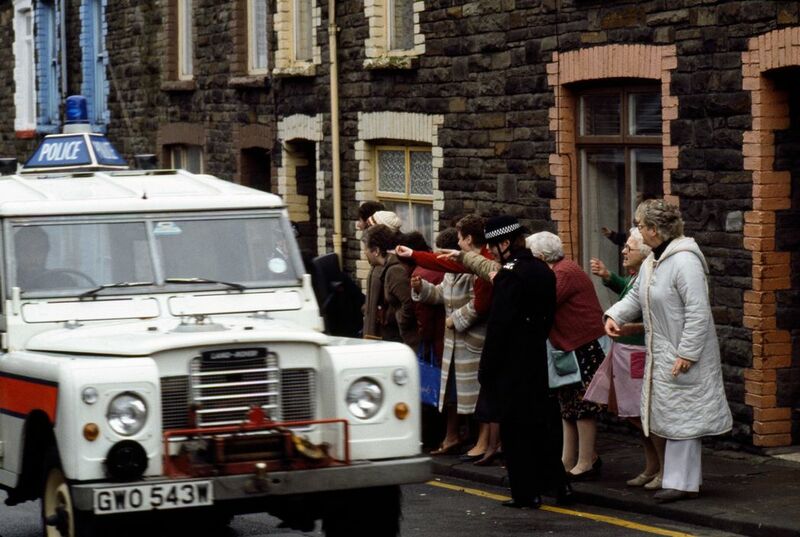 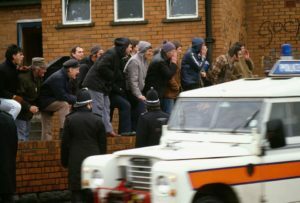 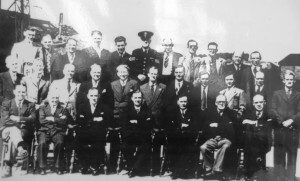 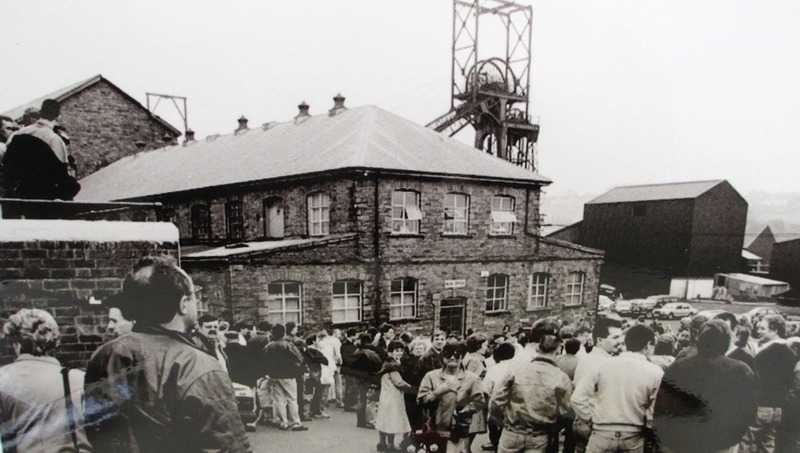 The police and soldiers were brought in to control the striking miners who were often locked out of the colliery, hardship normally meant the striking miners had no choice other than to return to work with no increase in pay. In 1898 the south Wales miners Federation was formed, just two years later the borough of Merthyr Tydfil, which Treharris is part of, saw the election to parliament of Keir Hardy, a working class Labour MP. 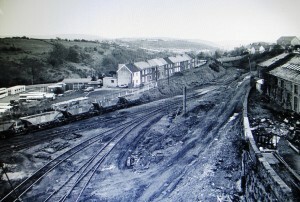 Within 5 years the Federation had made some inroads in getting better wages for the miners and they were also negotiating for safer and better working conditions for the men, but despite these improvements by 1910 most Welsh pits were on strike and the infamous Tonypandy riots were to follow. 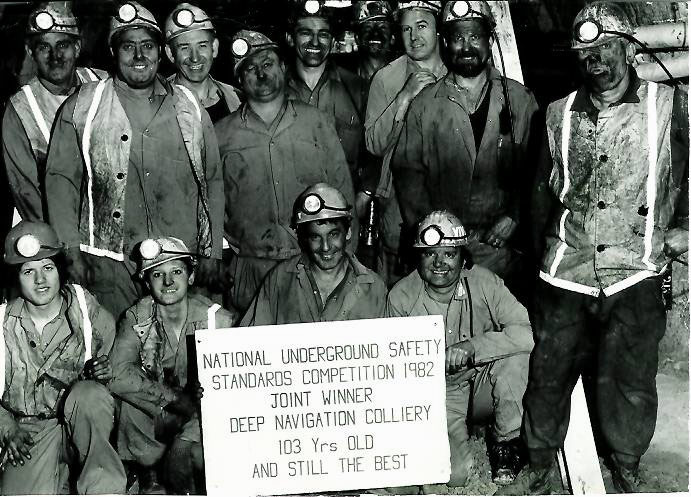 For two difficult years the Federation fought hard to get a good deal for the miners but to no avail. 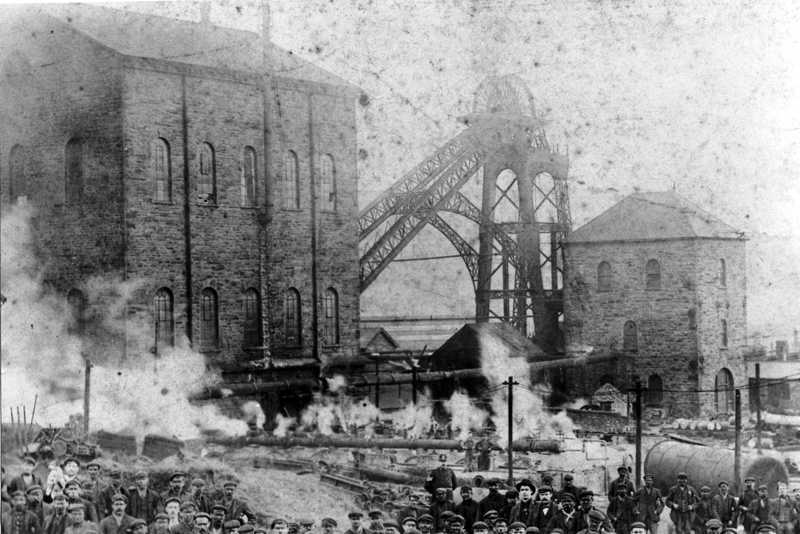 There was more trouble in 1912 and again the police were at the pit as the great strike began. 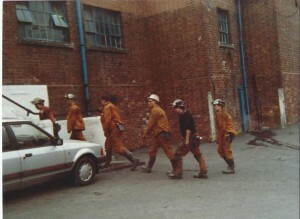 Finally a decent wage was agreed and the men went back to work. 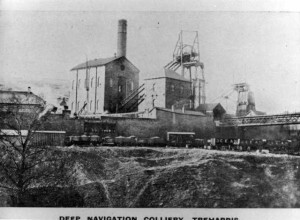 For the following Years and through the great war and beyond and once again in 1921, there was a lock out of the men at Deep Navigation. 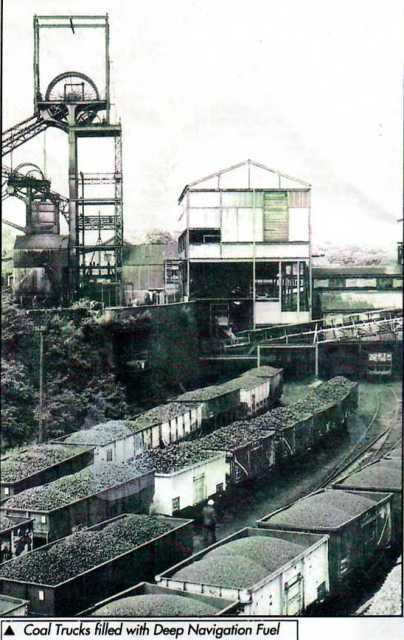 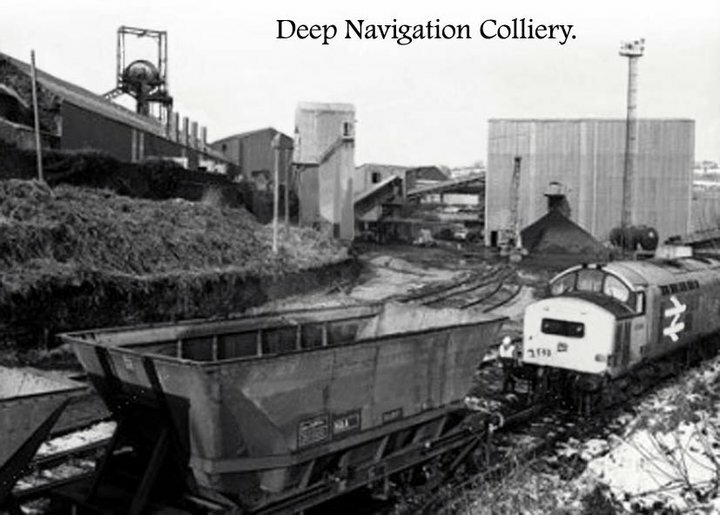 Just before the first world war, the coal produced at the Deep Navigation colliery was being hailed as being the best for steam navigation and was use on railways. The most rapid Atlantic crossings made by the famous Cunard liners at the time used coal that was mined at the Treharris colliery. 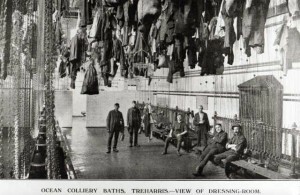 During the war in 1916, the first pit head baths in south Wales were built on the colliery site, that meant the men could clean up at the colliery rather than having to go home and bathe in front of a fire in a tin bath 1n 1926 the general strike hit the country and it was to have a devastating effect on the Treharris miners. Nationalisation was seen as a good thing and changes were made by the new NCB (National coal board) Managers and bosses were switched between collieries and strangers were seen running Deep Navigation for the first time. 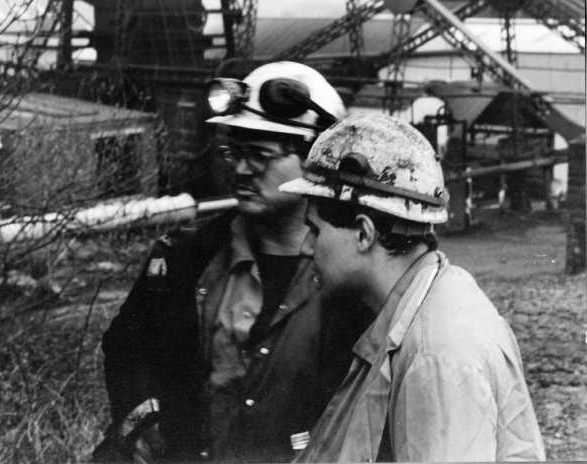 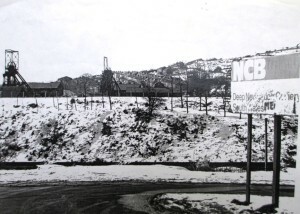 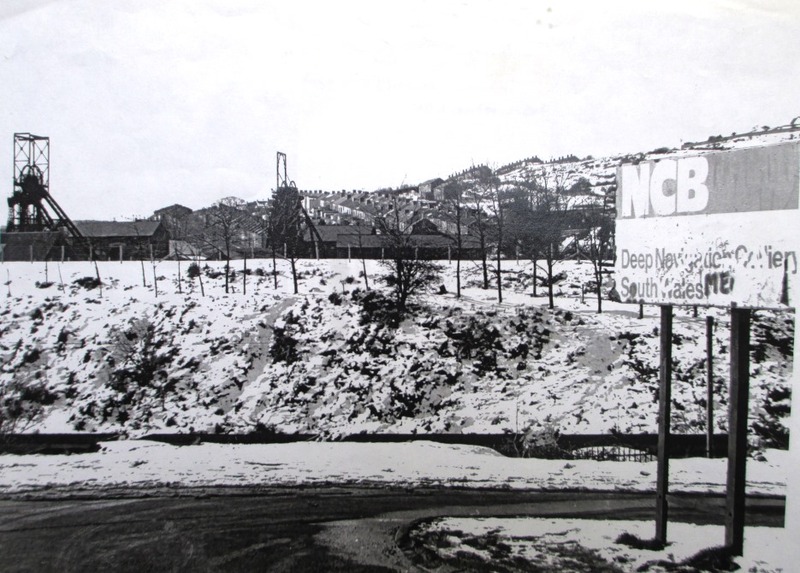 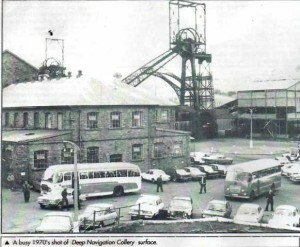 The good relationship between the union and NCB, added to the fact there was a labour government boded well with the miners but there would always be the undercurrent of industrial action at the colliery for the rest of its working life. 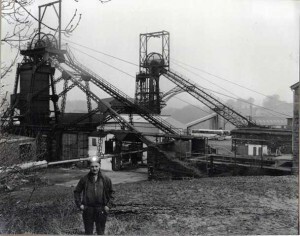 Due to Modernisation and new mining methods the man power at the colliery dropped from the pre war 2,200 to almost half that figure by 1960. The terrible disaster of 1966 at Aberfan, so the men of the colliery travel up the valley to help in the fight to save lives, coal tips were a sad legacy and blight on the landscapes of the south Wales valleys, these tips four miles from Treharris, the waste from the Merthyr Vale colliery, land sliding down on top of Pant gals school, caused a disaster of the highest order, and so many children lost their lives, another tragic price of coal. 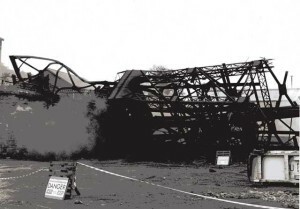 144 people were killed in the disaster,116 of the dead were children between the ages of 7 and 10 years old. 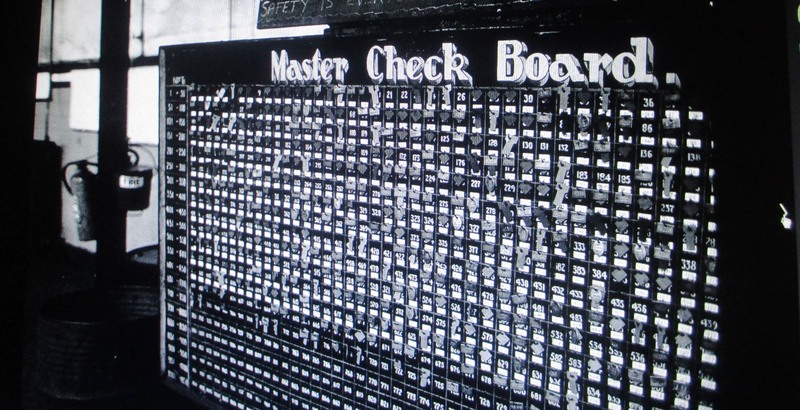 Checks shown are a small part of the large collection of miners checks owned by Robert Amos of Nelson. 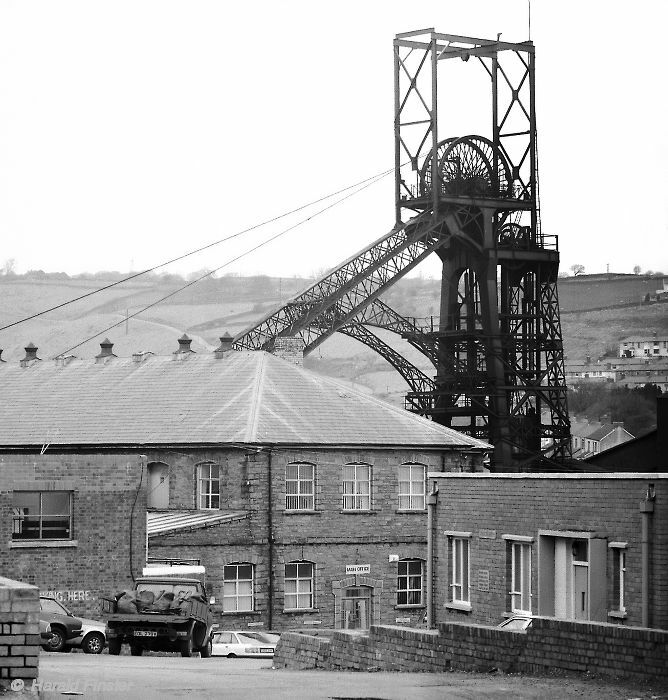 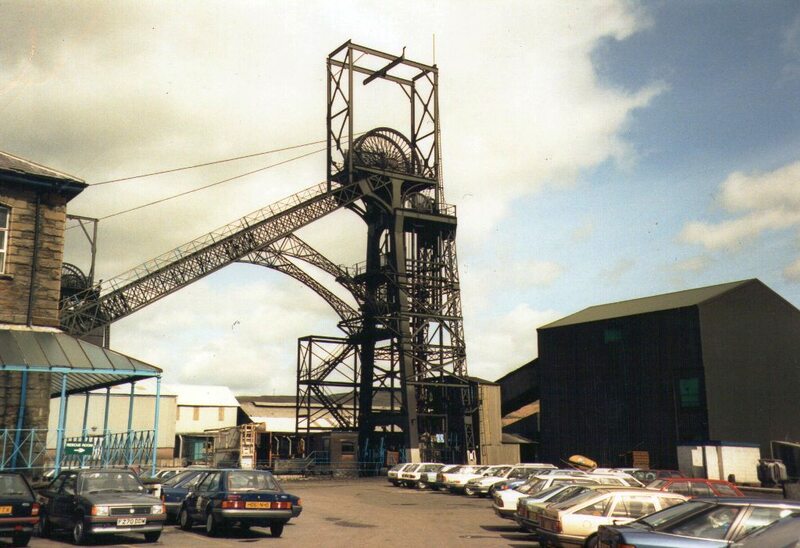 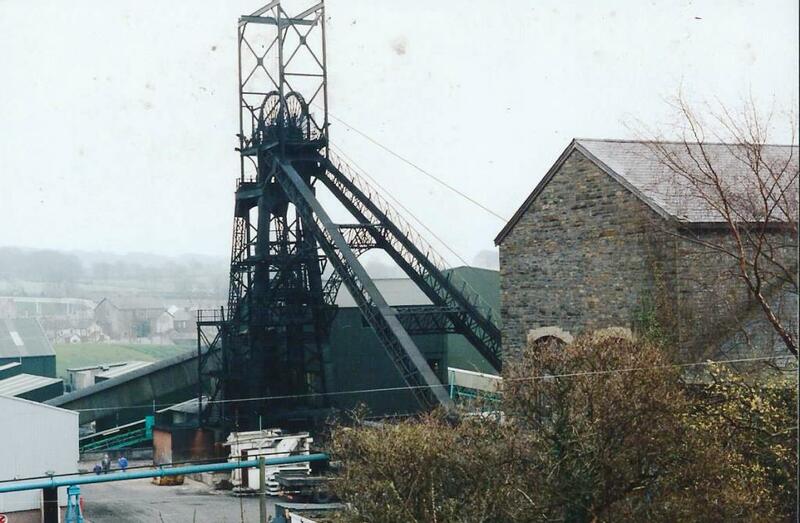 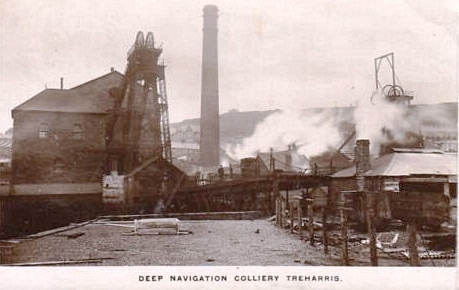 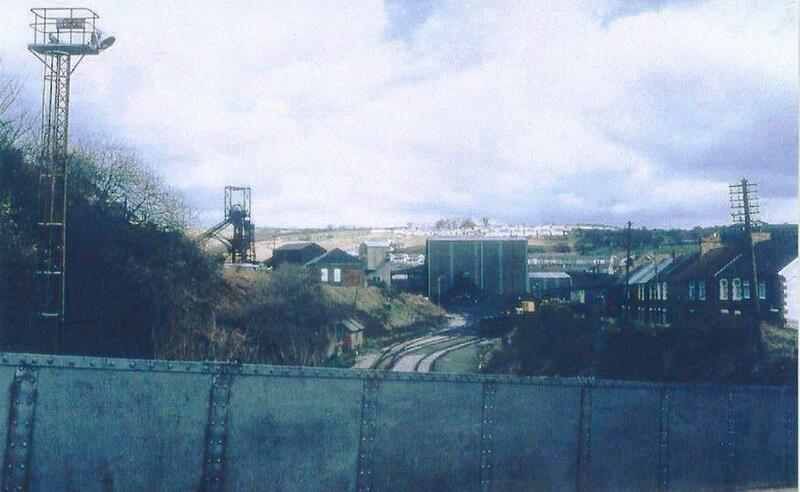 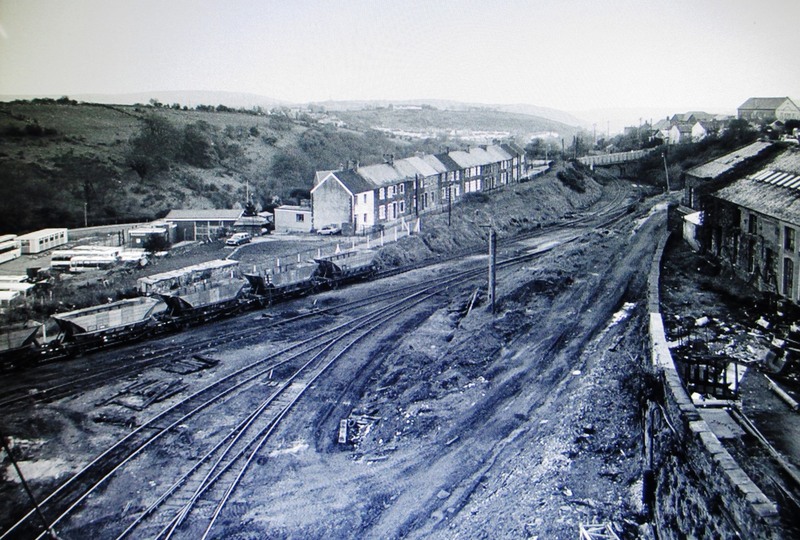 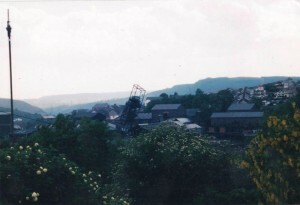 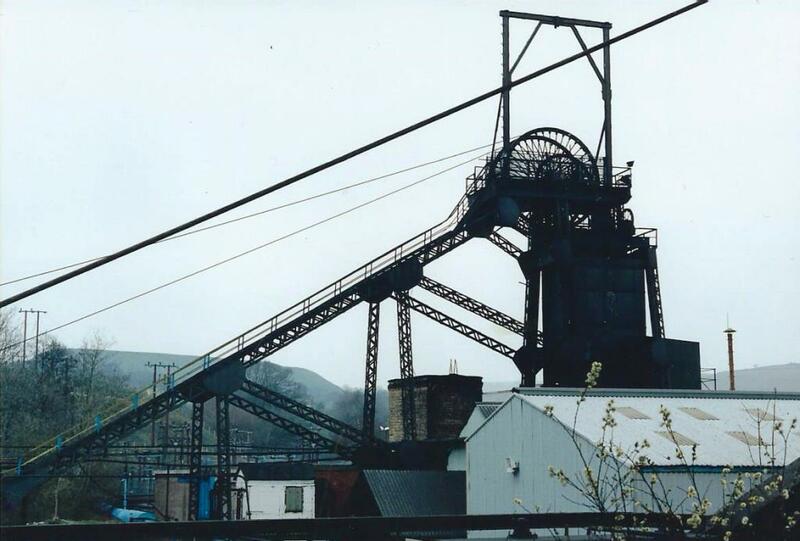 100 years had passed and the Deep Navigation colliery remained the centre of employment for the Treharris area, so many miners and businesses relied on the pit. 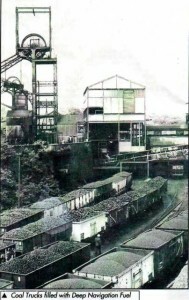 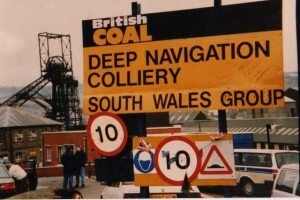 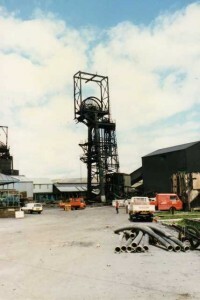 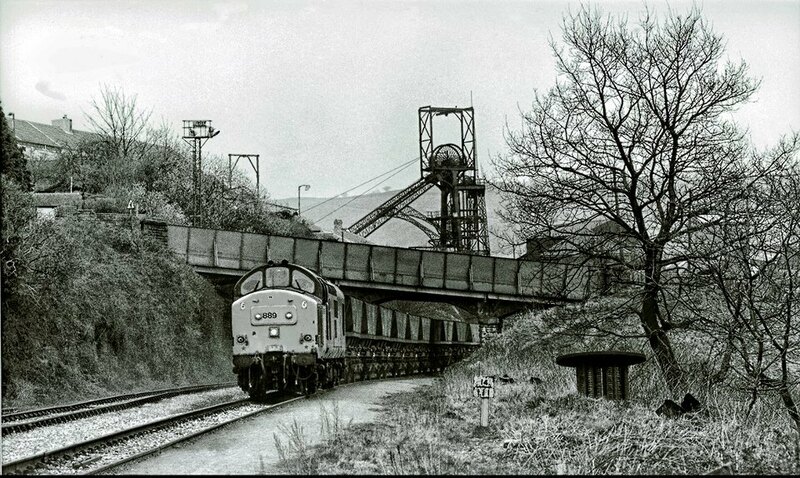 British coal (In1987 the NCB became the British Coal Corporation.) 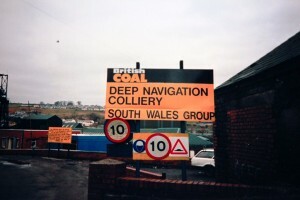 officials were reported as saying that Deep Navi was one of the most productive of all it’s collieries in Wales. At this time almost 8,500 Tonnes was being produced, with most of the coal being used at Aberthaw power station in the vale of Glamorgan. 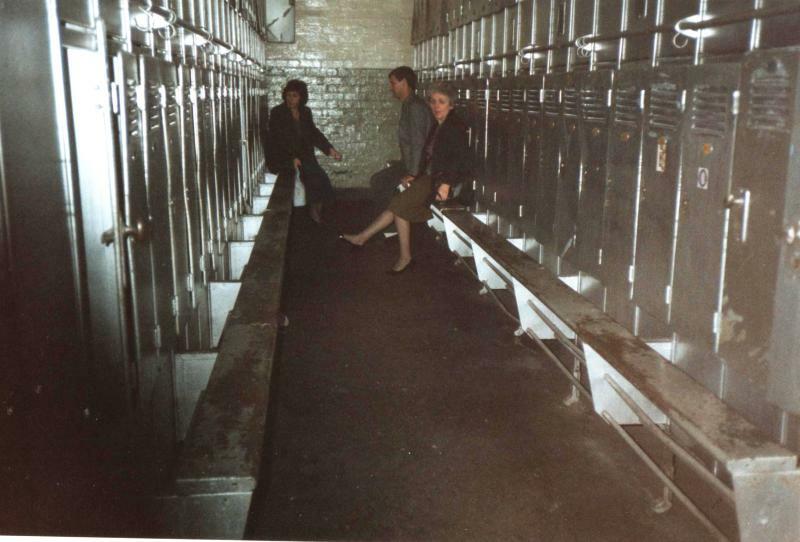 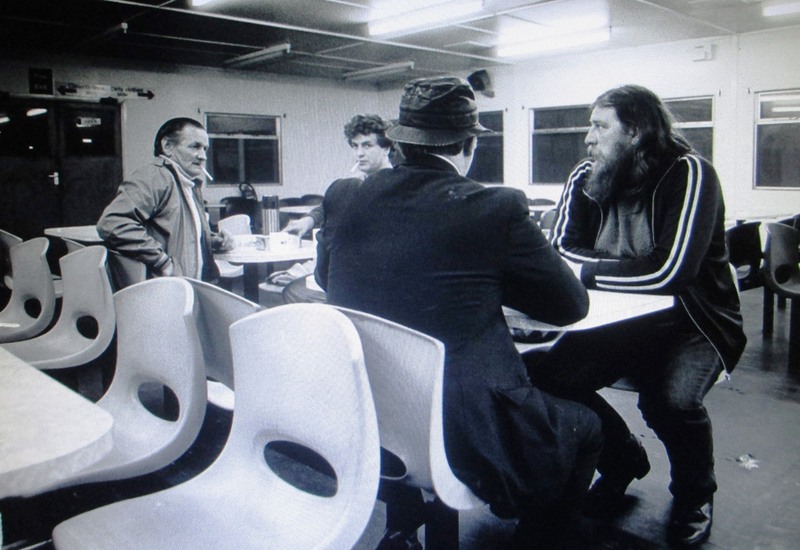 1982 saw the construction of a brand new canteen on the colliery site, it cost around £75,000, with £23,000 being spent on Kitchen equipment, it was seen as another sign of confidence in the pit.. Better news again came in 1983, a massive £6 million was said to be invested into the colliery, this money meant that a new high speed system could be installed which enabled coal to be raised quicker. At this time it was estimated that there was still approximately 11 million tons of coal reserves accessible to the Treharris mine. There were new coal seams, 2,500 feet underground which could be developed, it was estimated that these new “Gellideg” seams would guarantee that the colliery could operate in profit for at least another 20 years. 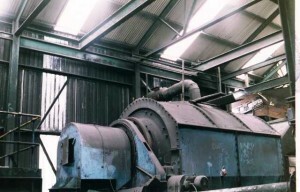 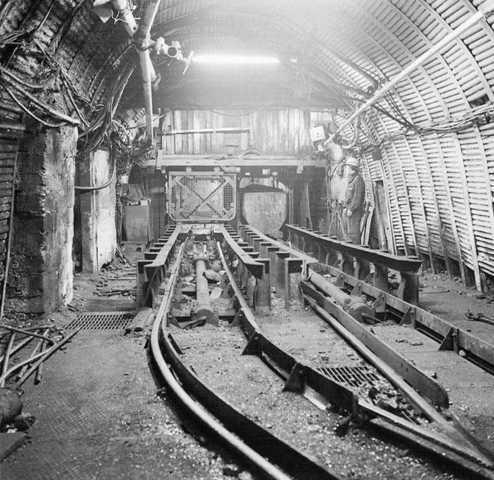 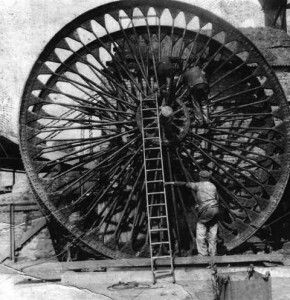 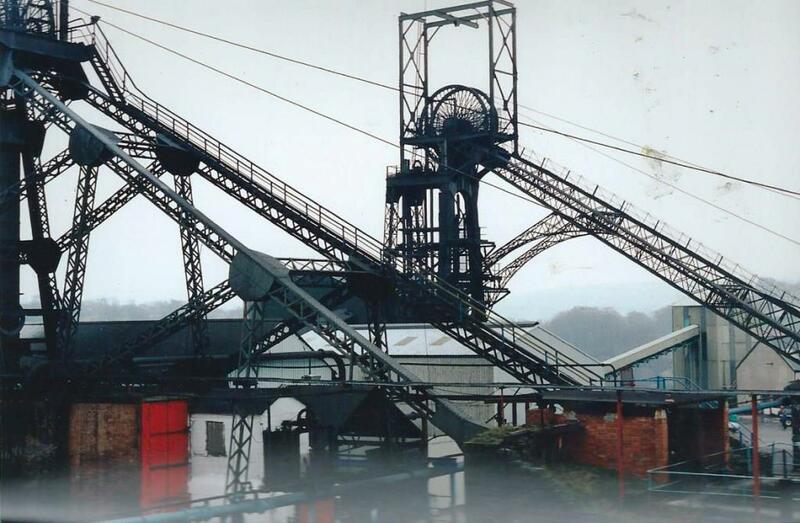 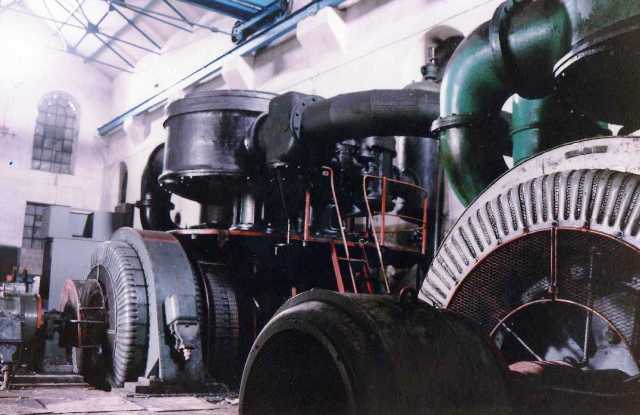 It was planned to invest money in the best technology for the new coal face, a double sided shearer which saved time was to be used also the coal was to be transported to the surface by a rapid skip winding system. 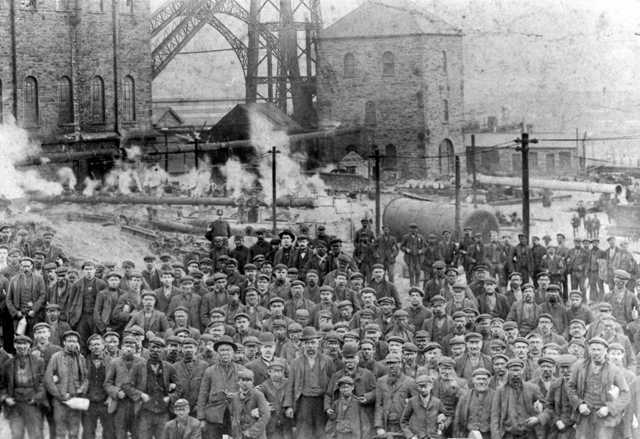 Everything really did look good once again and optimism was the order of the day, little did the miners know at the time, but the most bitter industrial strike in history was just around the corner and the government were determined not to be defeated again by the miners, it would prove to be the beginning of the end for Deep Navigation and indeed the collieries of south Wales. 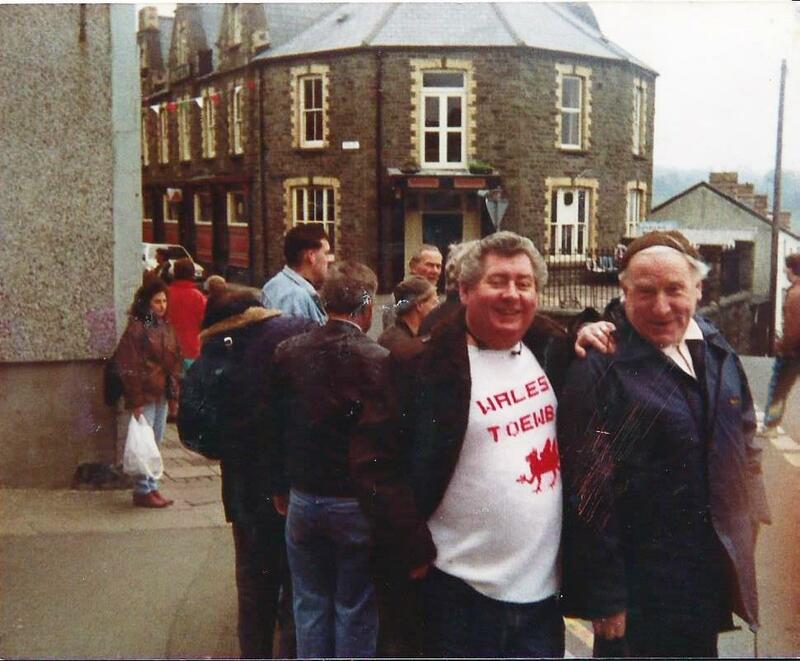 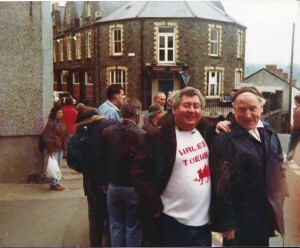 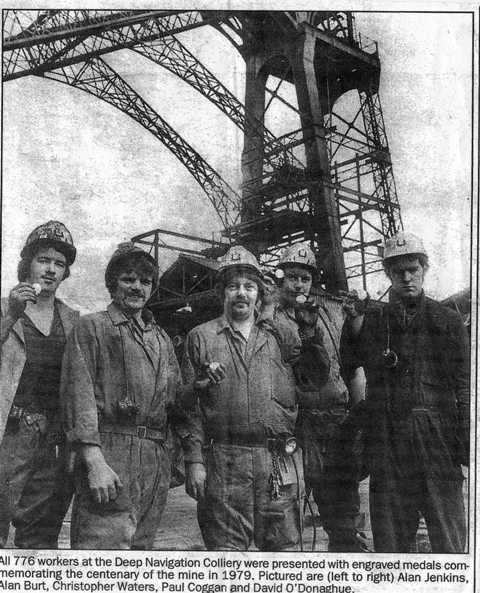 The 1984-85 Miners Strike Miners from Treharris pit in South Wales who have been striking for 10 months. 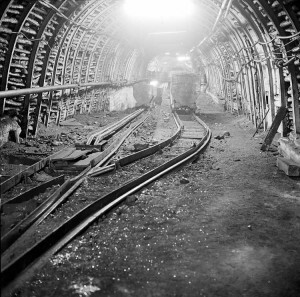 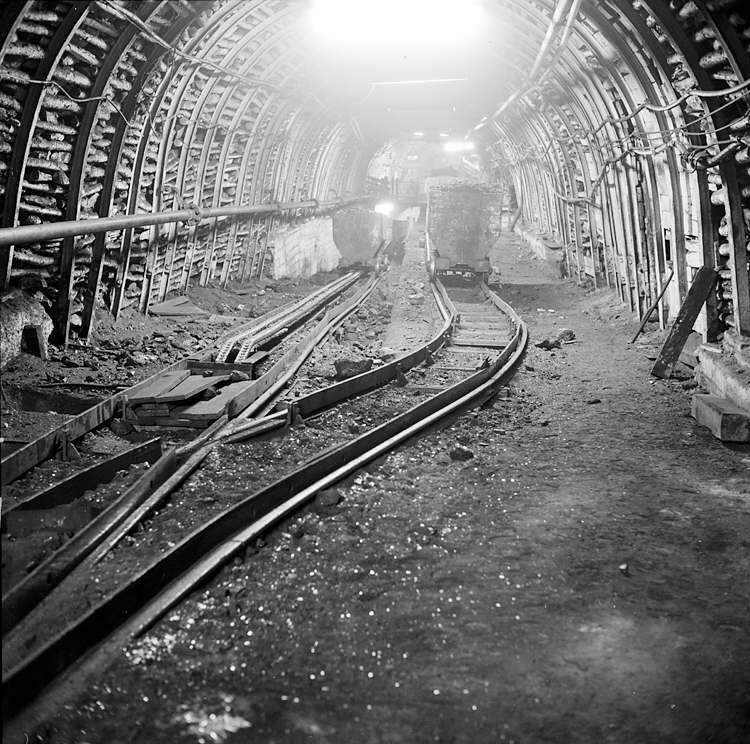 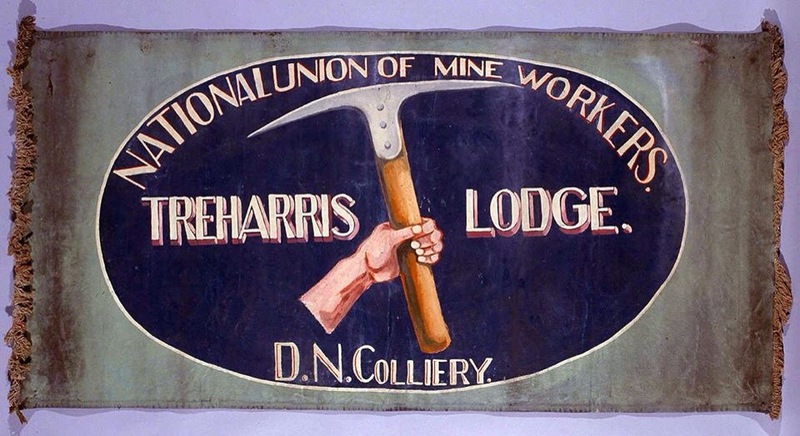 The strike was led by the National Union of Mineworkers, Coal mining, though nationalized in Britain by Clement Attlee’s Labour government in 1947, was encouraged to gear itself toward reduced subsidies in the 1980s following the 1979 election of Prime Minister Margaret Thatcher. 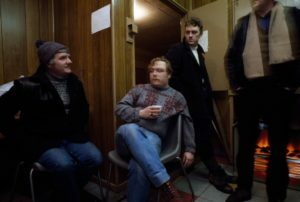 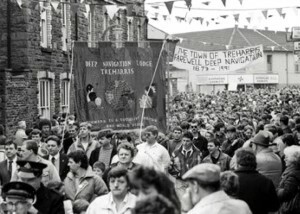 Tensions between the Thatcher government and the public unions mounted as the administration considered the NUM to interfere with the market, risking public inflation. 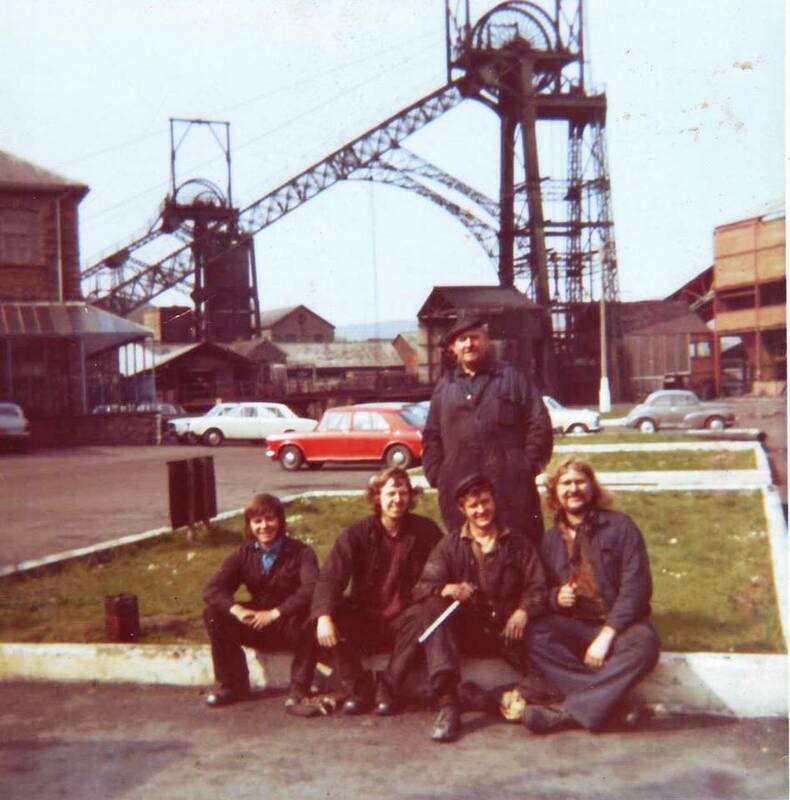 Two million manufacturing jobs were lost between 1979 and 1981, which some ascribe to Thatcherian policies, and others see as the inevitable result of decades of nationalization of unproductive industries in the face of rising competition from lower cost producers. 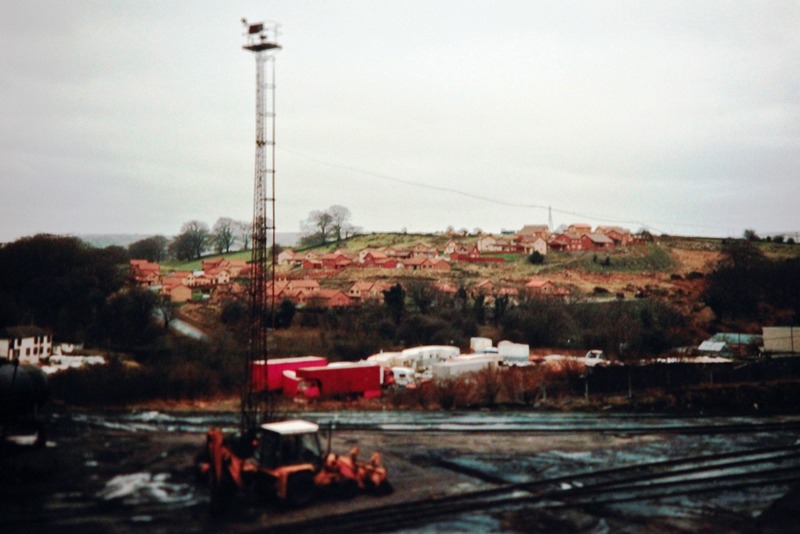 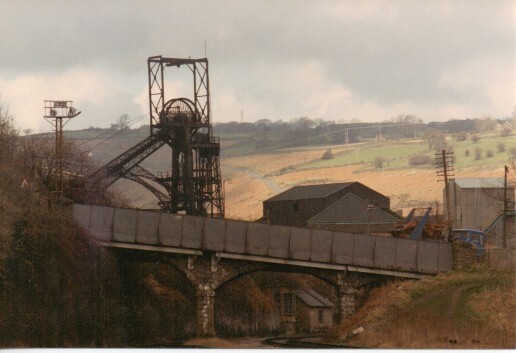 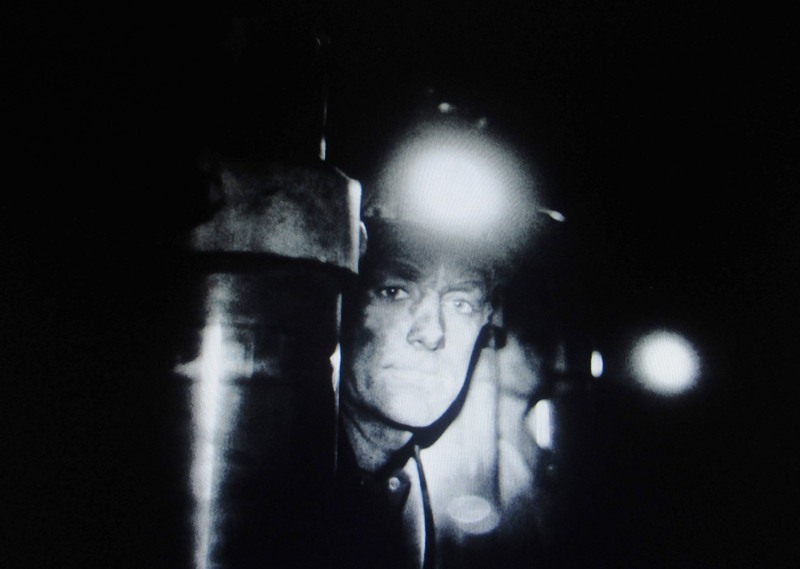 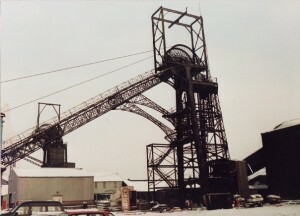 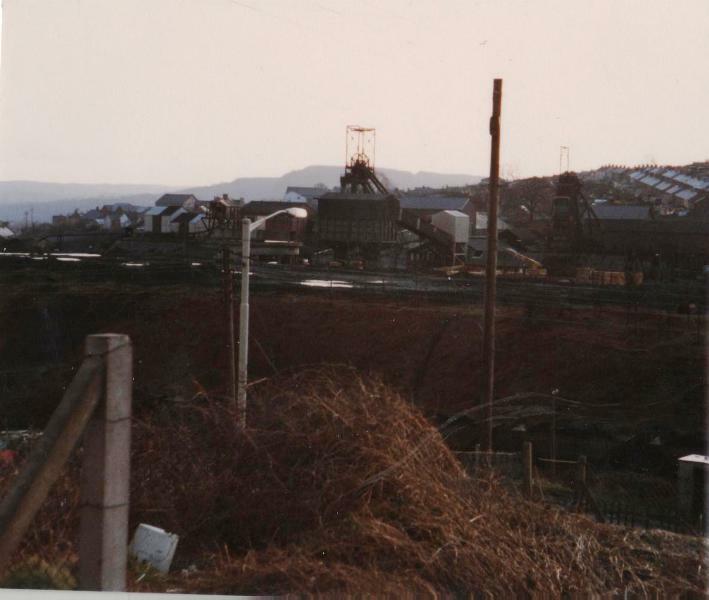 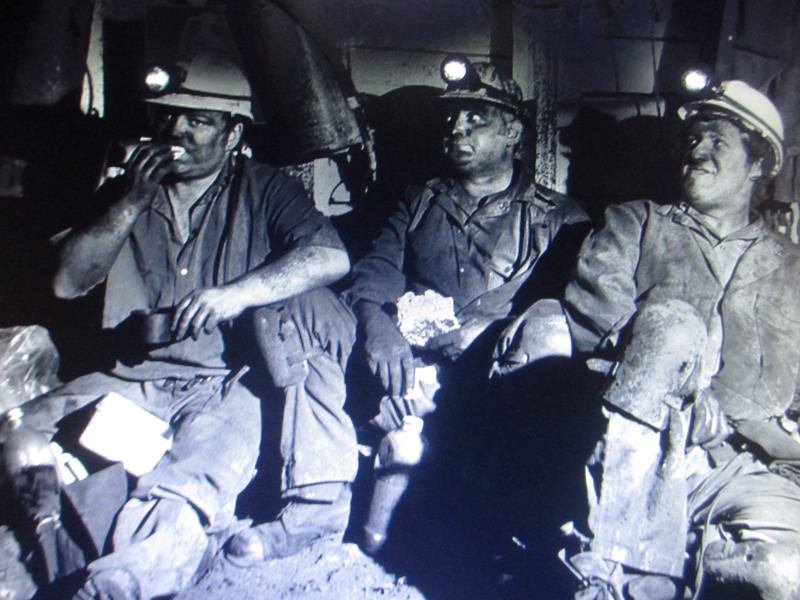 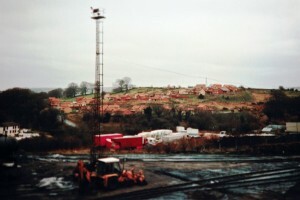 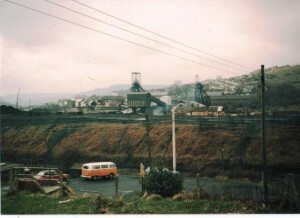 Following a narrowly averted strike in 1981, the government announced in 6 March 1984 their intention to close 20 coal mines, revealing as well the plan in the long-term to close over 70 pits. 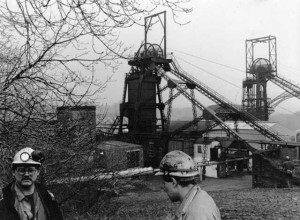 Mass walk-outs and strikes began following this revelation in March, including the widely reported Battle of Orgreave between 5,000 miners and 5,000 police officers. 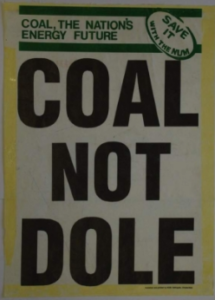 The strike ended on 3 March 1985 following a NUM vote to return to work. It was a defining moment in British industrial relations, and its defeat significantly weakened the British trade union movement. 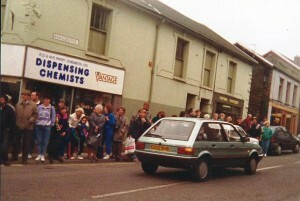 It was also seen as a major political victory for Margaret Thatcher and the Conservative Party. 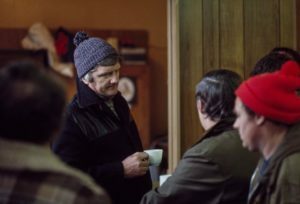 The strike became a symbolic struggle, as the National Union of Mineworkers (NUM) was one of the strongest unions in the country, viewed by many, including Conservatives in power, as having brought down the Heath government in the union’s 1974 strike. 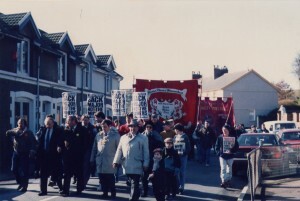 The 1984-1985 strike could not match the force of earlier strikes in the 1970s. 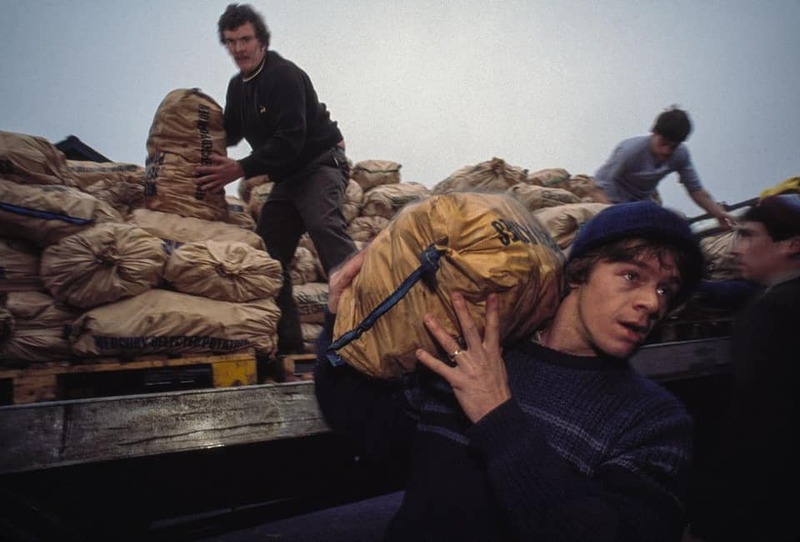 The people of the UK donated food to the miners here we see Clive Buster Williams help unload a lorry full of potatoes. 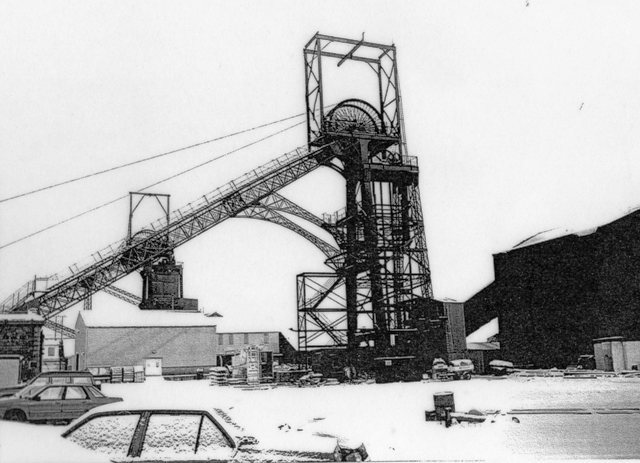 Following the hardship of the 1984-85 strike the men got back to producing coal and in 1986 another £2 million was invested in the colliery by British coal. 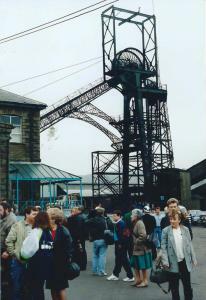 Once again the colliery was making a profit and coal production was rising. 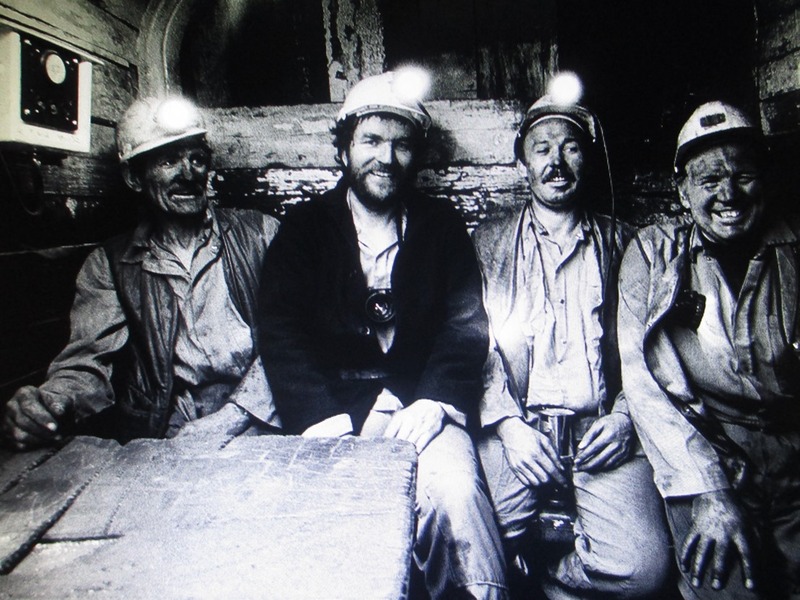 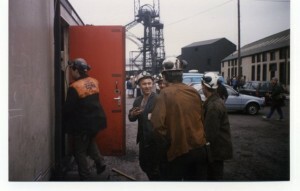 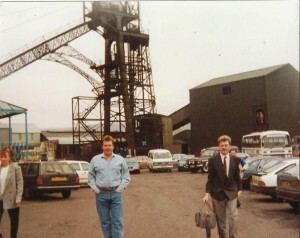 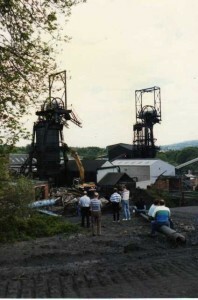 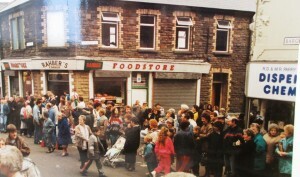 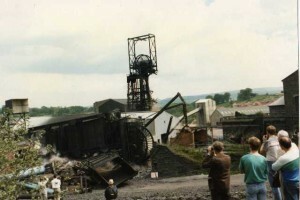 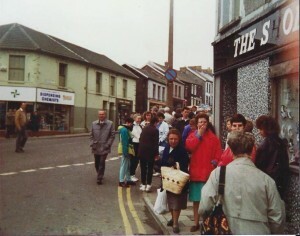 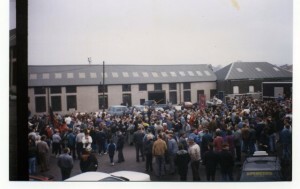 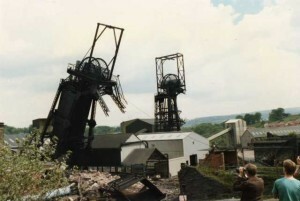 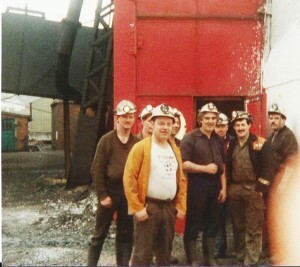 1987 and once again the men found themselves on strike, this time in dispute over the new technology at the new coalface, the strike cost British coal around £150,000. 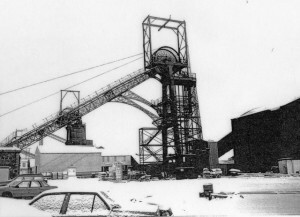 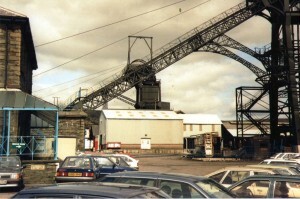 There was more investment in the colliery but targets started to get disappointing, British coal said that they were expecting at least 5,000 more tonnes production a week from the mine, on top of this the miners were unhappy and another strike took place in the November of that year, a week long strike which was said to have lost 100,000 tonnes of coal production, British coal were now warning the men that the disputes were putting the colliery at risk to closure. 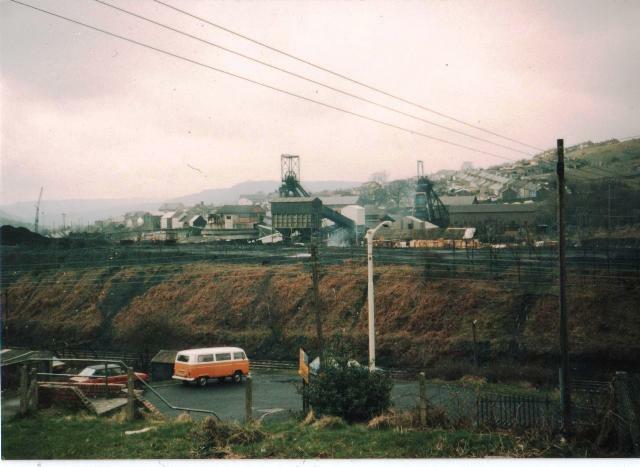 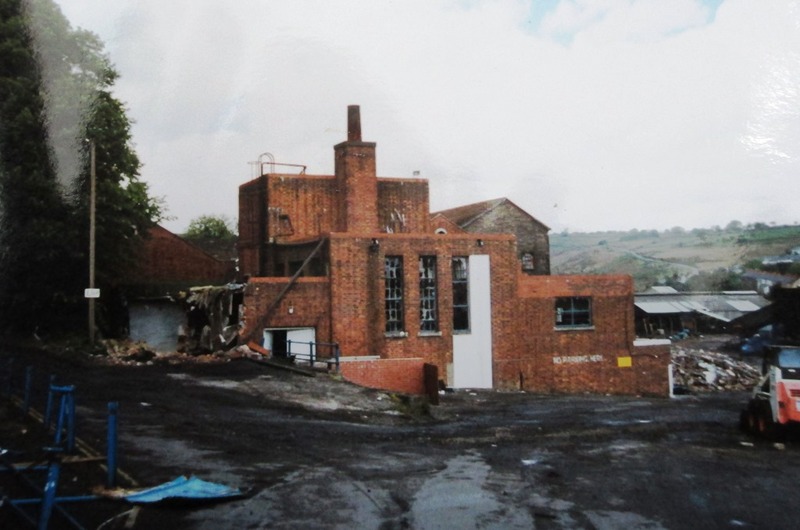 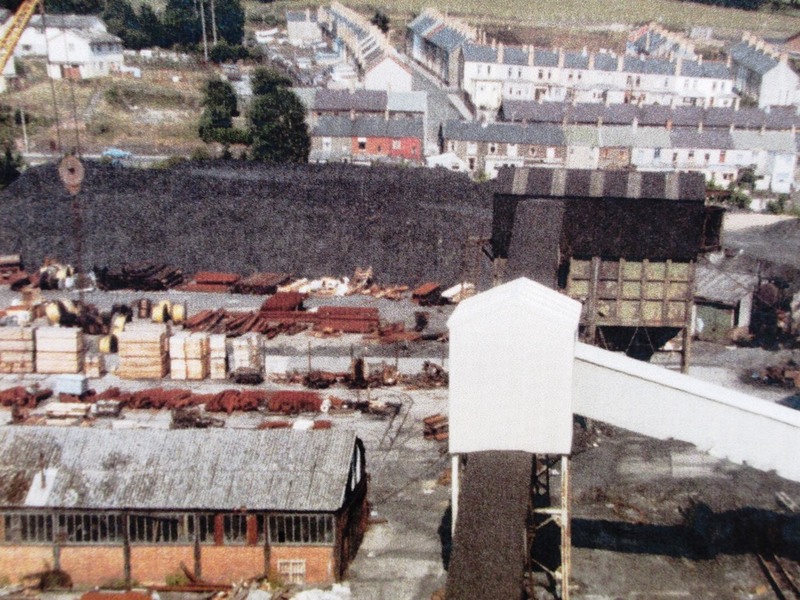 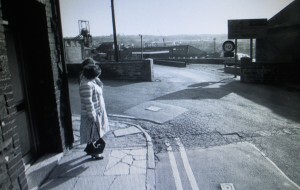 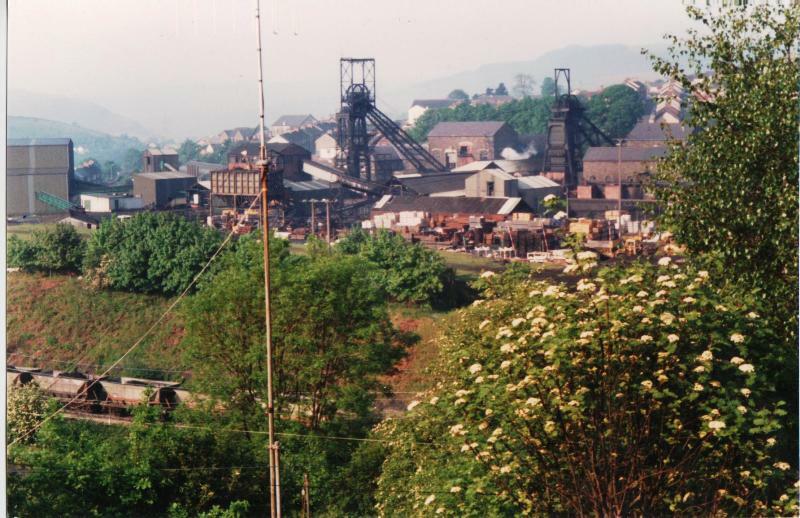 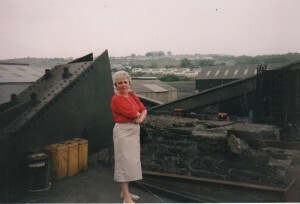 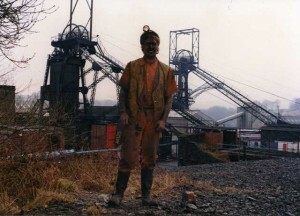 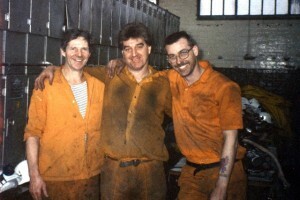 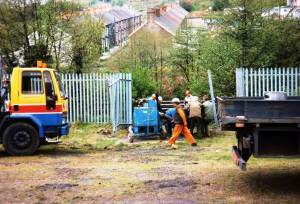 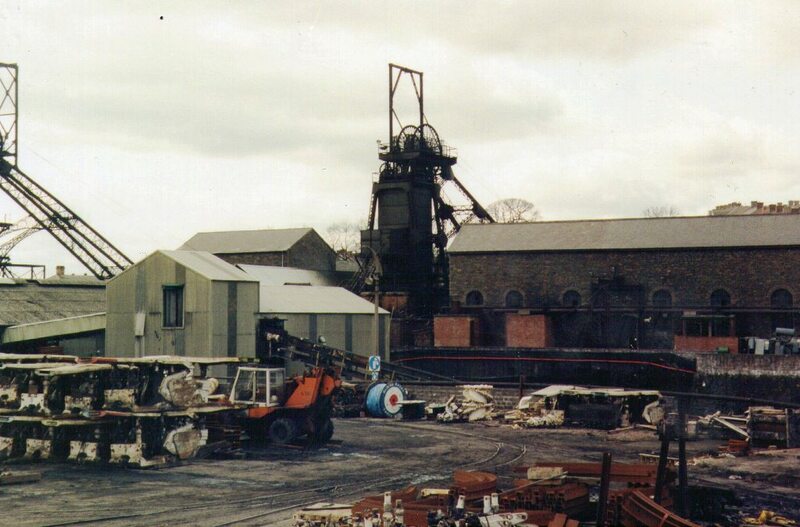 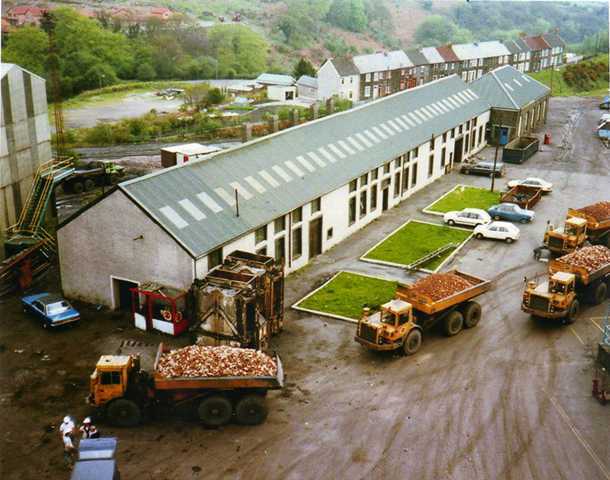 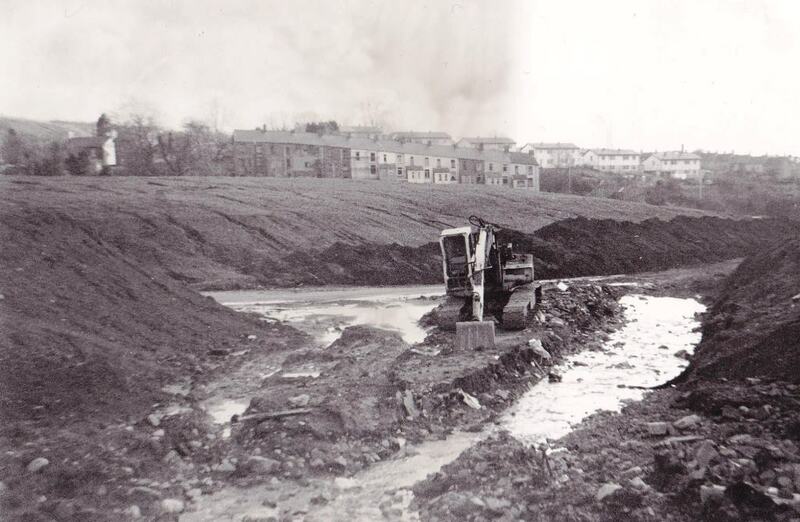 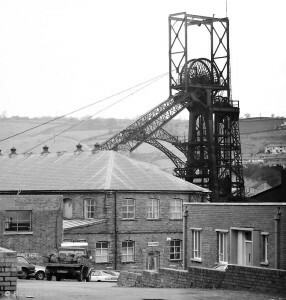 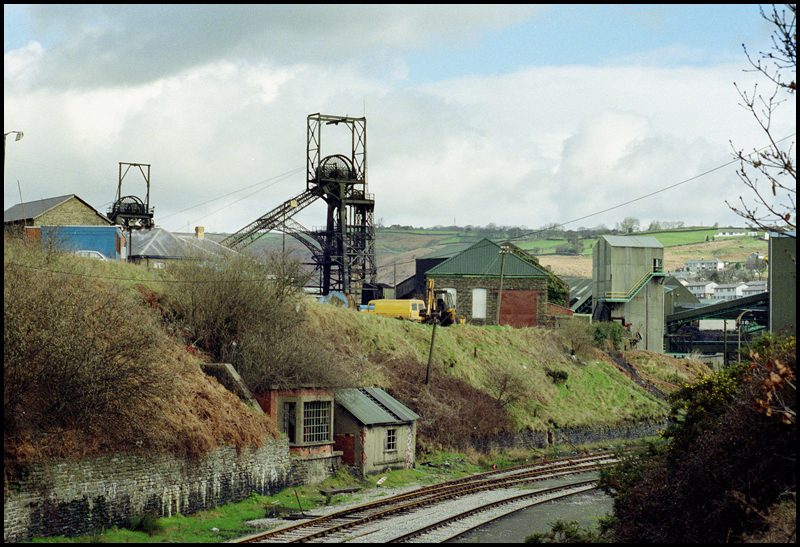 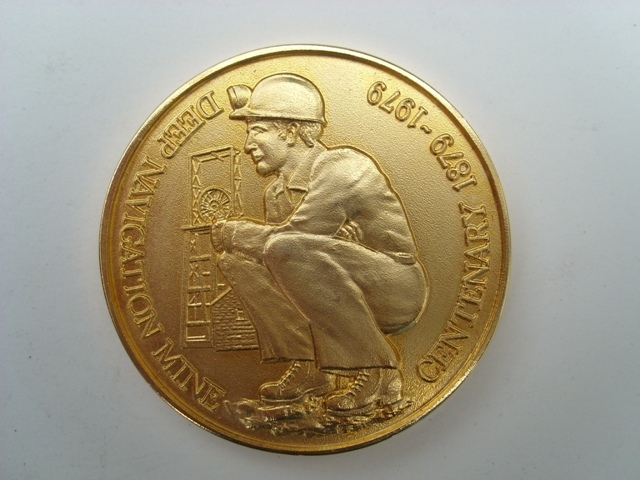 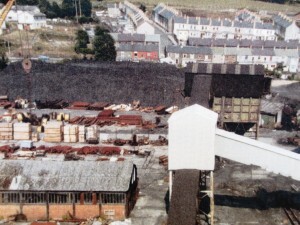 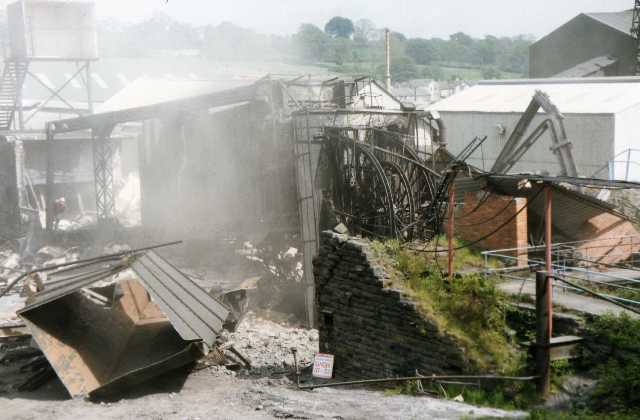 1989 Britain and in particular south Wales, nearby pits were closing including the drift in Trelewis, and Merthyr Vale both local pits who also employed some men from the Treharris area. 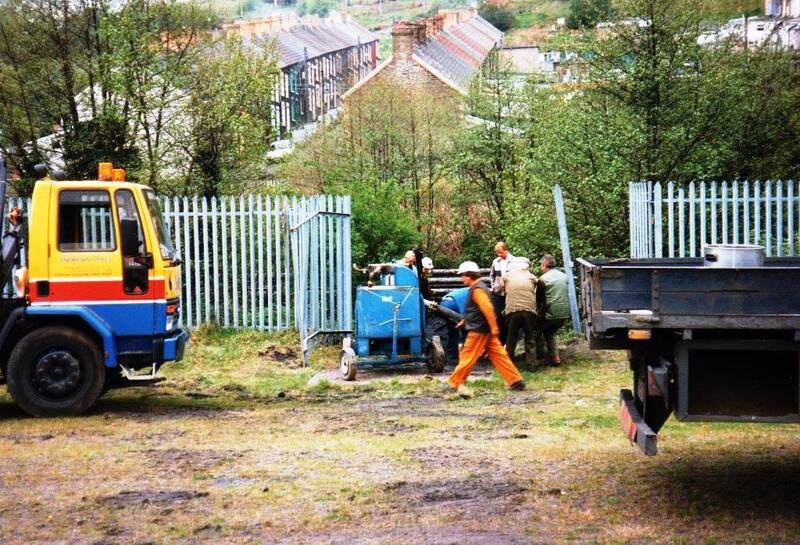 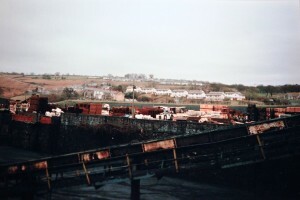 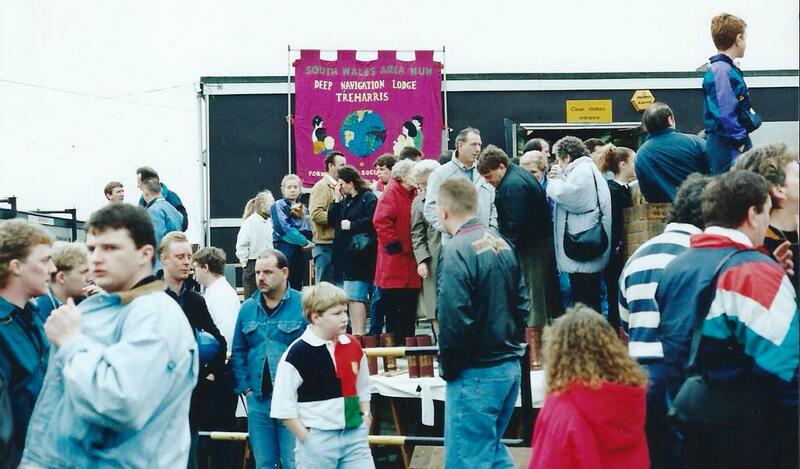 Although no Welsh pits closed in 1990, it really was a worrying time for the Treharris area. 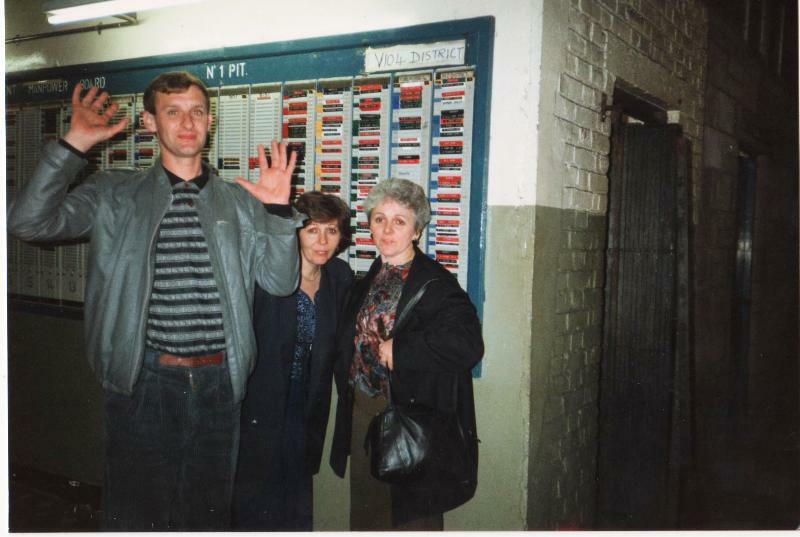 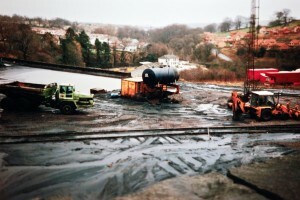 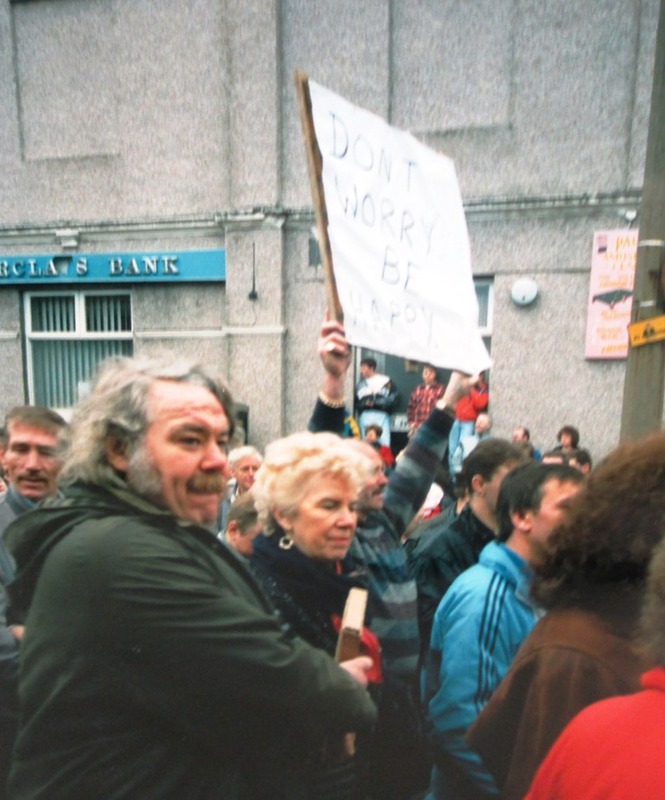 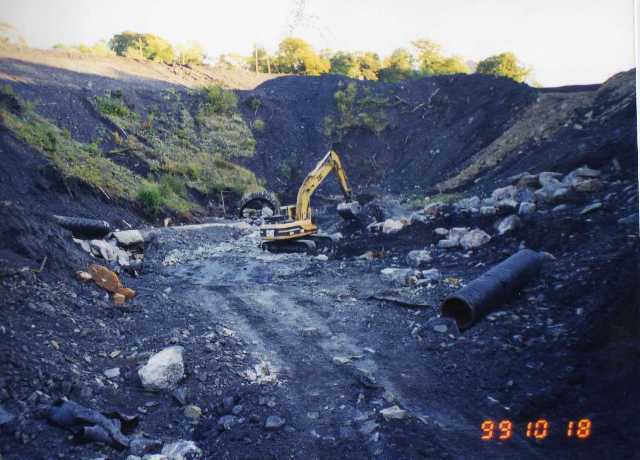 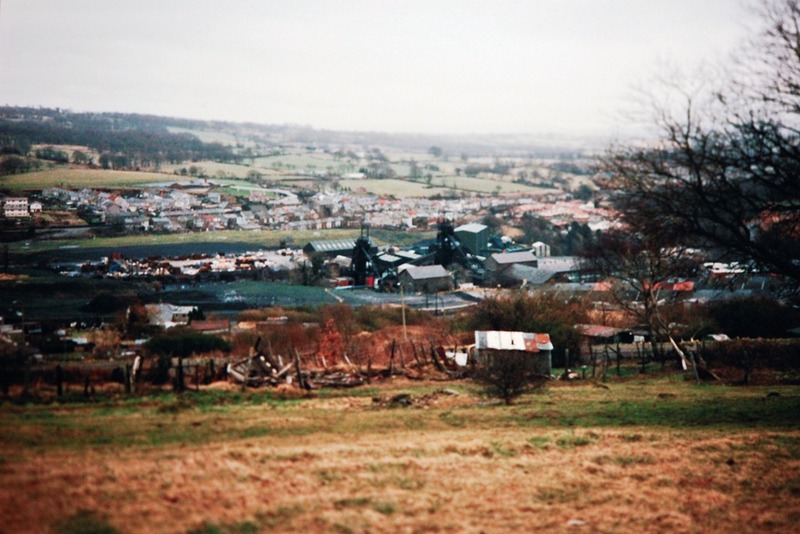 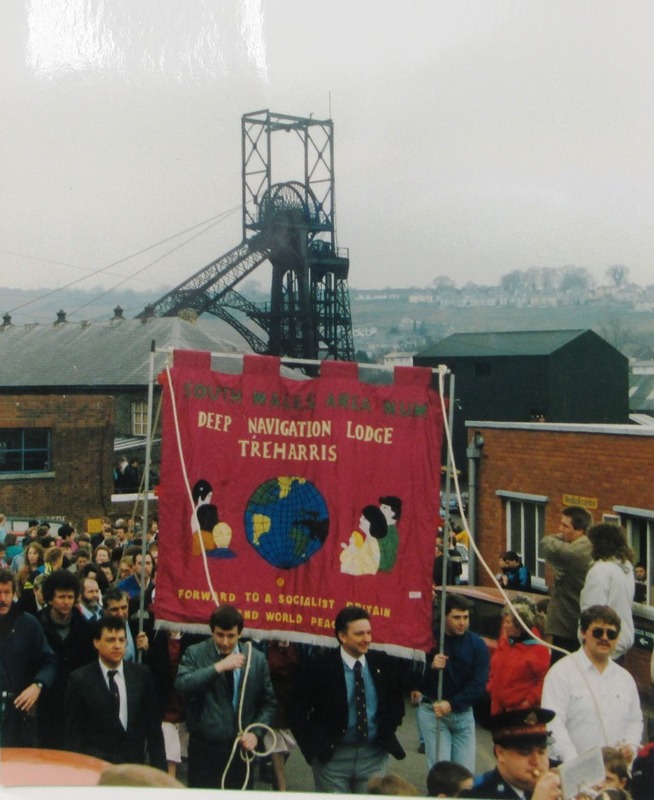 March 1990, a decision was made by British coal not to add Deep Navigation to the list of closed mines, and once again the communities breathed a sigh of relief. 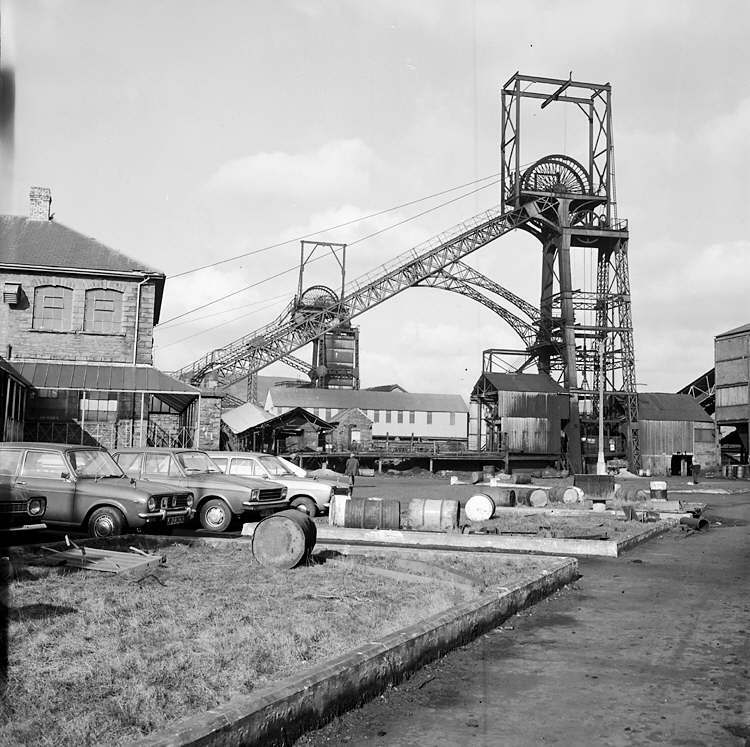 Later that summer and reports were circulating that the colliery had made a £1 million profit already that year and production was once again high, but there was bad news to come as it was revealed that British coal had discovered that coal reserves would only last until 1994. 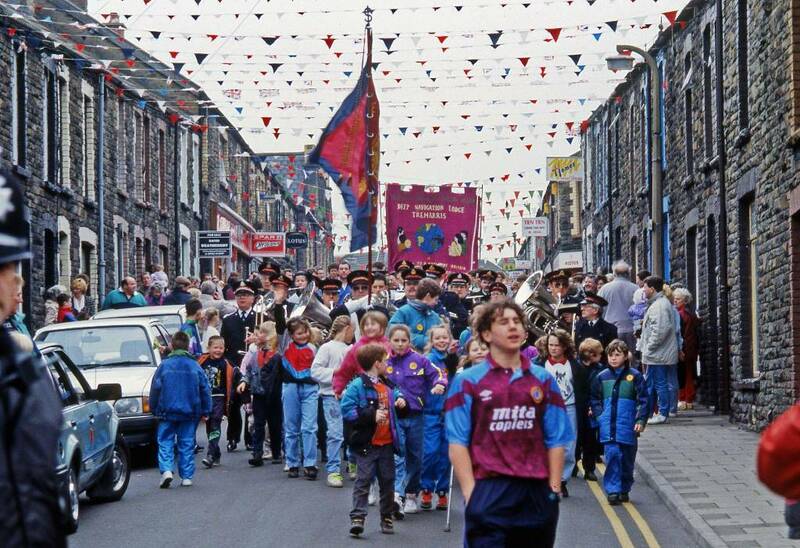 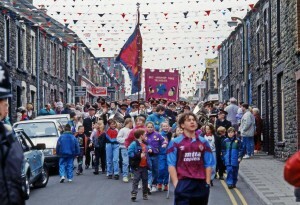 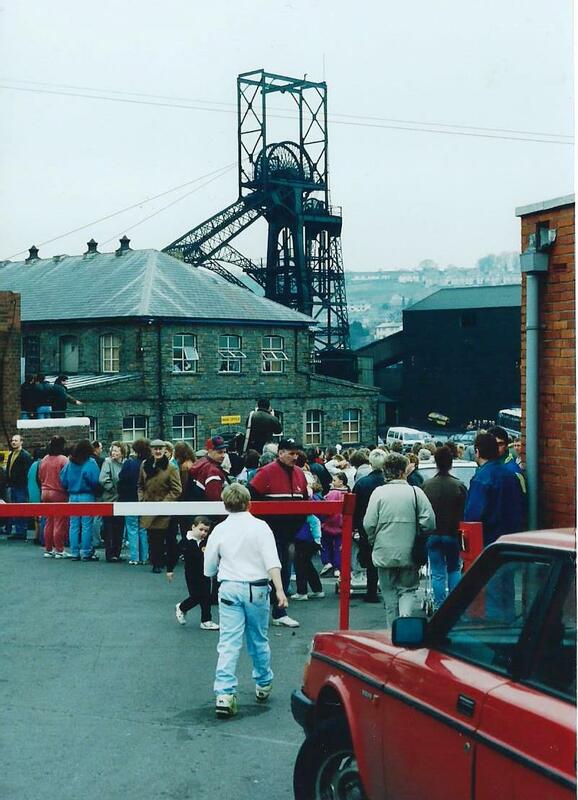 1991 came and it was looking bleak again for Deep Navigation, the community it served and of course the miners and their families. 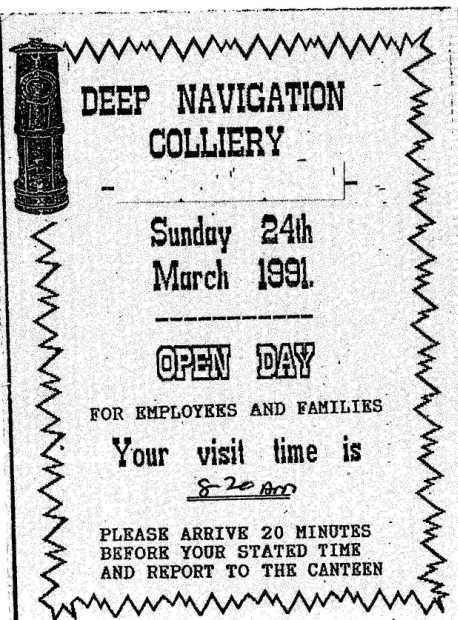 An announcement was made early in the year and it was the last nail in the coffin for the colliery..it had been decided by British coal that the colliery was to close, the day chosen was March 29, Good Friday 1991…the end of an Era for a wonderful colliery Many lost their lives working at the pit and many more suffered injury and harm working at the pit, that must never be forgotten and the fact it is now closed means the local lads of the area never have to face the dangers their forefathers experienced. 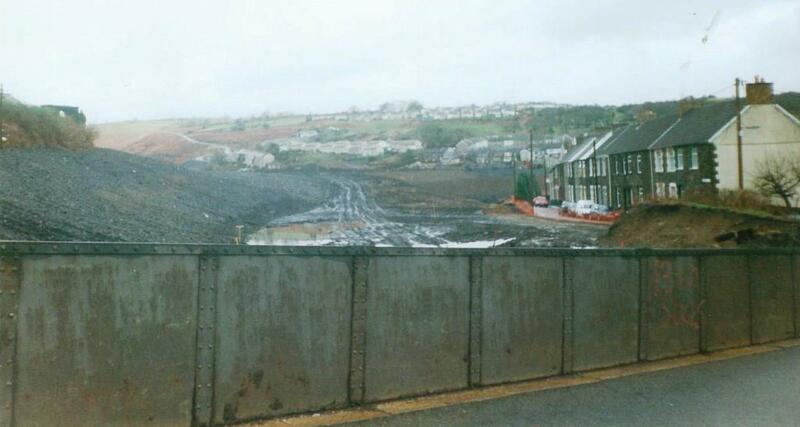 It is also true that the green valleys have returned and the Taf Bargoed river now flows proudly through the middle of the newly developed Taf Bargoed . 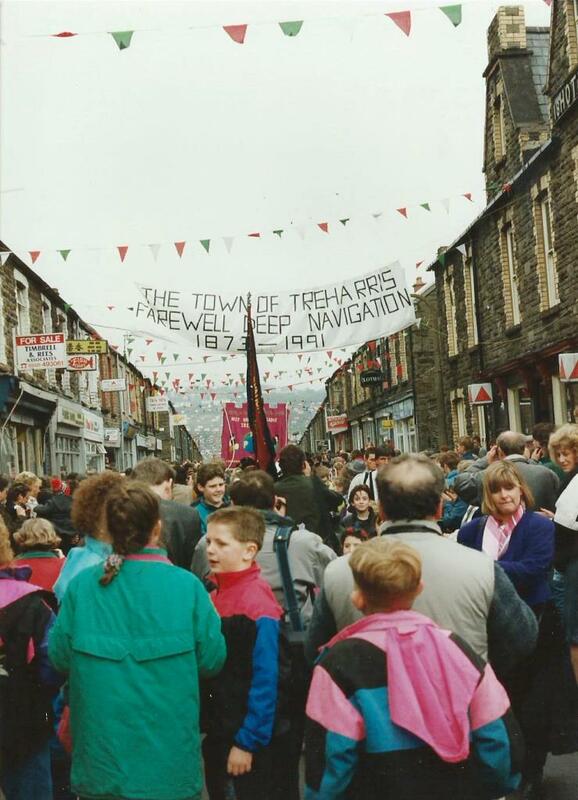 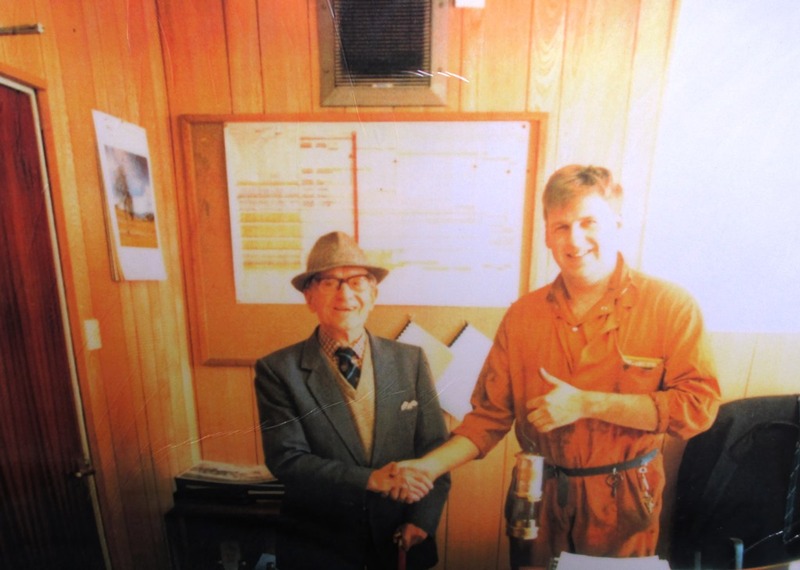 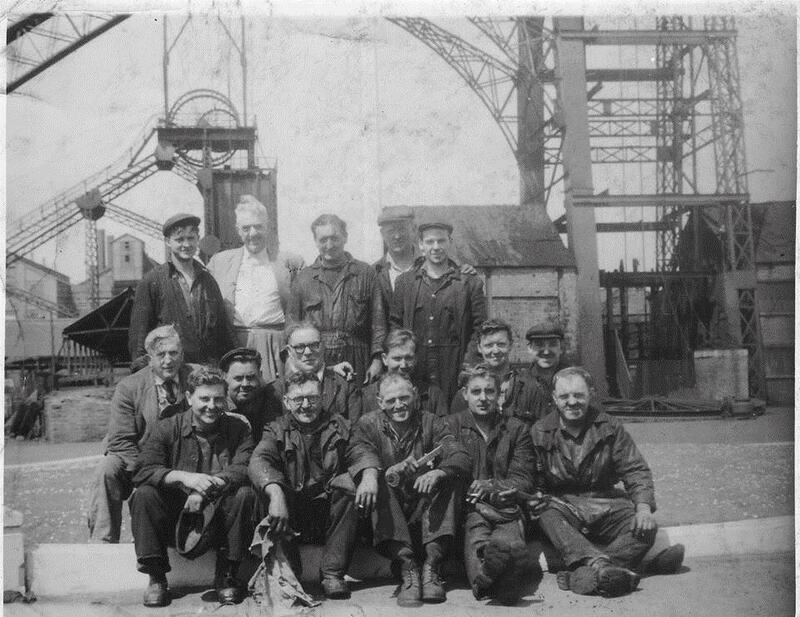 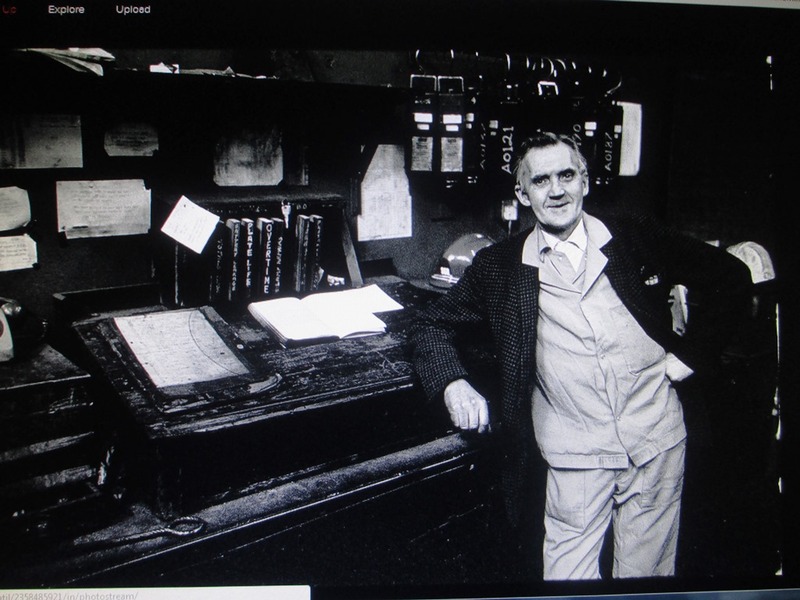 Deep Navigation colliery provided work and homes for thousands of people in its long history Mr Harris will always be remembered because the town is named after him, Harris town= Treharris. 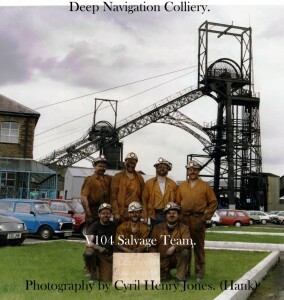 Deep Navigation Colliery, Treharris…the following pages are dedicated to the men who worked at this great coal mine and to the men who lost their lives there, may they all rest in Peace. 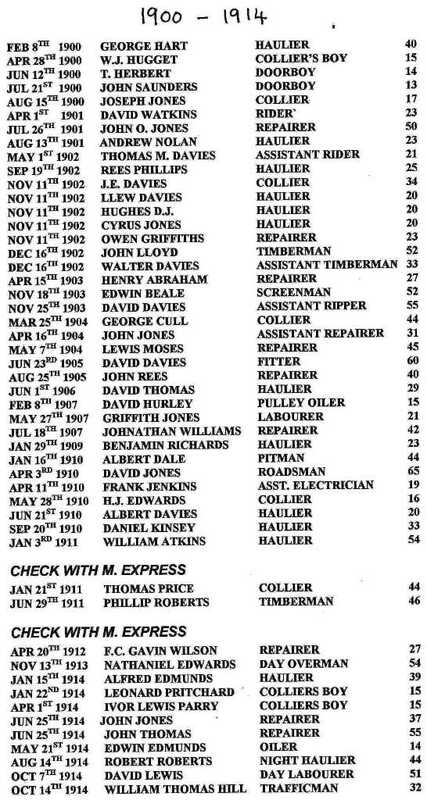 Below is a list of fatalities at the colliery 1873-1914…Please take a moment to remember these miners who lost their lives for the price of coal…It was a sad day when all the mines closed but no more of our children can be taken from us by the coal mines in our district. 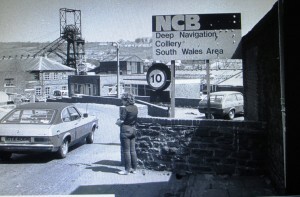 Deep Navigation 1879-1991 OLDEST PIT LEFT IN WALES First for Innovation After 112 years of active mining life, Deep Navigation closes on Good Friday, March 29th 1991, as the oldest mine in south Wales. 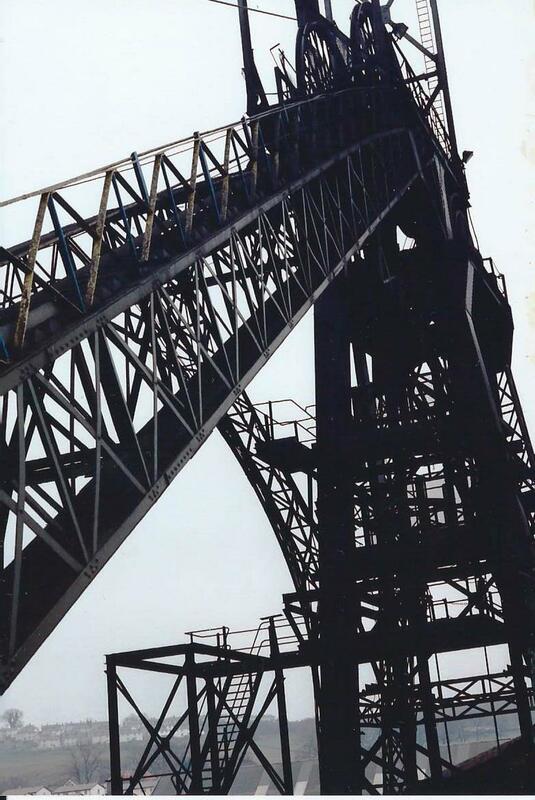 Reserves of economically workable coal have dwindled to the point where the cost of mining the remaining coal in the pit outweighs any profitable benefit. 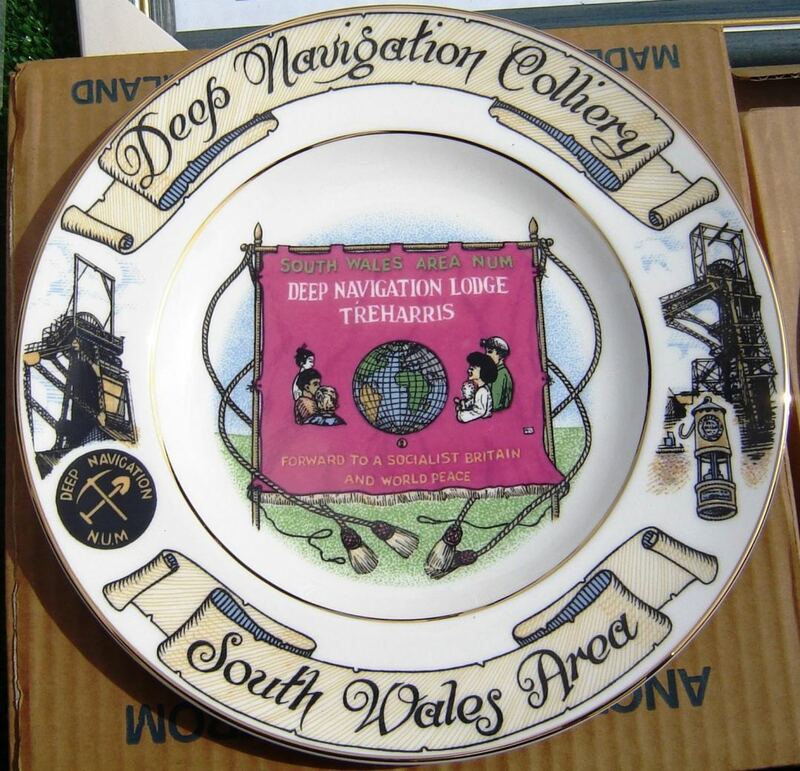 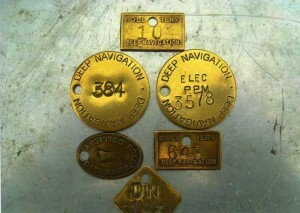 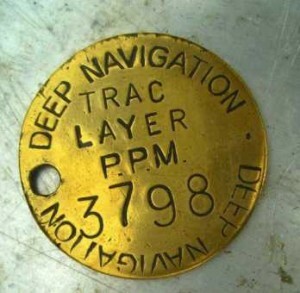 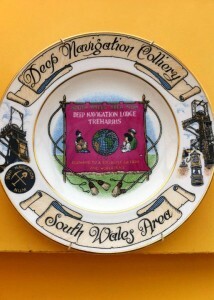 Deep Navigation has a long and proud record in the history of south Wales mining. 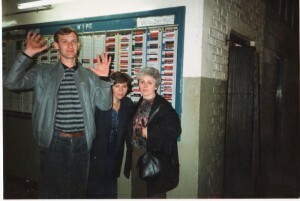 #. 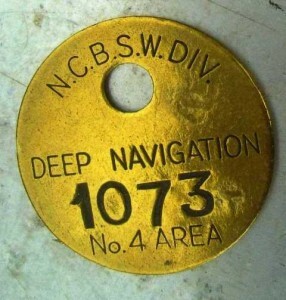 When it was first sunk, it was the deepest pit in the coalfield. 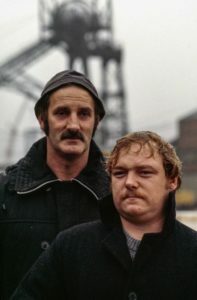 #. 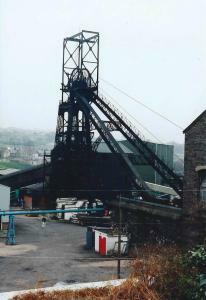 Before the start of this century it was equipped with a unique pumping engine, built in Cornwall. 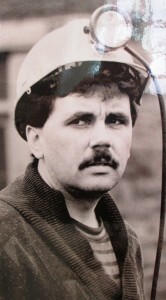 #. 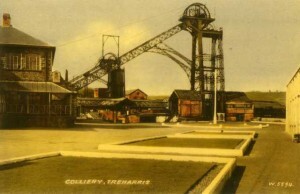 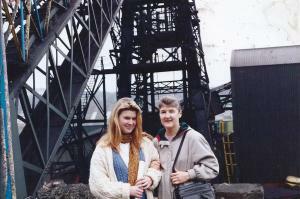 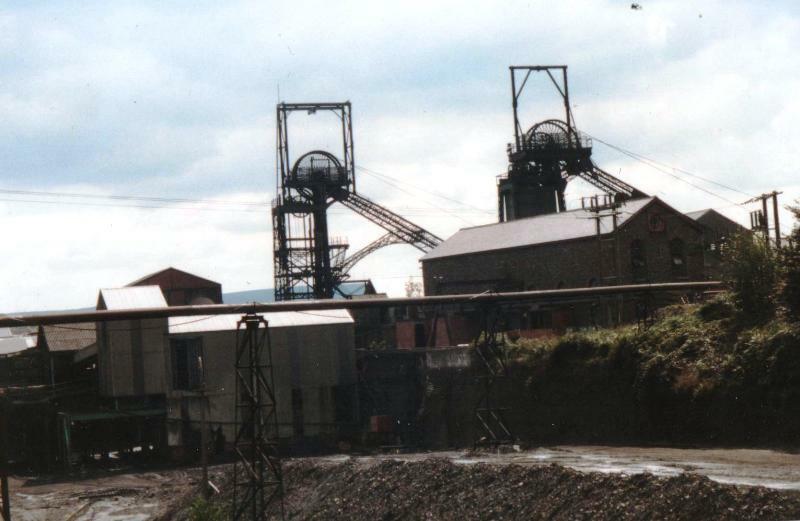 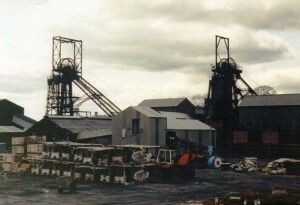 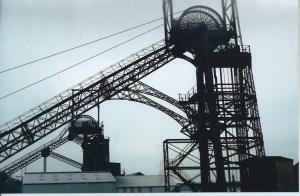 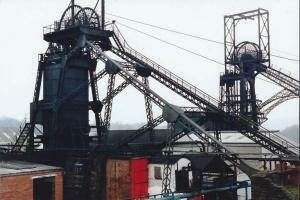 It was the first colliery in south Wales to be equipped with pithead baths. 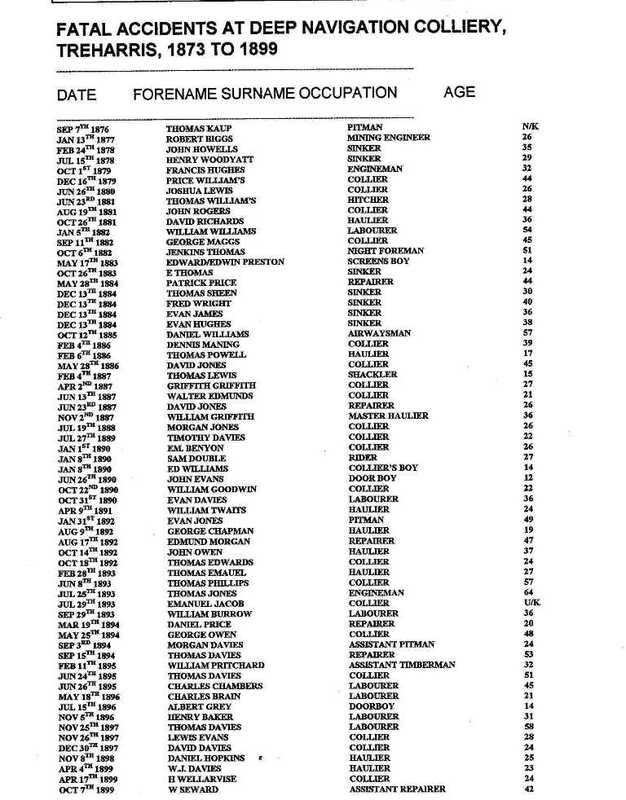 #. 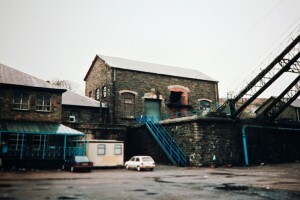 It was one of the first pits in Wales to use electricity. 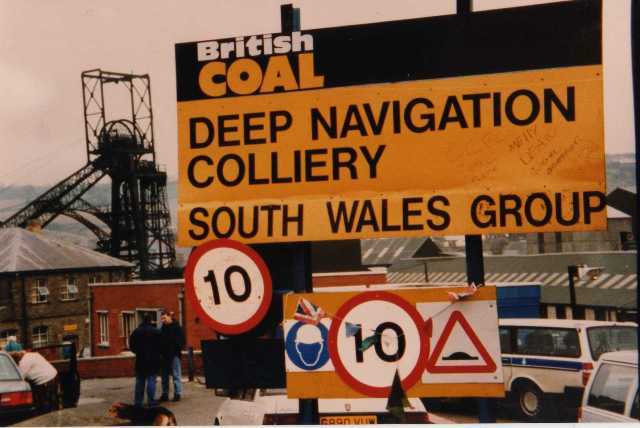 For decades Deep Navigation has been a major supplier of fuel to Aberthaw Power Station, at the rate of over 500,000 tonnes annually. All 371 men on the Deep Navigation books at closure have been counselled individually concerning their future and a “job shop” has been established on site to help those taking voluntary redundancy to find alternative work. 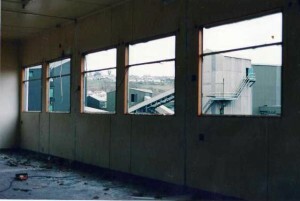 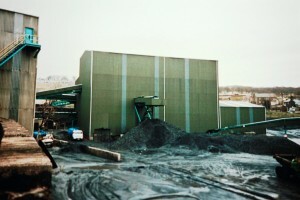 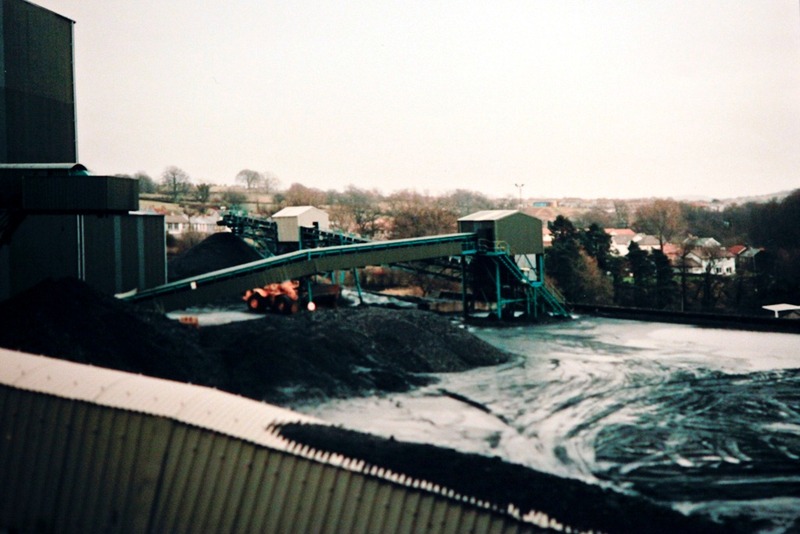 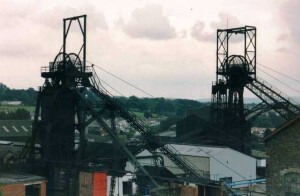 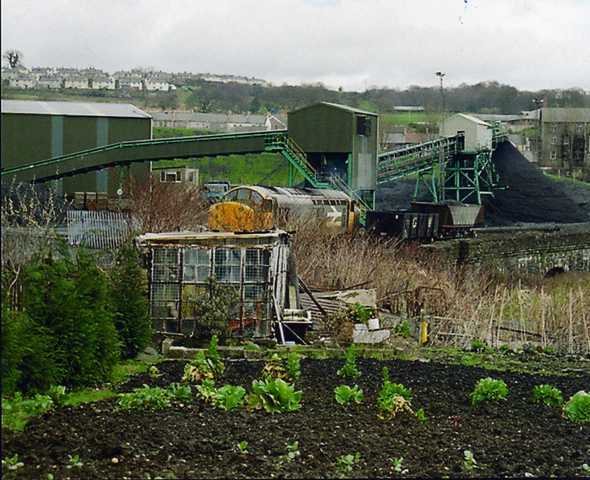 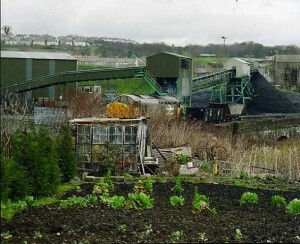 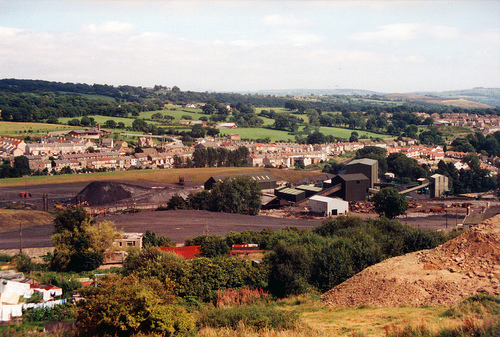 The Collieries coal preparation plant will continue to operate after closure for a period of about 9 months, so that stockpiles containing 370,000tonnes of fuel can be cleared and prepared for the market Later, proposals for the demolition and clearance of the site will be drafted and will form part of a consultation programme to involve people from the community. 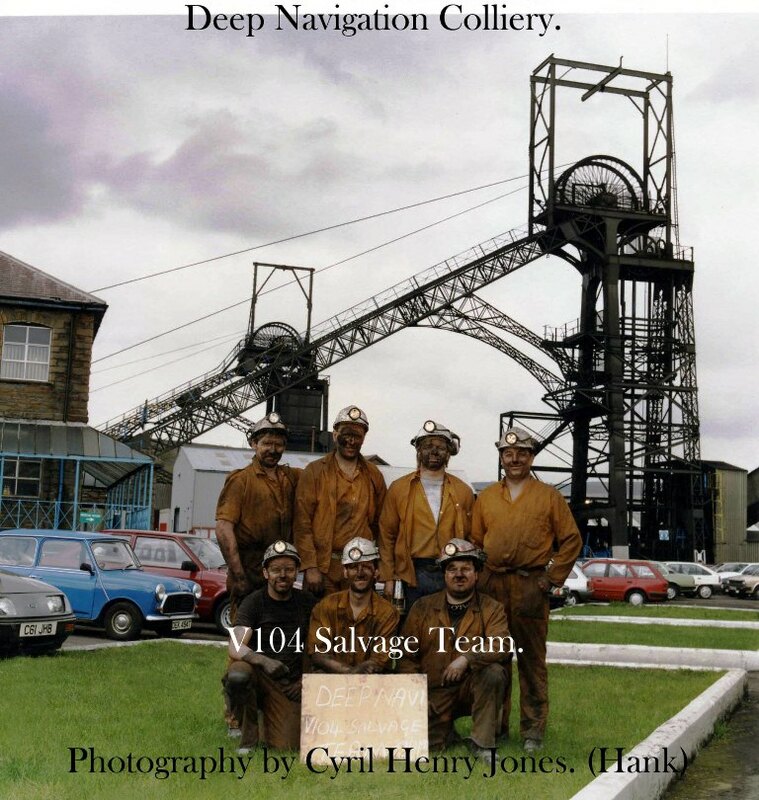 Mr Steve Reece, Deep Navigation’s colliery manager observed “I extend my best wishes to all the colliery employees. 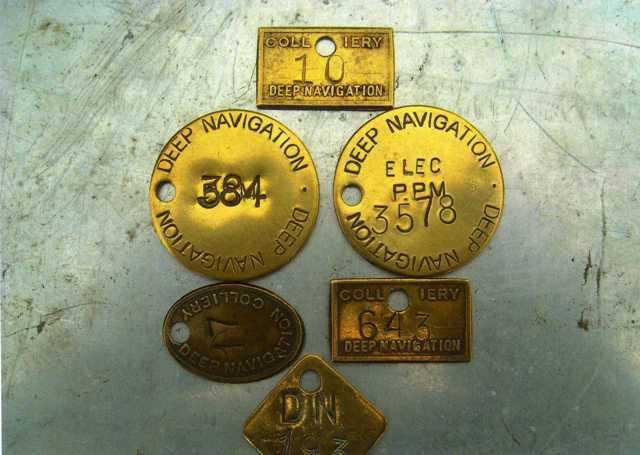 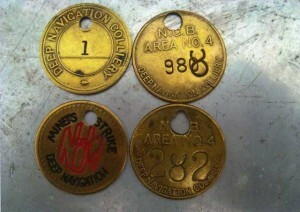 Deep Navigation established a long and proud record for Quality products and quality mining. 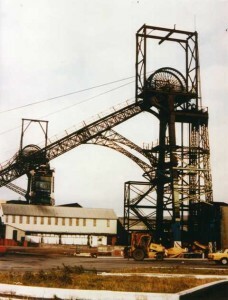 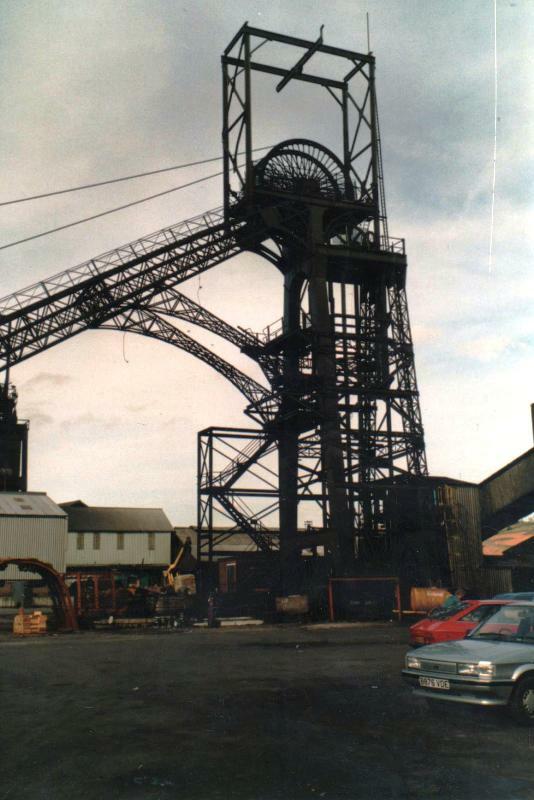 There is no doubt that this colliery helped to create the Industrial wealth of south Wales as a cornerstone of the mining industry. 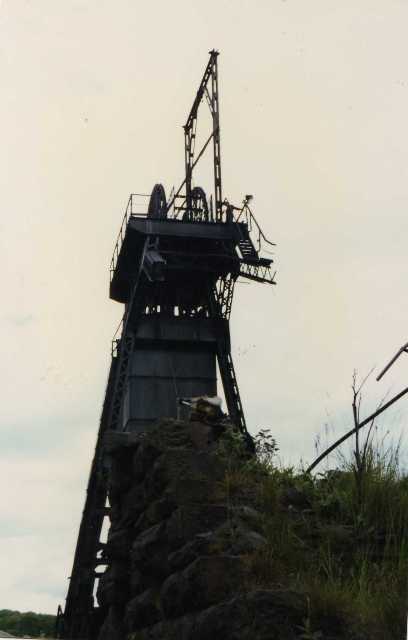 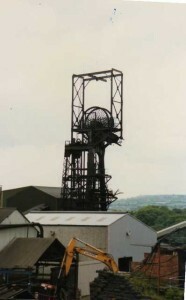 It has earned a rightful place in the industrial development of south Wales” Lamps for all One week before the last shift was worked at Deep Navigation, the colliery played host to all its employees, who were invited to bring two visitors each to the mine. On Sunday March 23rd they were wound to pit bottom for a tour of the pit bottom circuit. 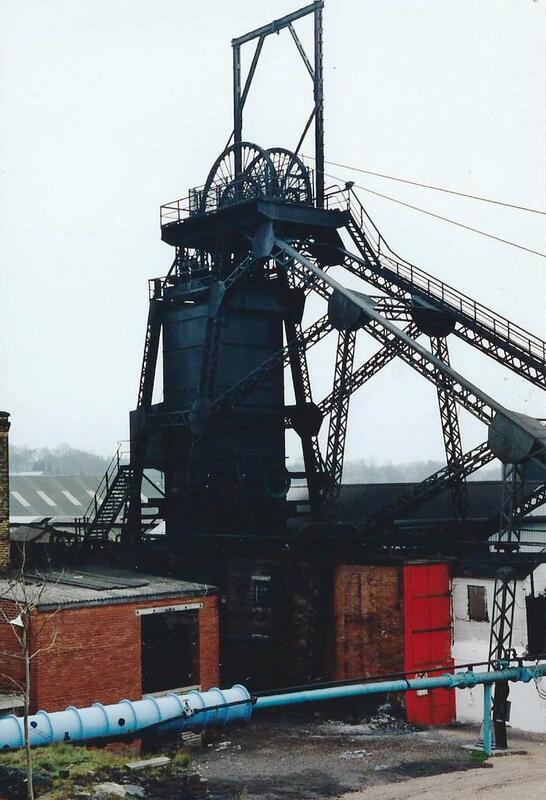 Deep Navigation NUM lodge have devoted funds to provide each working miner at the colliery with a presentation lamp and are extending the same gift to recently retired colleagues. 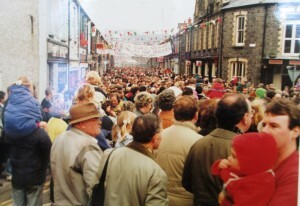 Some 800 lamps will be distributed in total. 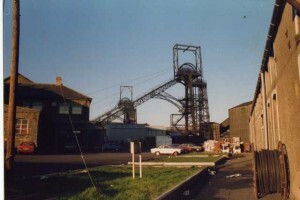 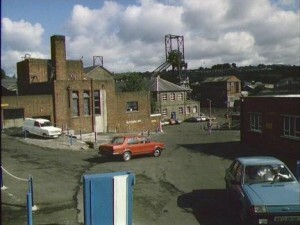 On the last working day, the colliery will play host to the M.P. for Merthyr Tydfil, Mr Ted Rowlands and the M.P. 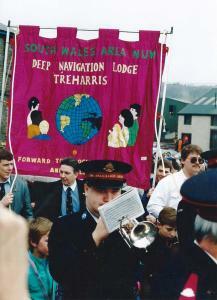 for Pontypridd, Mr Kim Howells, formally NUM South Wales research officer. Rescued in 1890,Deep Navigation topped 100 years of mining life Deep Navigation marked its centenary in 1979, 100 years after the first coal was raised up the No 2 North pit shaft. 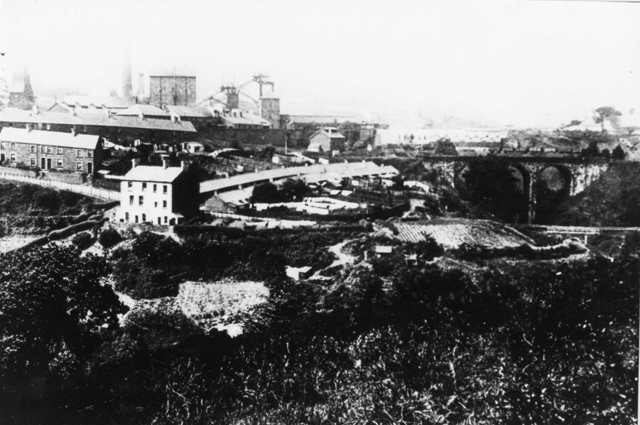 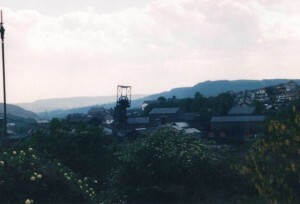 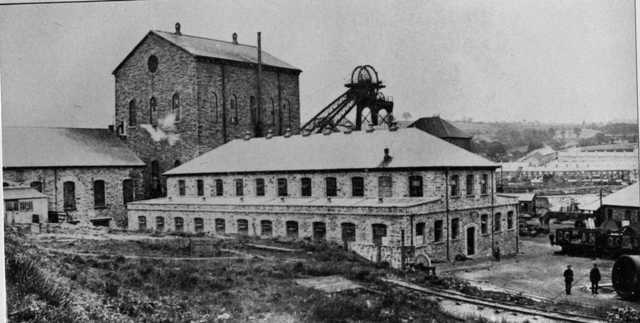 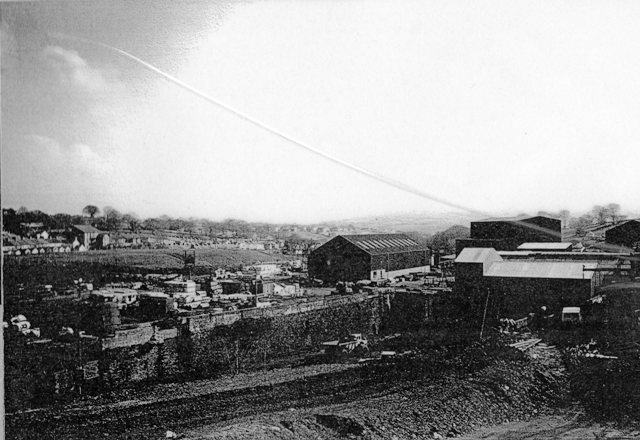 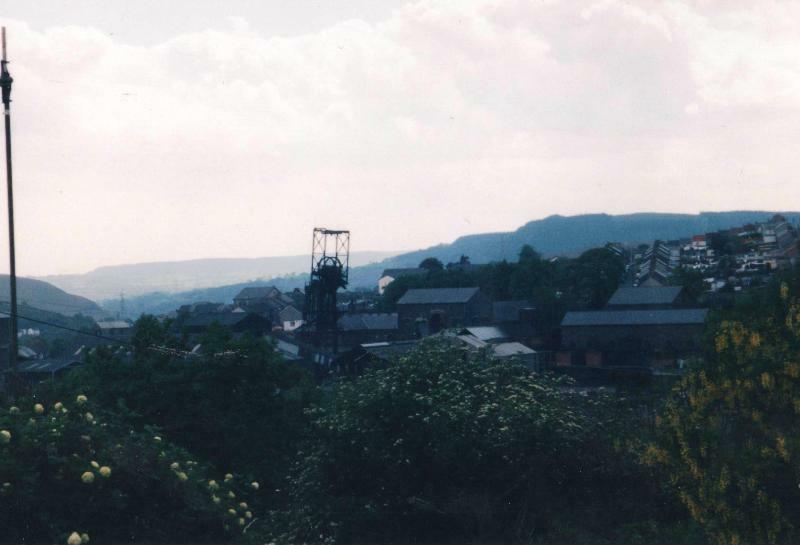 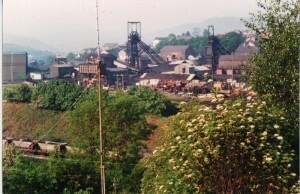 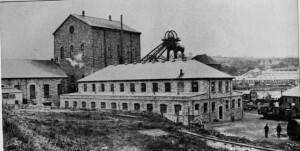 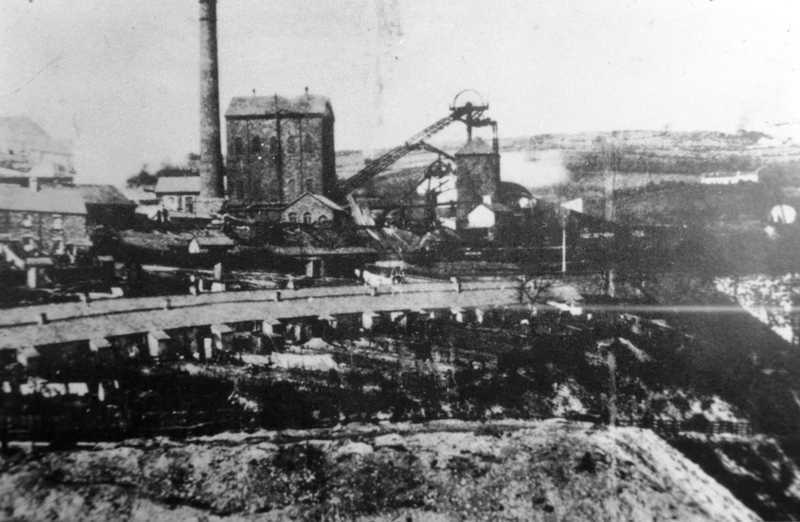 The Colliery came into existence in the early 1870’s as a direct result of prospecting on land belonging toTwynygarreg, Pantannas and Cefn Fforest farms. 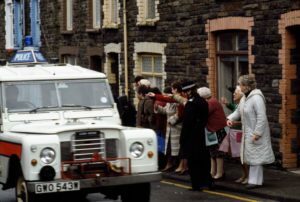 Some strange “formally attired gentlemen” appeared in the district where they made a casual survey of the farmlands, especially in the Taf Bargoed valley. 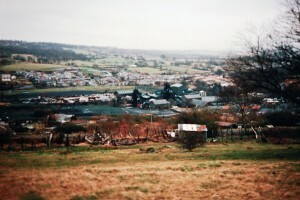 Some time later the district was sent into turmoil when it was announced that a mining company was going to sink a pit on land belonging to Twynygarreg farm. 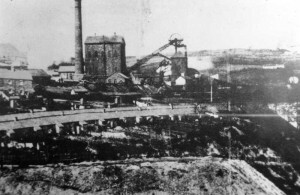 In February 1873 the first sod was cut for the sinking of the colliery enterprise. The business was originally known as Harris Navigation pits, after the principal shareholder, who also gives his name to the village which grew up around the activity. 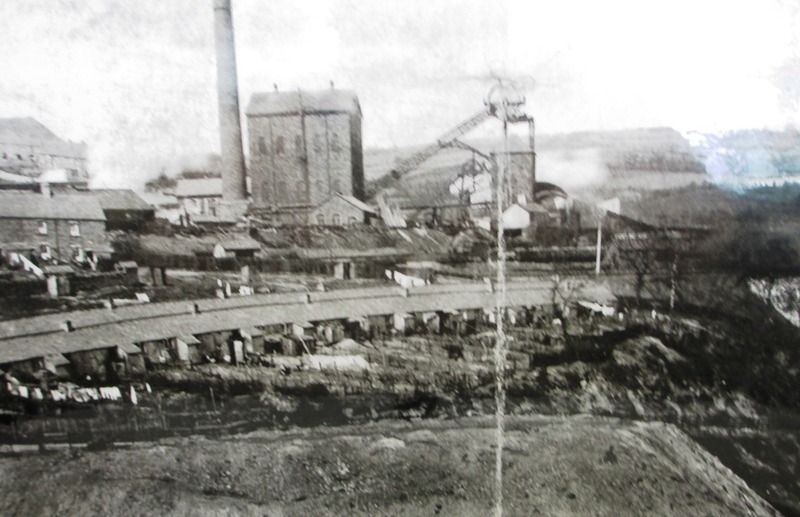 Two shafts were completed in May 1878 and were the deepest at that time in South Wales-760 yards to the Nine feet seam, around 200 yards deeper than any other shafts in south Wales. 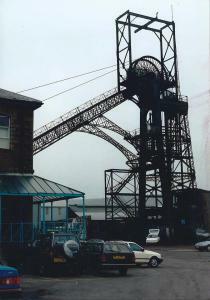 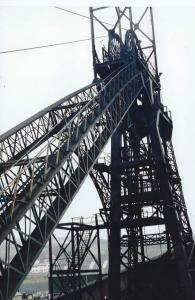 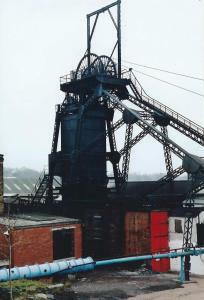 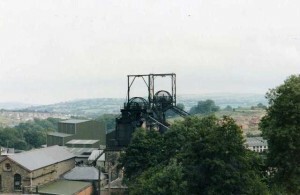 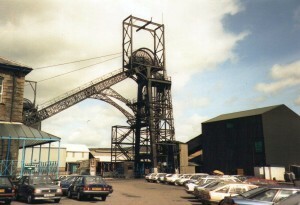 The South pit shaft came into operation raising coal by1881. A remarkable feature of the enterprise was a massive Cornish pumping engine supplied by the Perran Foundry of Truro, Cornwall. 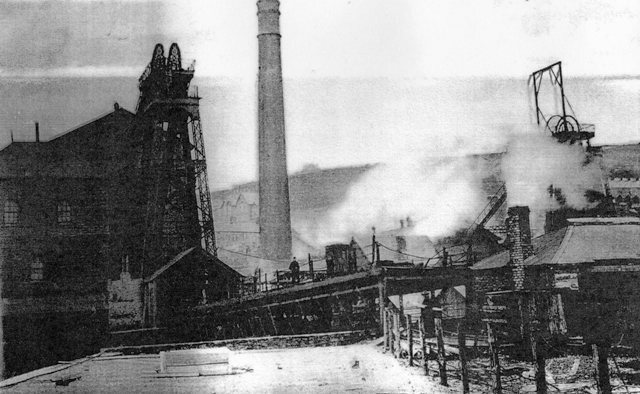 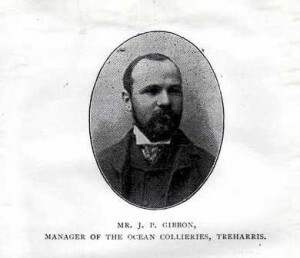 A decline in mining production in the early 1890’s brought about a crisis for the Harris Navigation company, which had run deeply into debt, with public fears that the colliery was about to close. 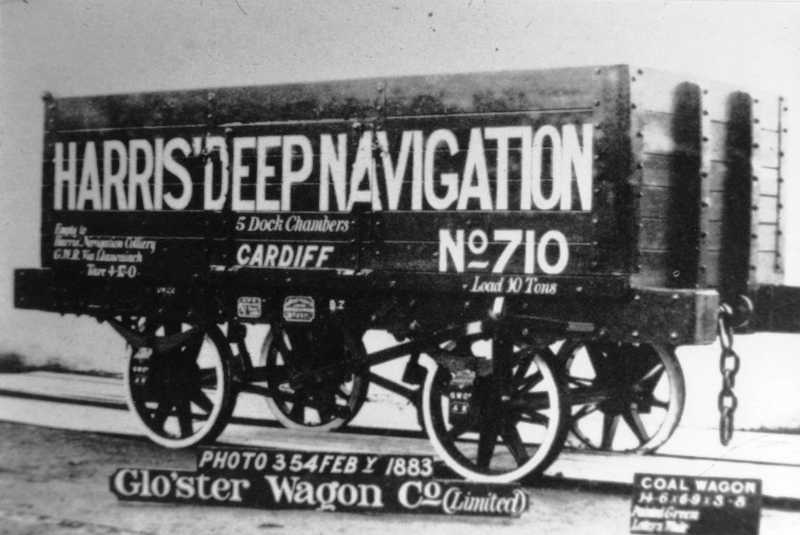 Ocean coal, one of the giants of south Wales mining, came to the rescue in 1873, they bought out Harris Navigation at a knockdown price, renaming the mine Deep Navigation. 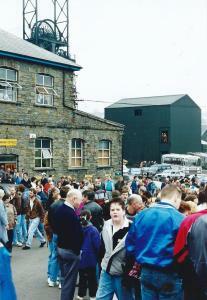 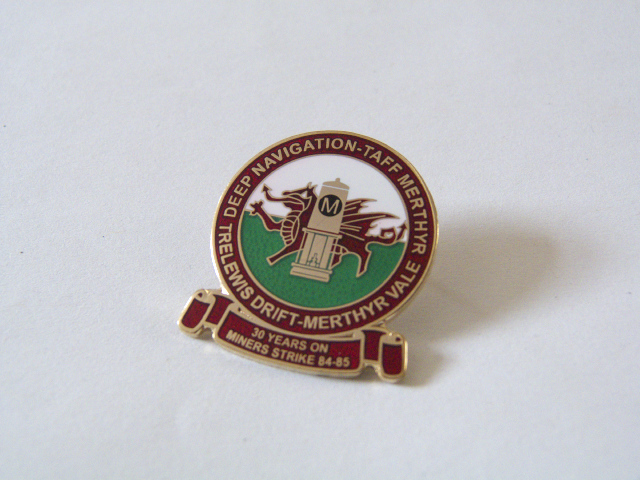 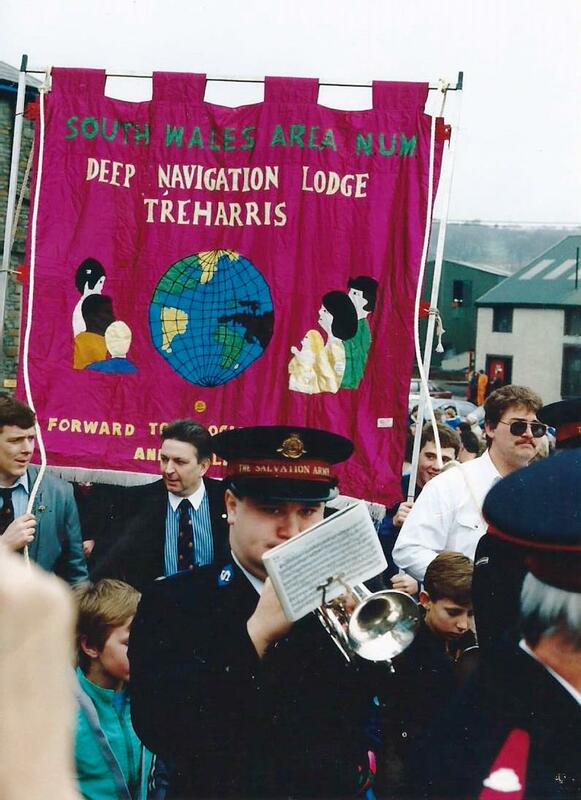 By 1897 Deep Navigation employed 2,500 men and Treharris had become a thriving community of 7,000 people. 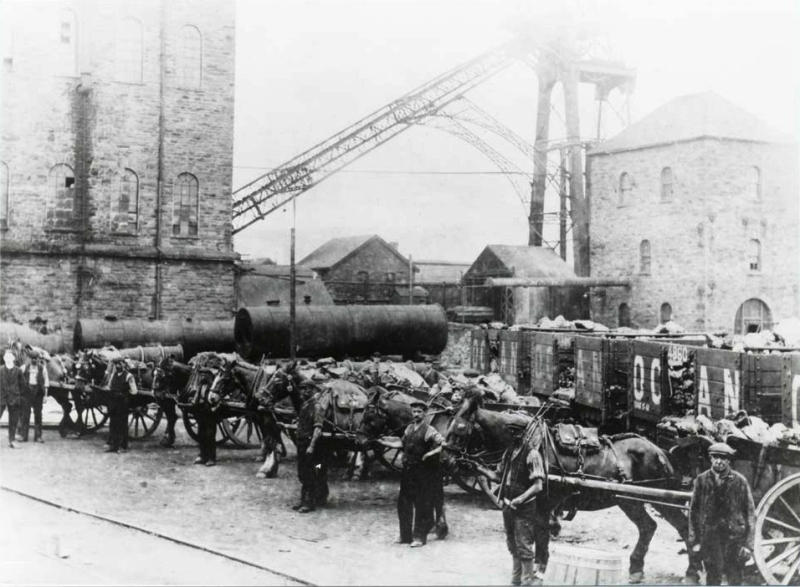 By 1902, Ocean coal had invested a further £600,000 on developments, introducing labour saving schemes and mechanical plant. 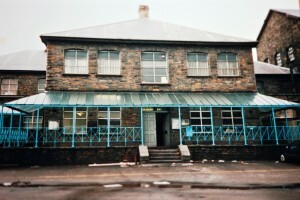 The scheme was masterminded by William Jenkins, a director of the business and general manager of Treharris. The North and South Shafts were now 768 yards deep intersecting the four foot seam at 693 yards, the six foot seam at 718 yards and the nine foot seam at 760 yards, coal was hauled in main roadways by horses , of which, 150 were employed underground. By 1920 there were 1,946 men employed at Deep Navigation using the “Barry of Nottingham” system of coal cutting, a forerunner of long wall mining. 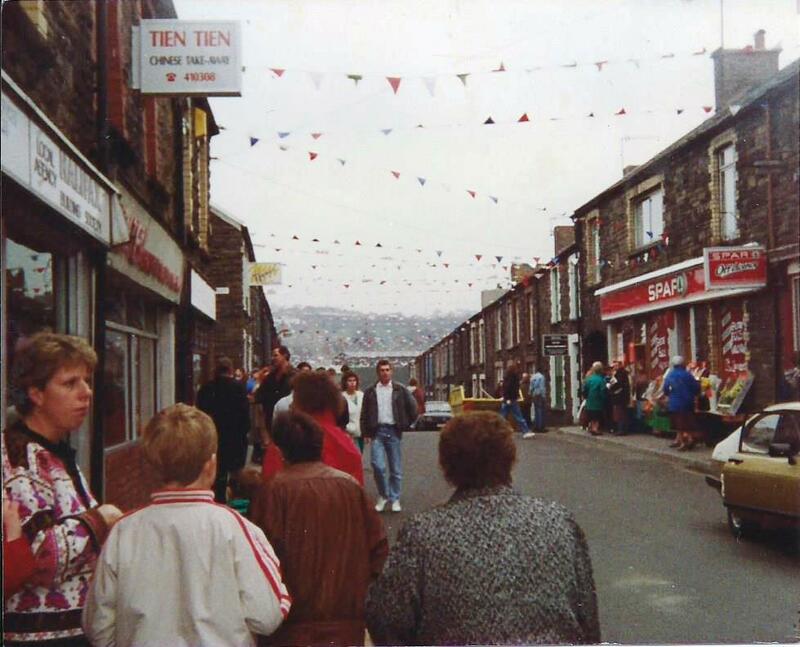 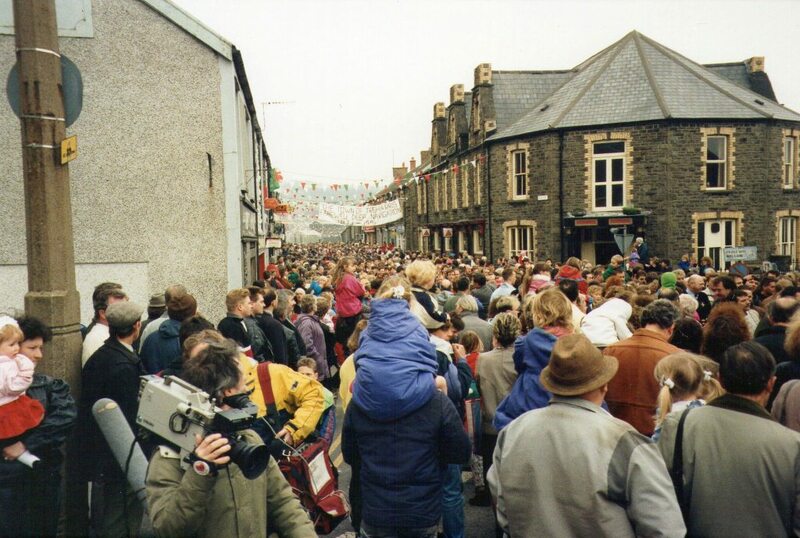 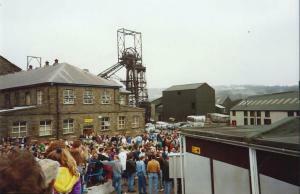 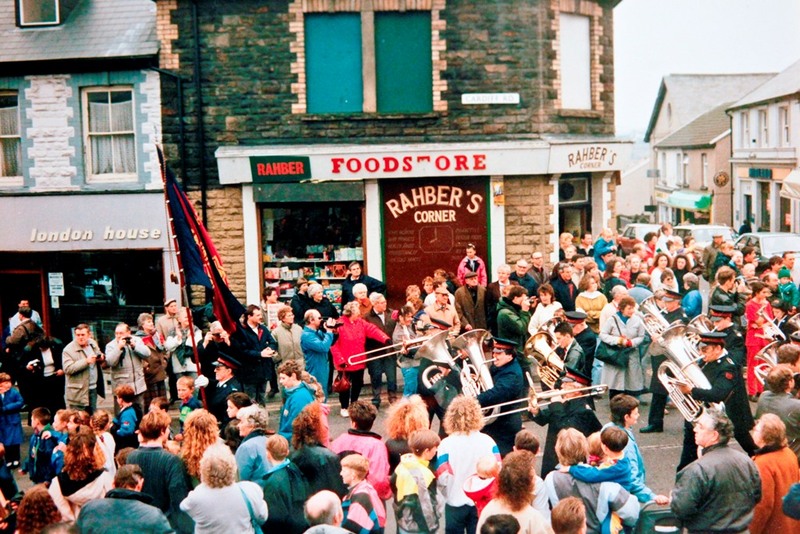 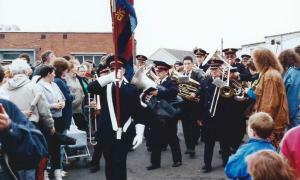 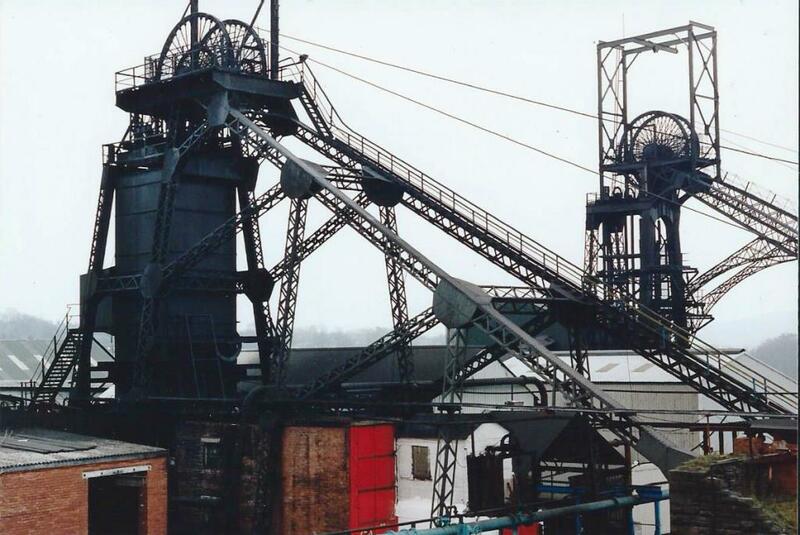 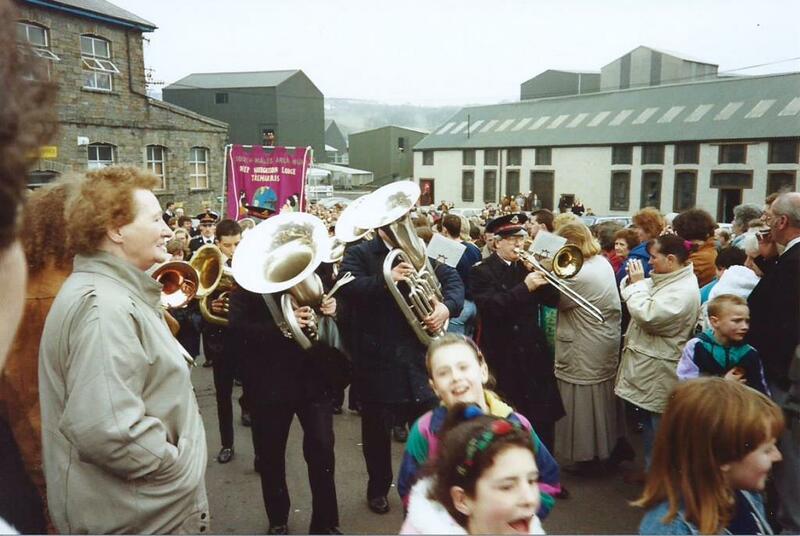 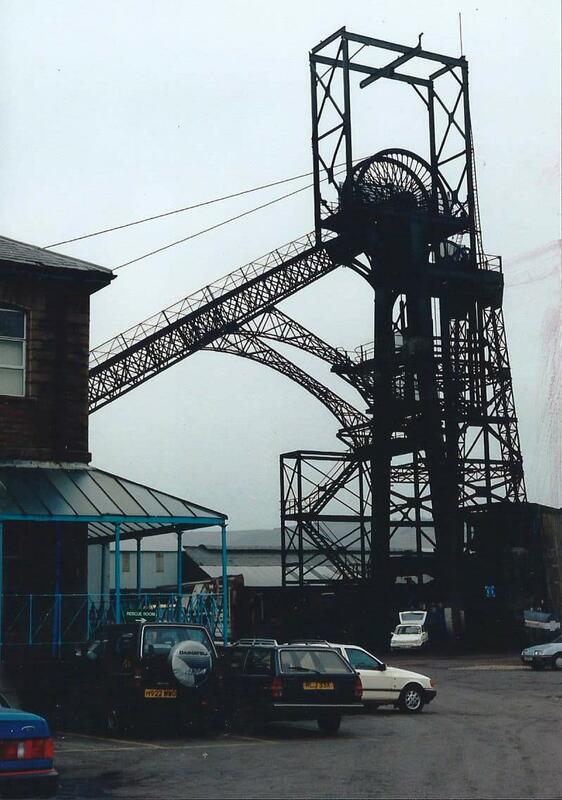 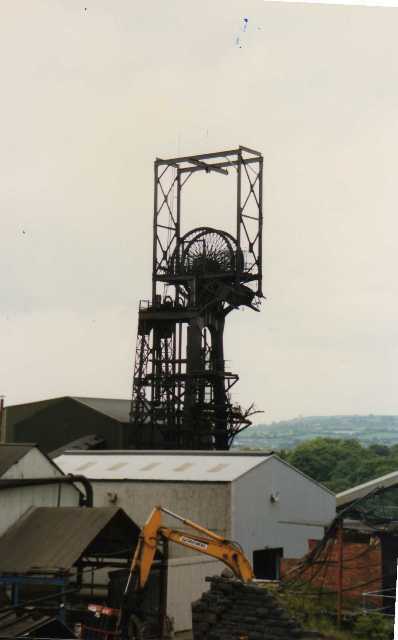 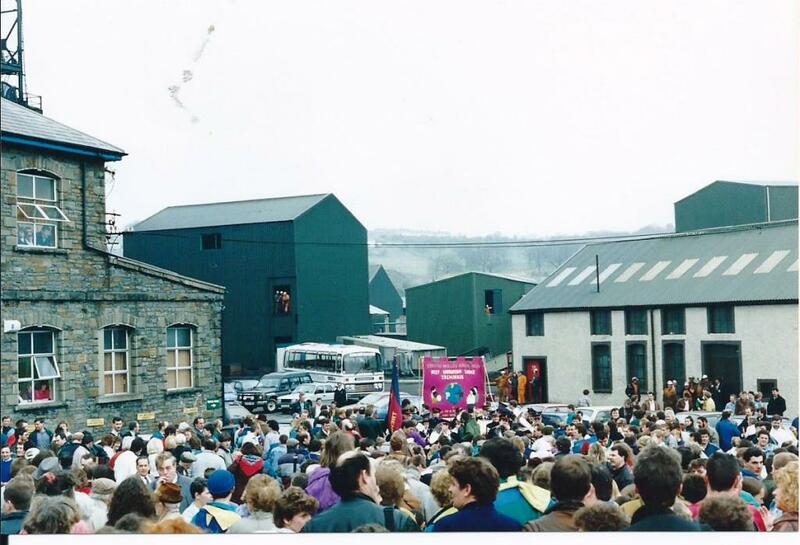 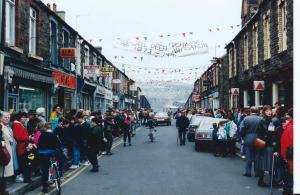 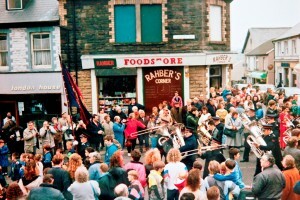 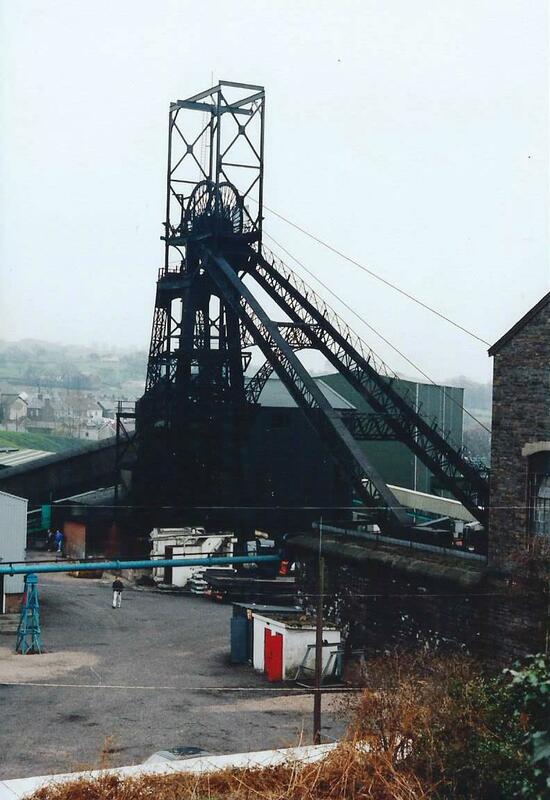 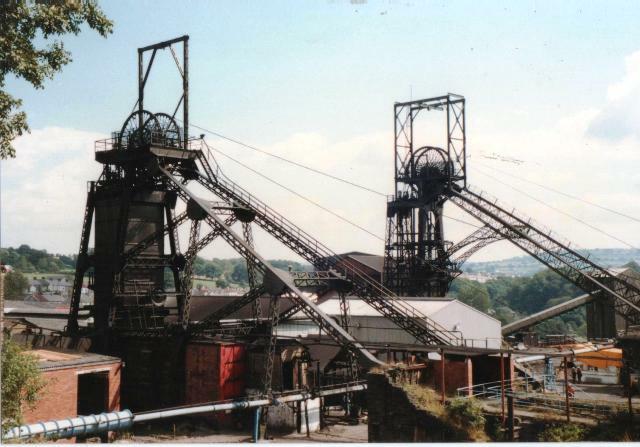 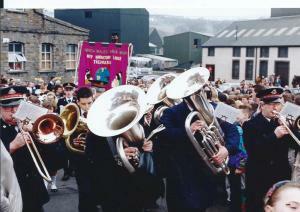 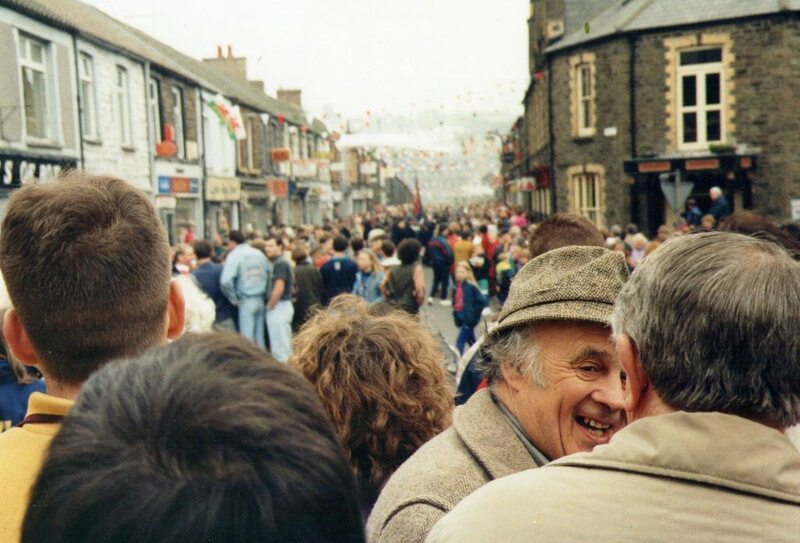 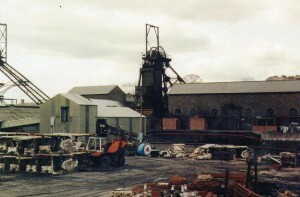 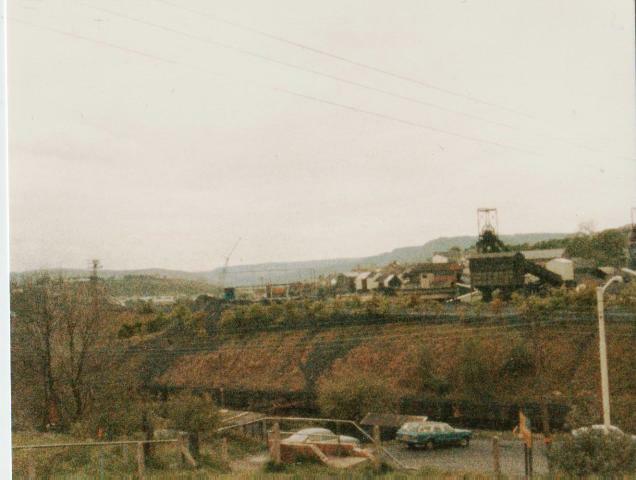 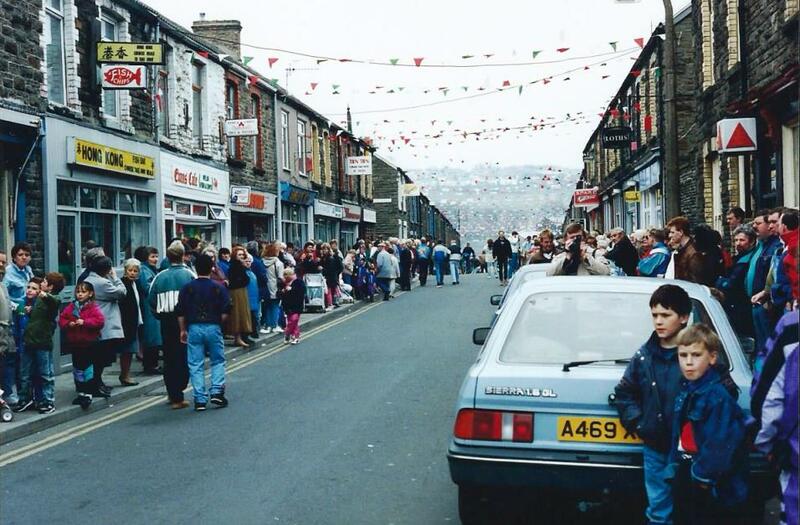 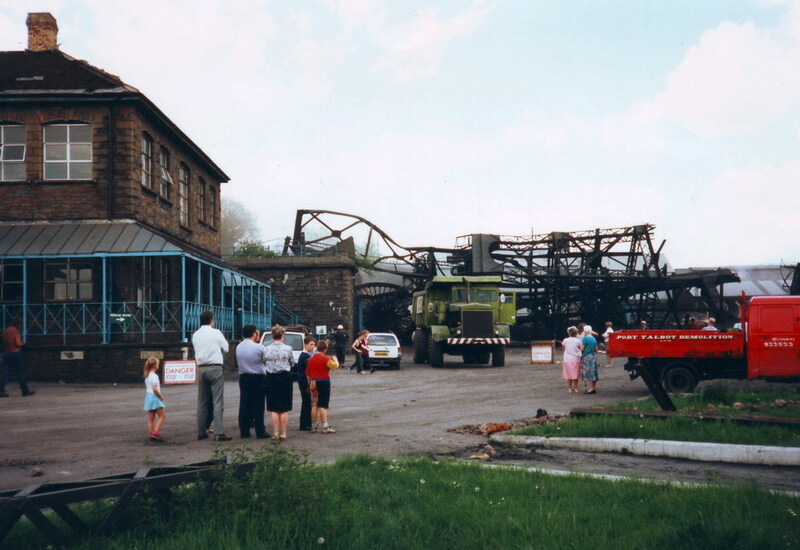 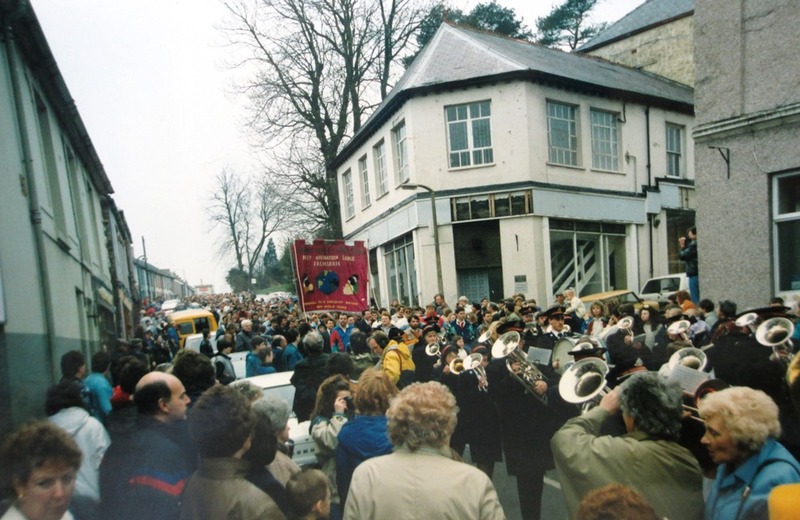 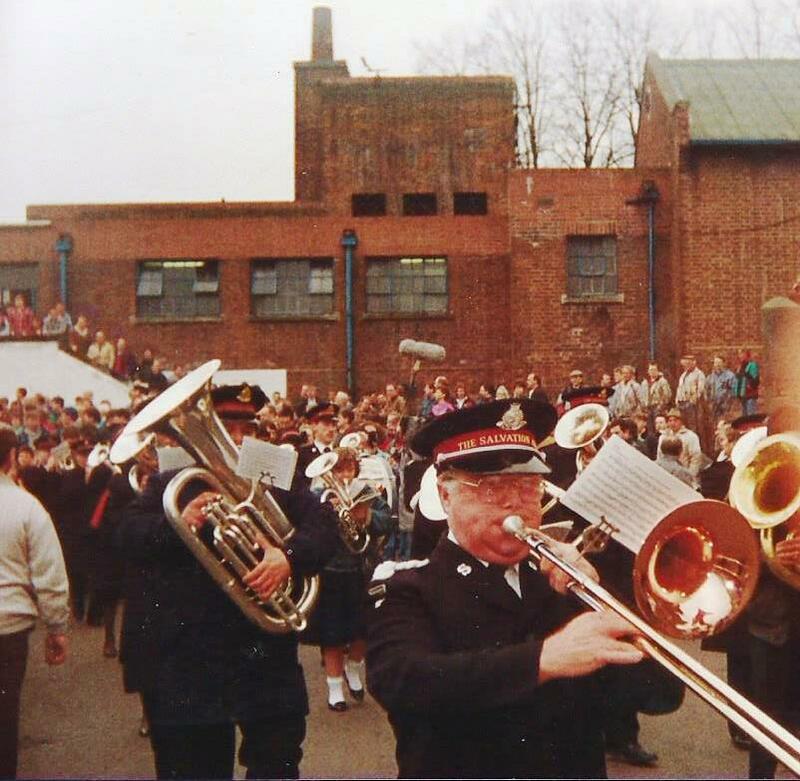 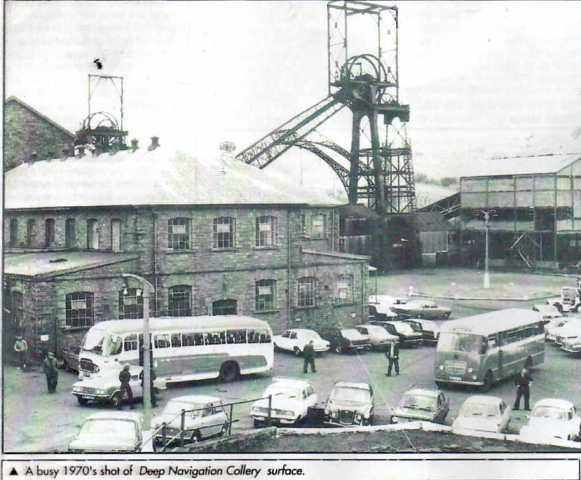 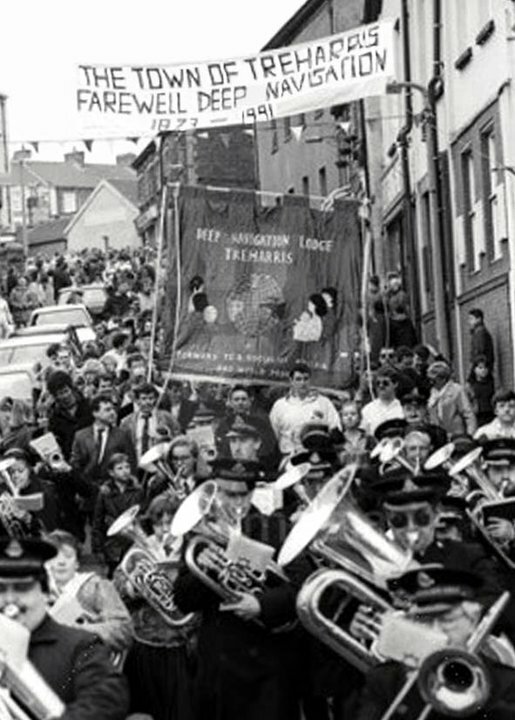 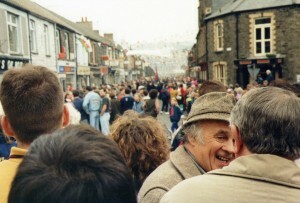 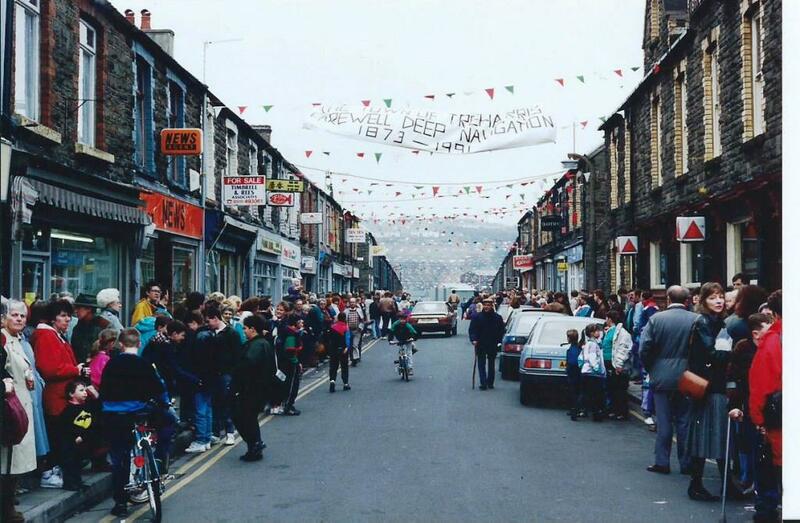 Deep Navigation’s centenary celebrations in 1979 attracted around 2,000 people and included a trip to pit bottom, an exhibition of mining machinery, road races, a balloon race and a brass band concert. 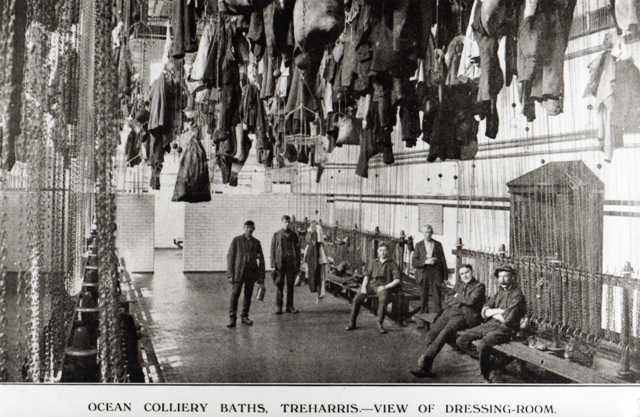 While pit head baths form a natural part of mining life today, it was not always so. 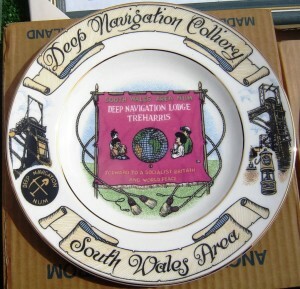 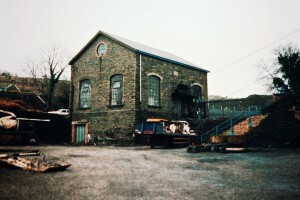 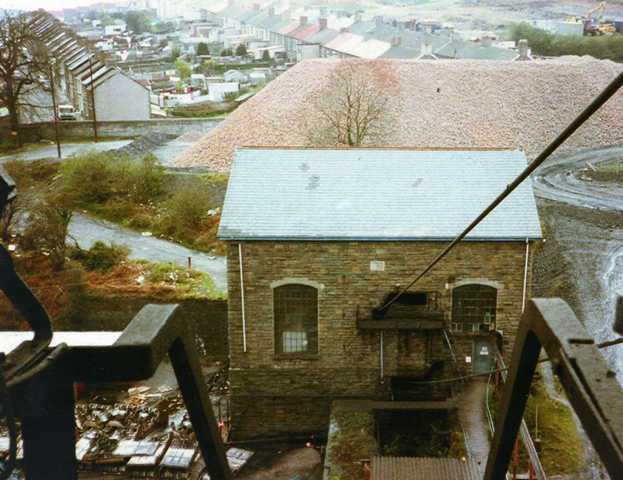 Deep Navigation was the first mine in south Wales to introduce baths for miners. 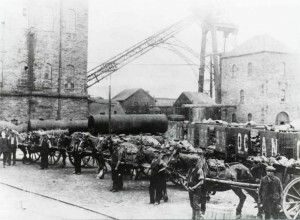 Lord Davies of Llandinam, who launched the Ocean coal company, the former owners of Deep Navigation colliery, sent a party of 15 men to the continent in 1913. 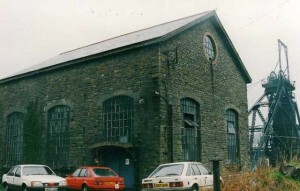 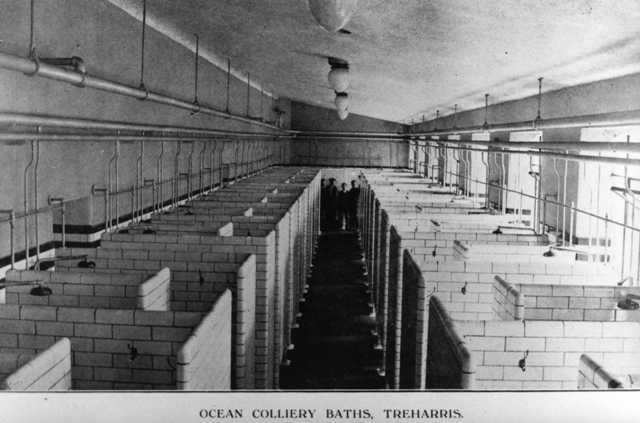 Following their report, Ocean coal built the first Treharris baths in 1916 at a cost of £8,000. 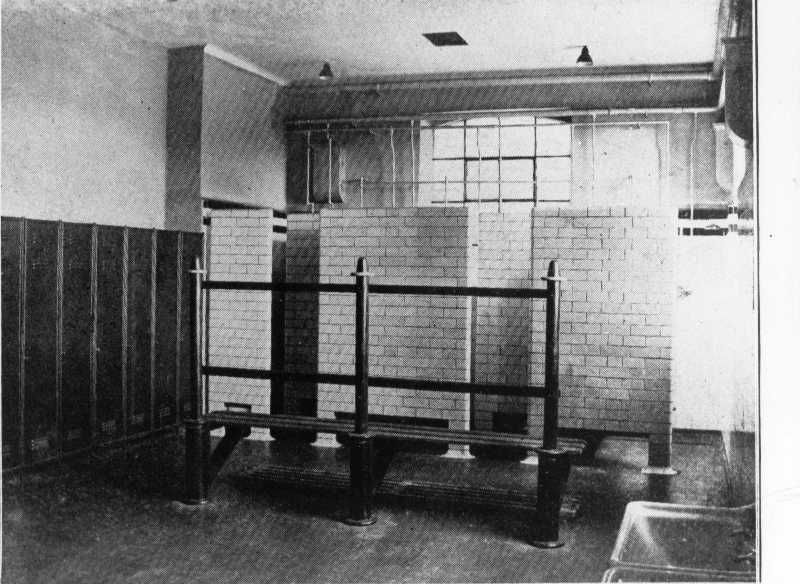 New baths, constructed by messers Nicholls & Nicholls of Gloucester, were officially opened on November 1 ST 1933 BY Mr Thomas Evans O.B.E. of Pentyrch, a director of Ocean coal. 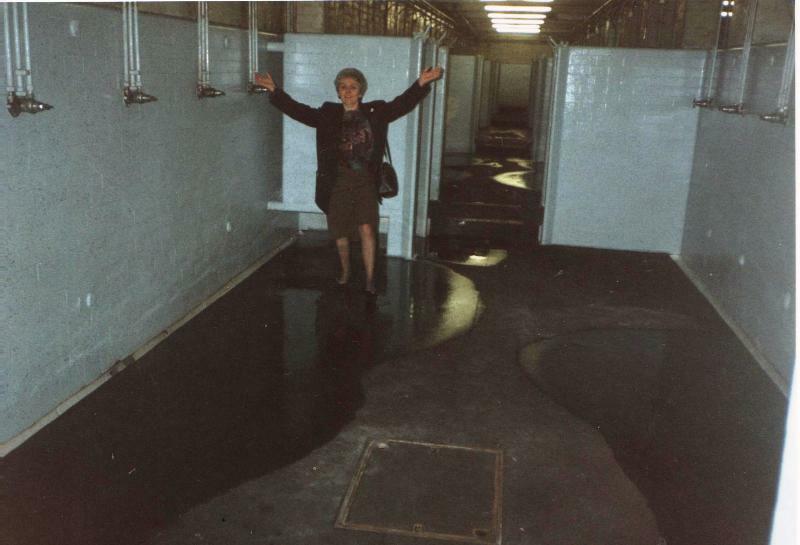 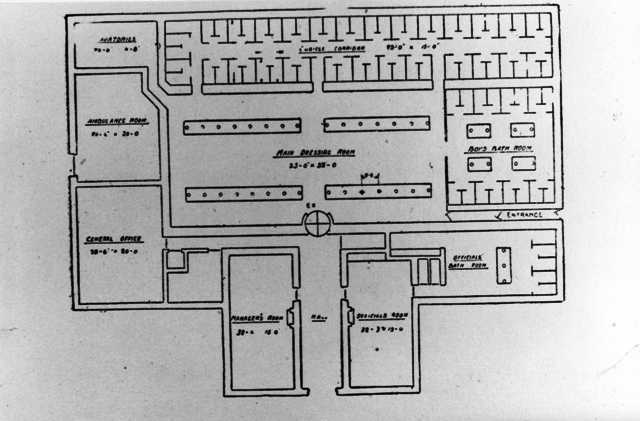 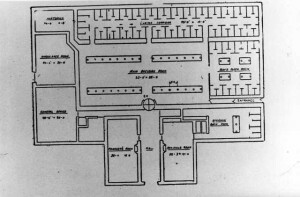 The new baths provided accommodation at that time for 1,824 men, who were provided each with two lockers, one for clean and the other for dirt clothes. A report at the time said “This is a great improvement on the old baths, where clean and dirty clothes hung together on chains in the main hall.” It Continued “The whole building is electrically lit, there is also an up to date lavatory accommodation and a marvellous machine which cleans the men’s boots by electricity.” The reconstructed baths in 1933 were the 18 Th in Wales and the 121st in the whole country. 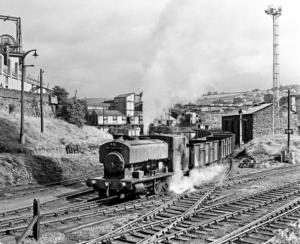 Ocean coal had at that time provided baths at Risca, Wattstown, Lady Windsor, Garw, Nantymeol and Nine mile point collieries. 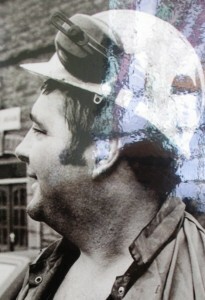 Councillor Enoch Morrell. At the same opening ceremony said “he was pleased to see so many ladies present.” The baths meant a lot to them. They stood for cleaner homes and a higher standard of life. 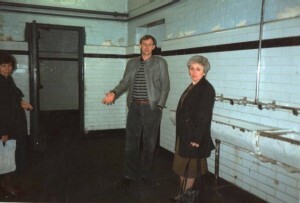 He appealed to the women to use their influence with the men that they should patronise the baths. The Rest of the pages below are a large collection of photographs featuring the Deep Navigation pit, I have tried to put them in a chronological, order oldest to youngest, but may have made a few errors, basically the older photos will appear first. 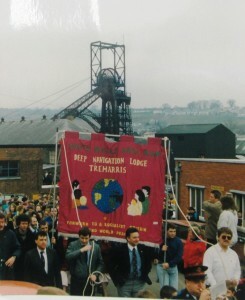 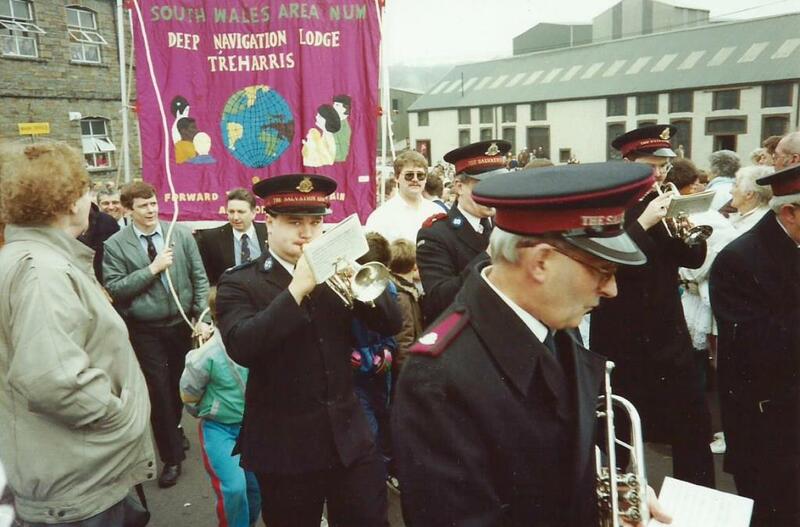 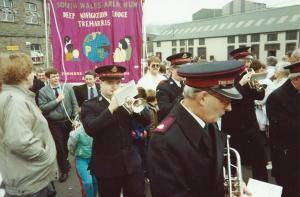 Many miners marching behind the magnificent, new, South Wales area N.U.M. 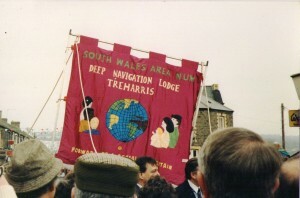 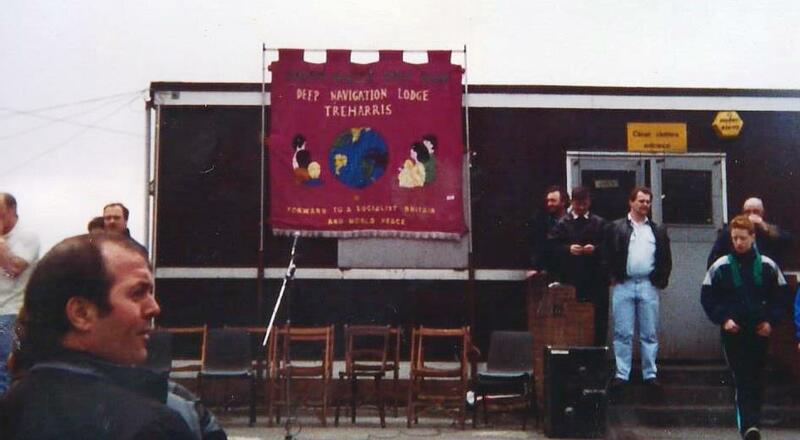 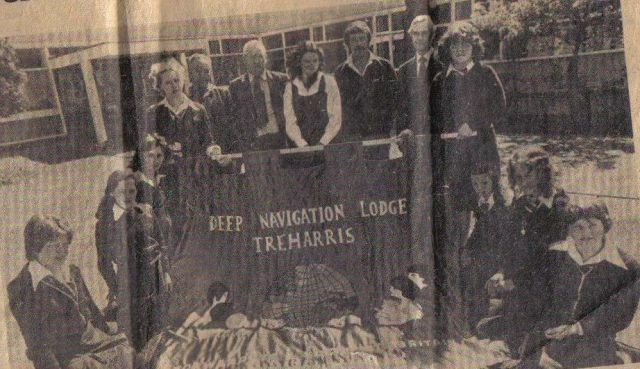 Deep Navigation Lodge, Treharris banner, in the South Wales miners’ Gala in Cardiff last Saturday will nave gazed with pride on the work of their own, or neighbours’ 14 year old daughters from Afon Taf High School, Troedyrhiw. When, only a month ago, Councillor Vernon Davies approached headmaster Mr John Isaac, to investigate the possibility of the school providing the urgently needed new banner. Pupils of Form 3 c begged their needlework tutor, Miss G Bound, to be allowed to carry out the exacting work, since they were so closely associated with the lodge. For the ensuing month, Sharon Arthur, Alison Cowdell, Donna Felton, Sharn Ford, Jennifer Hares, Pamela Phillips, Denise Pope, Karen Richards, Julie Veale, Dawn Watkins and Melanie Wiltshire dedicated their lunchtimes to the work and even offered to give up their holiday time to ensure the ten foot banner would be completed in time for the June 10th parade. 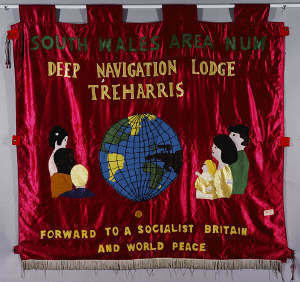 Working with very difficult fabrics, the girls supervised by Miss Bound, applied and embroidered every letter and symbol separately on to the cerise background; repeating the detail identically on the reverse side. 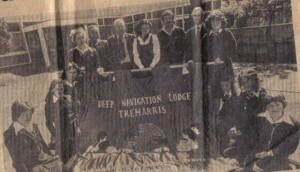 On Friday, June 9th , lodge Chairman Mr John Hawke, vice Chairman Mr R Tanner and secretary Mr B Jones were called to Afon Taff High School to receive the new banner, which will not only symbolise the dedication of the miners to their difficult task but that of our often maligned modern teenagers. 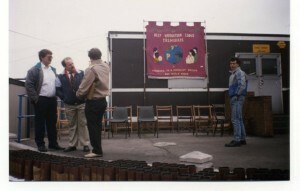 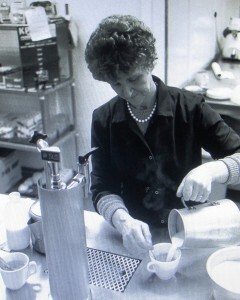 Below we see photographs donated by Alan Davies 1985 approx. 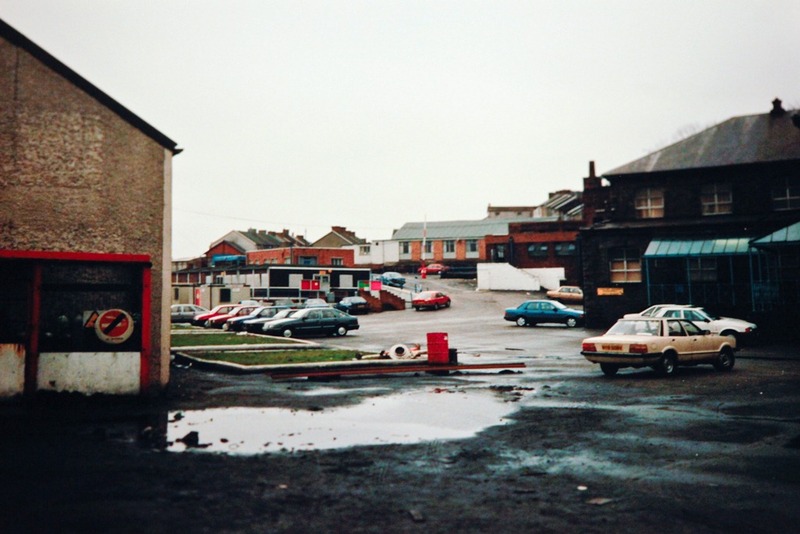 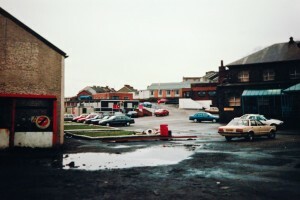 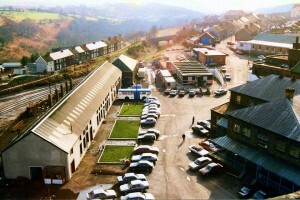 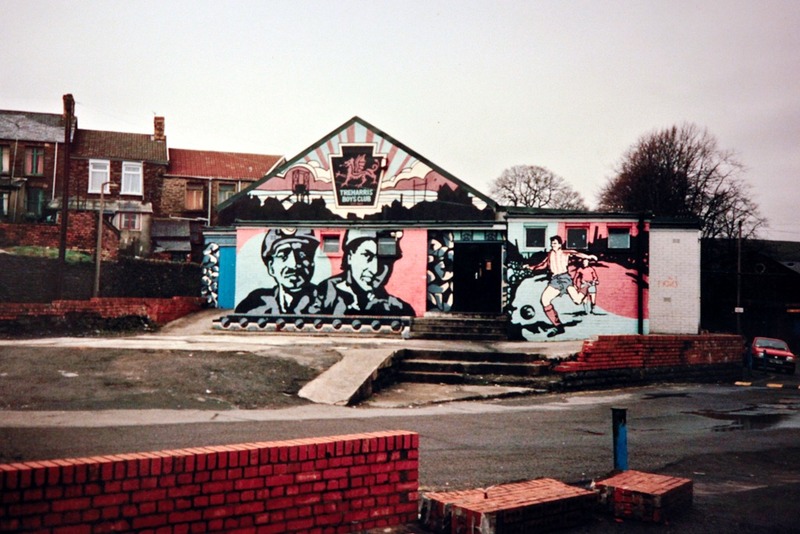 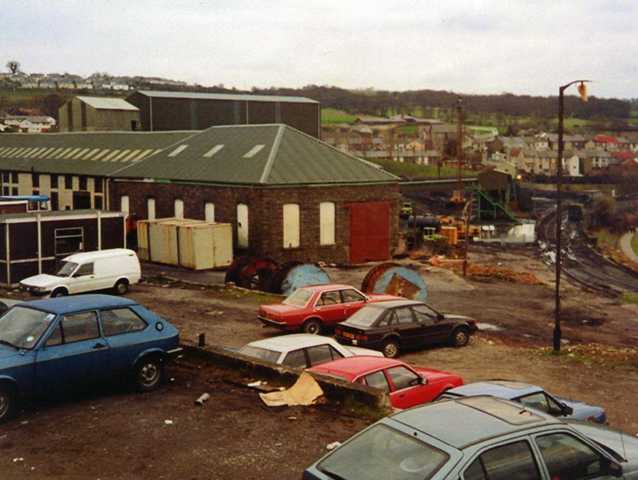 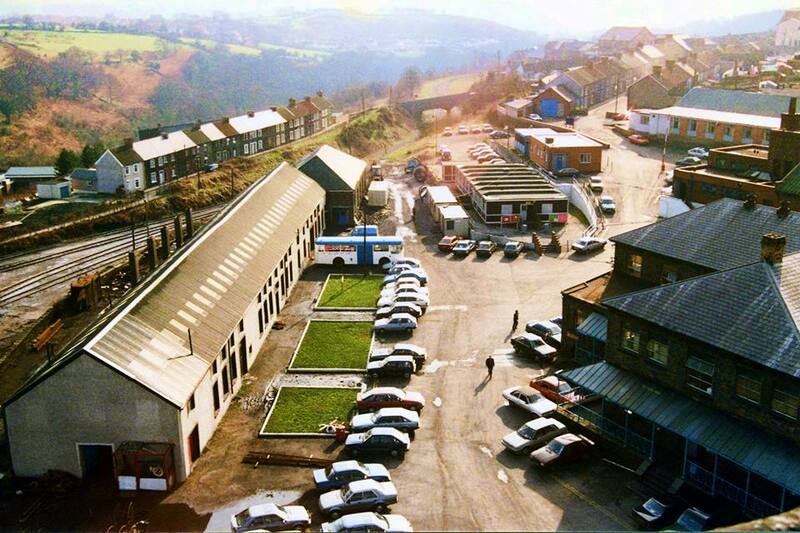 The pit canteen , car park, the boys club, all of which is now a new clinic and a new one way road system…so different from 1990 when this was taken. 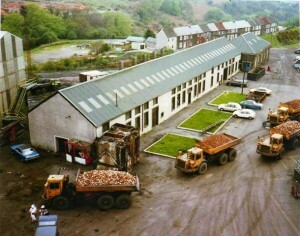 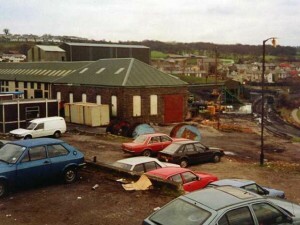 Pictures above of Supply yard. Above we see some of the huge machines that powered the pit. 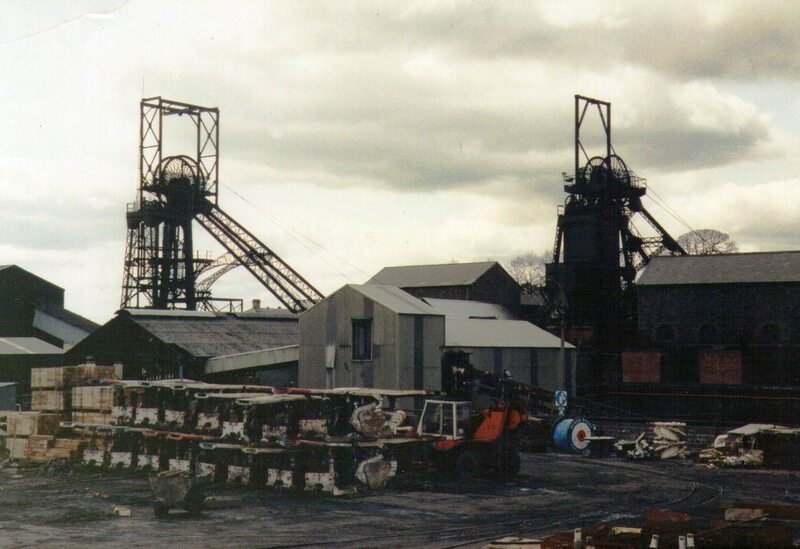 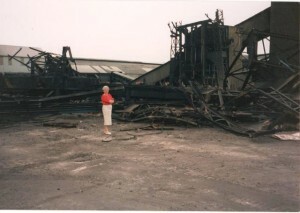 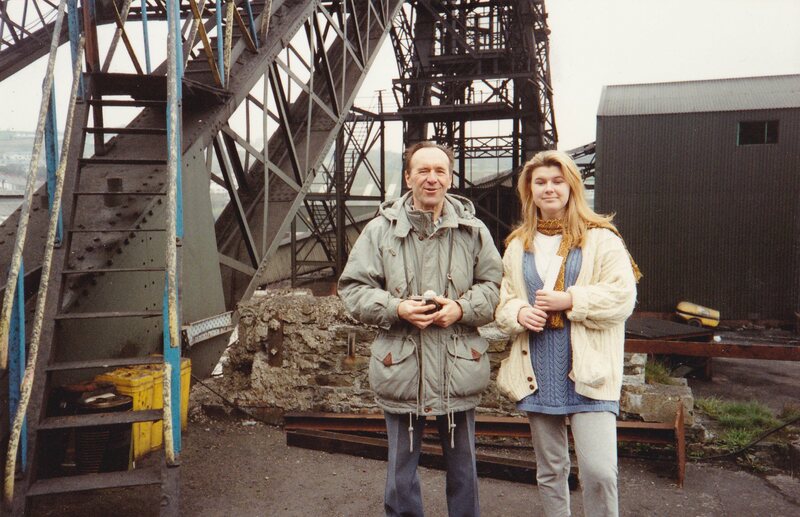 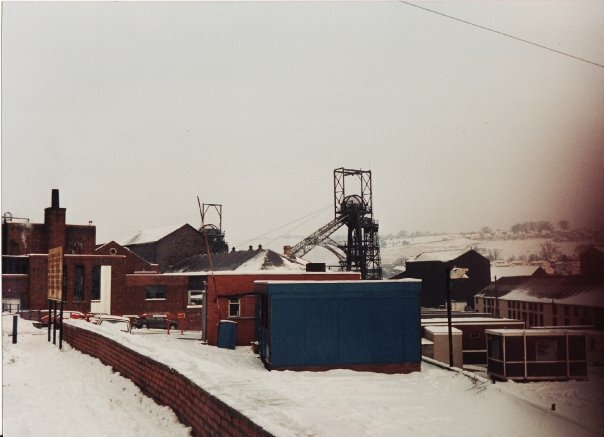 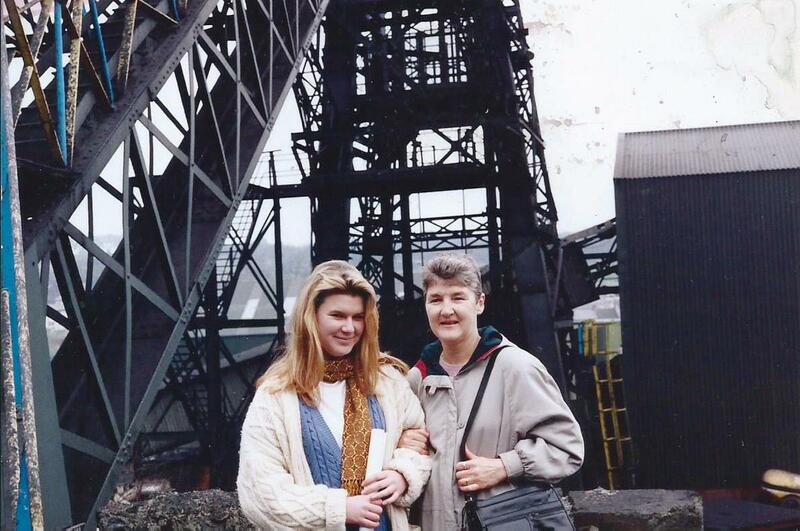 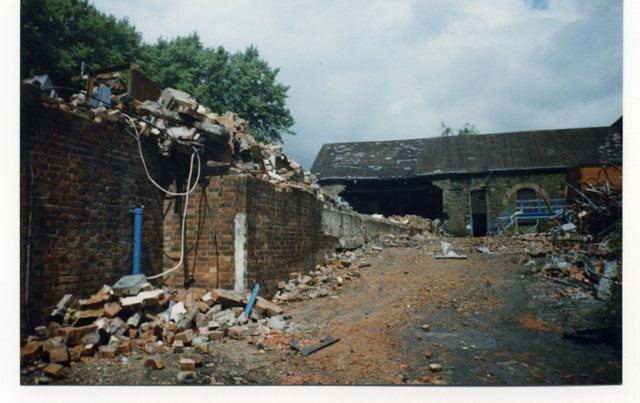 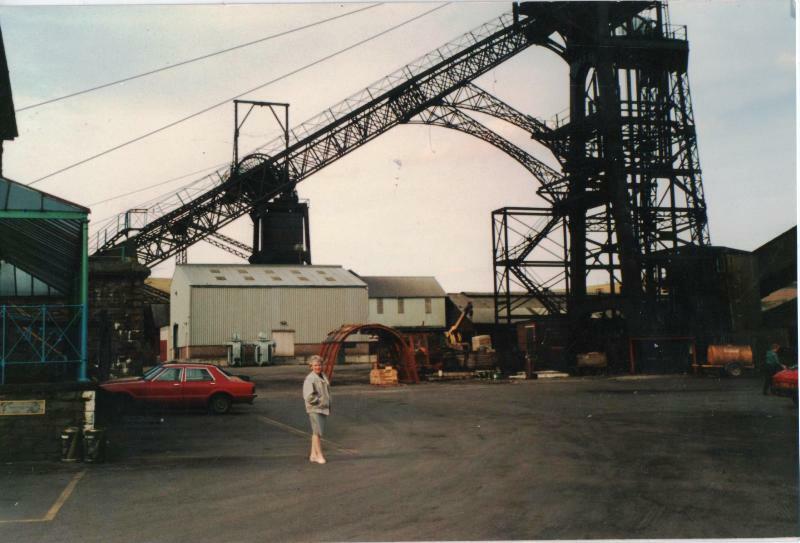 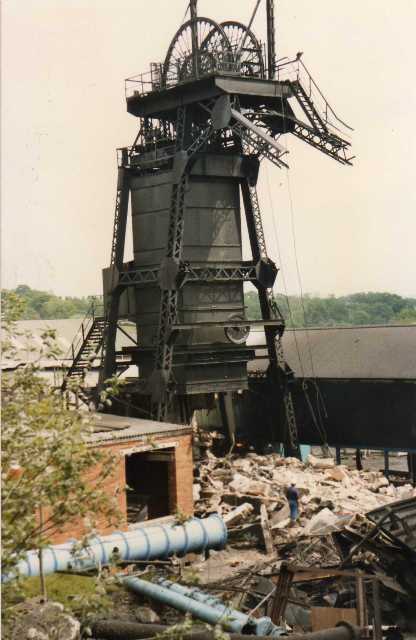 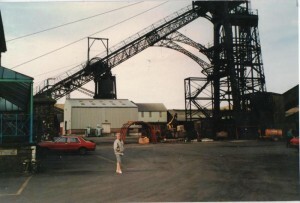 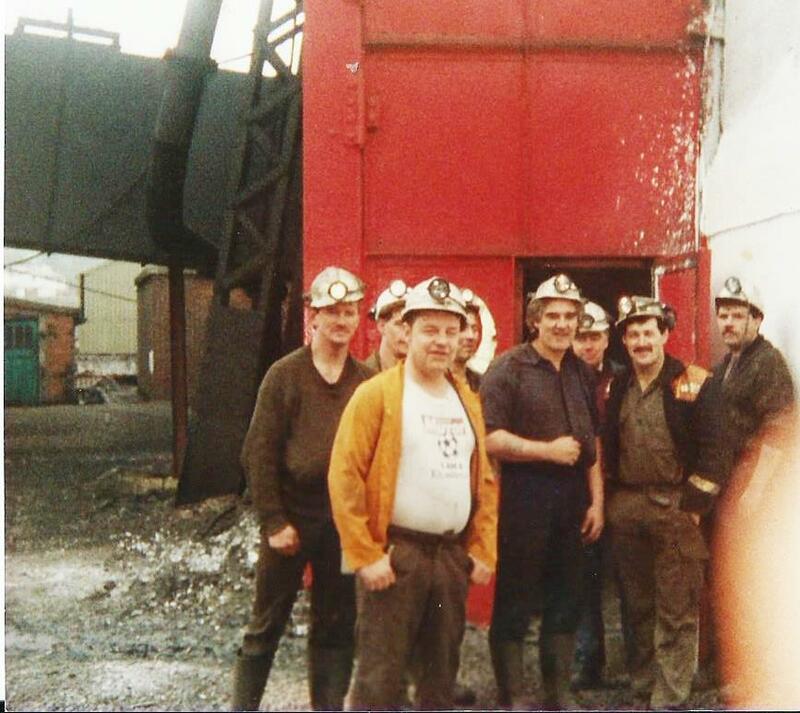 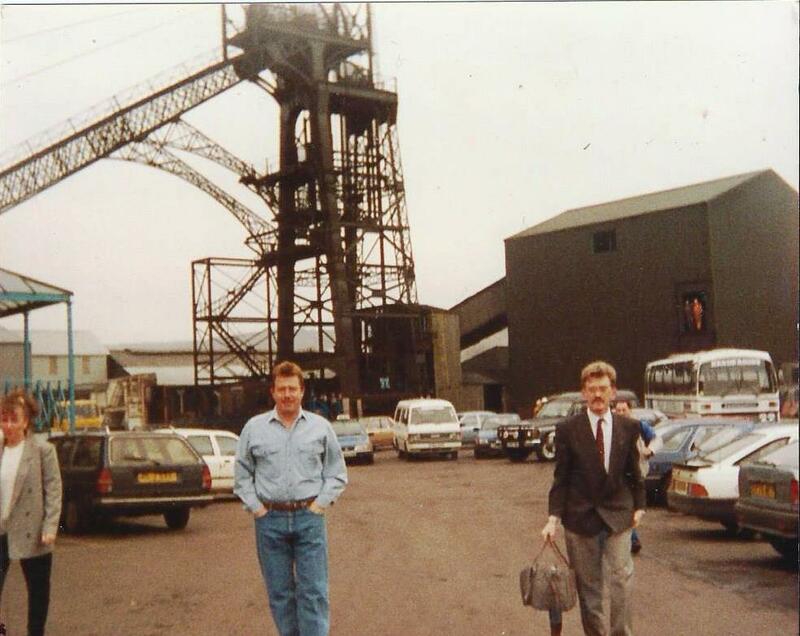 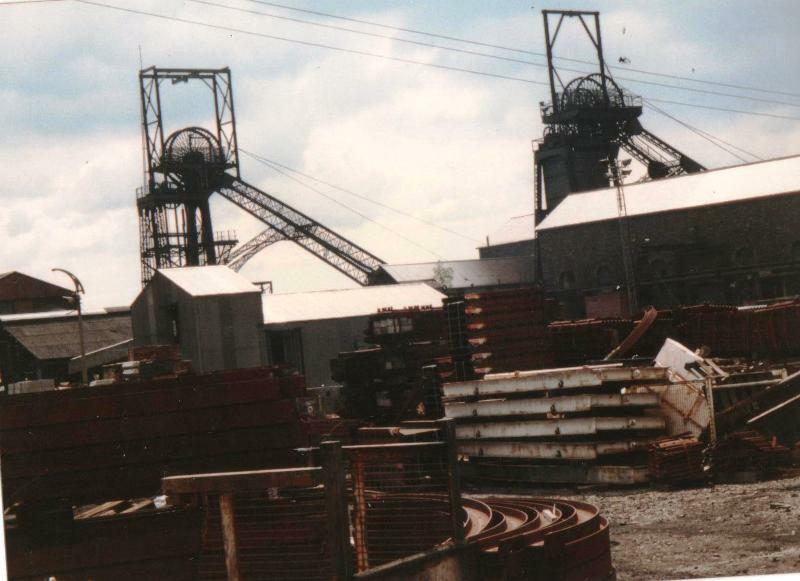 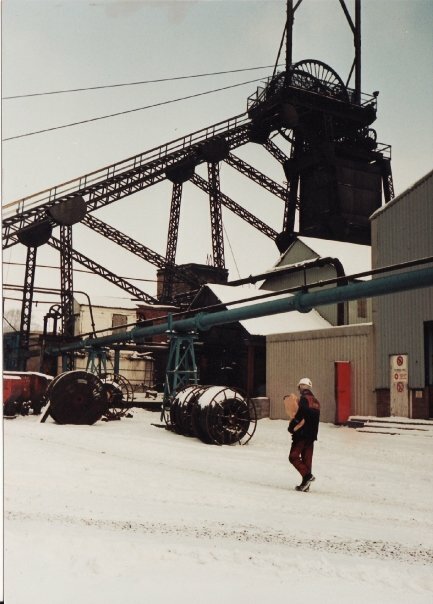 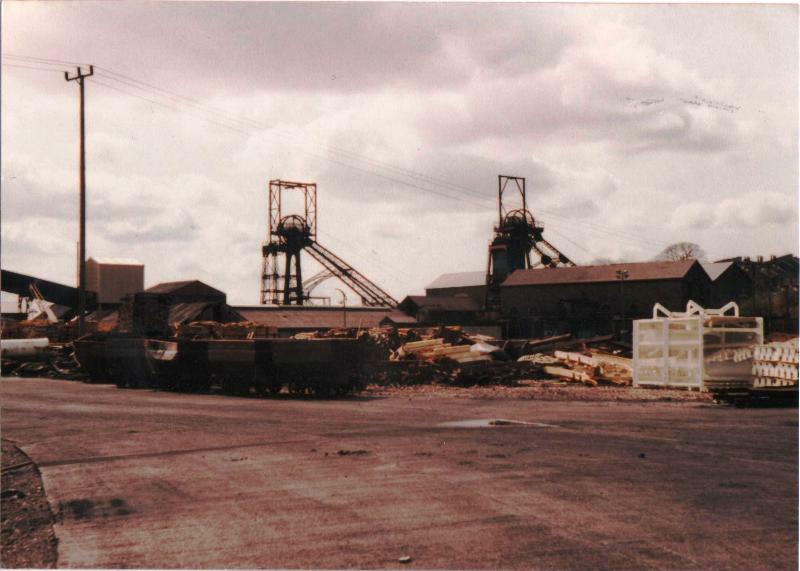 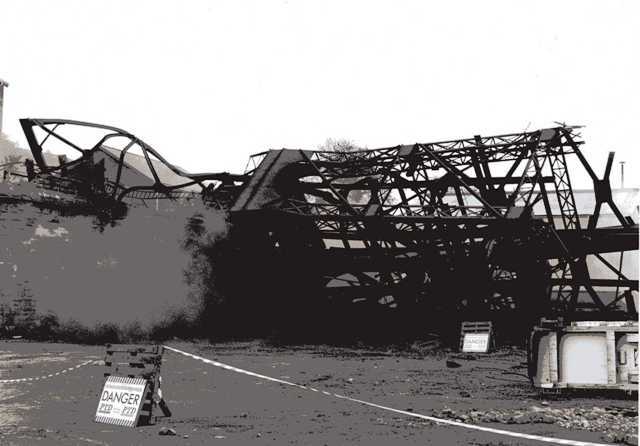 The Final days of the Colliery were sad days and we have lots of photographs from 1990-91 Firstly we will see the weeks after the the pit was closed for production, there was still a lot going on there and many visited the site before it was demolished. 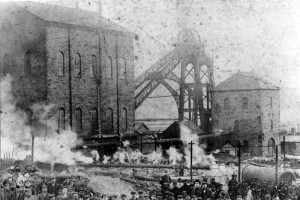 There was a day of Celebration in the streets of Treharris which we have some photographs of and then finally we see the colliery demolished.